It’s been an exciting week. After weeks of practice the children finally got to perform in front of a live audience and those of you who had the pleasure of watching would agree the children were super. With all this going on we are still keeping our focus on Maths and English. Our Myths are progressing as we are trying to write these in sections, for example, introduce character, describe setting, write about the challenge. 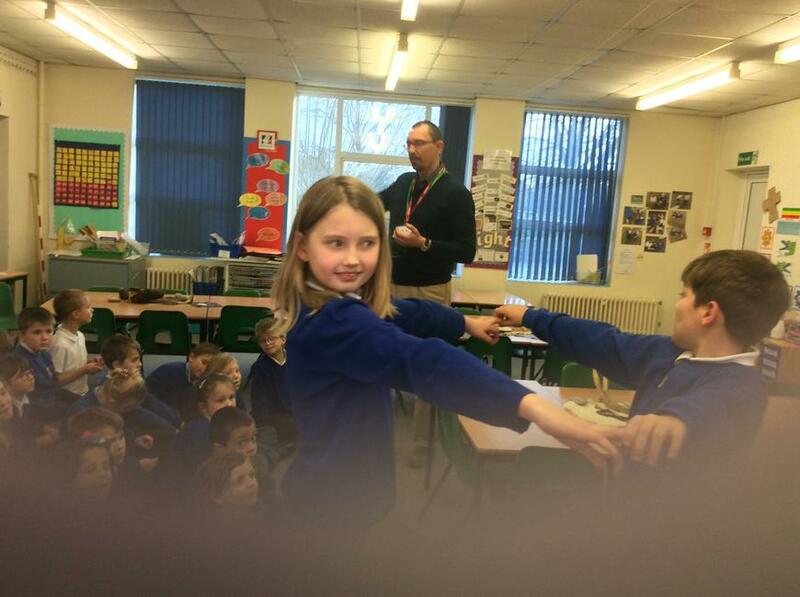 In Maths we have been doing directional turns, for example quarter turn clockwise. You can practice this at home by playing a Simon says game. Simon says “half turn anti-clockwise”. 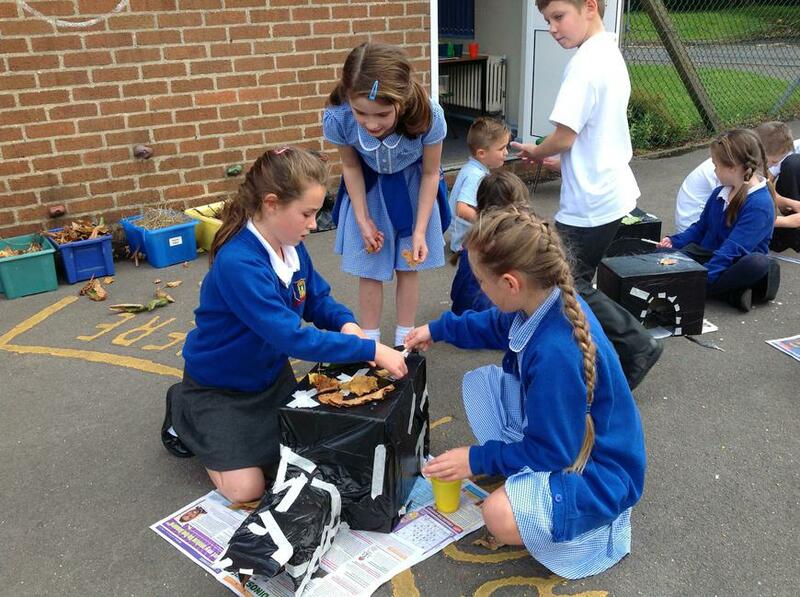 Please make sure children are bringing in water bottles as this fantastic weather continues. It’s important that the children come to school in sun cream and also bring a hat to wear during playtimes and outdoor PE. 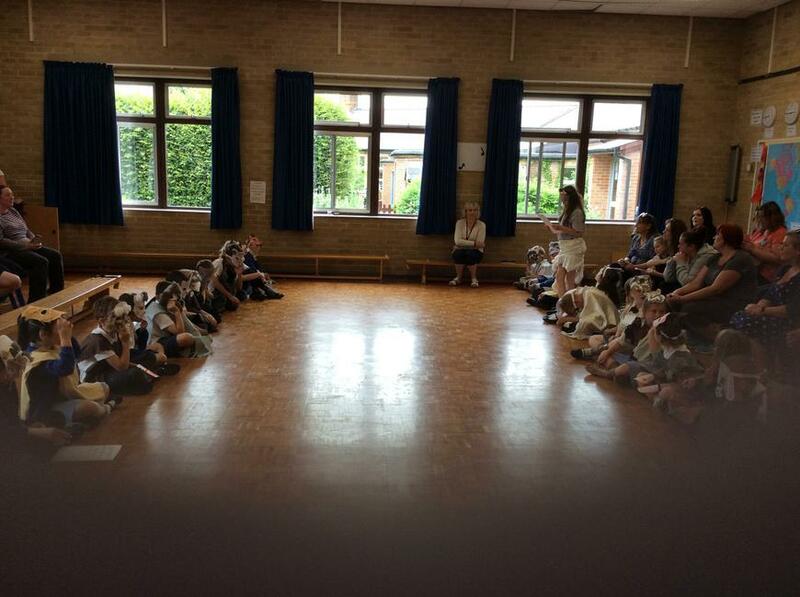 What an end to a scorching week, well done to the children for taking part in Sports Day. It was so hot that It was decided that the races would be cancelled. The performance is nearly upon us. 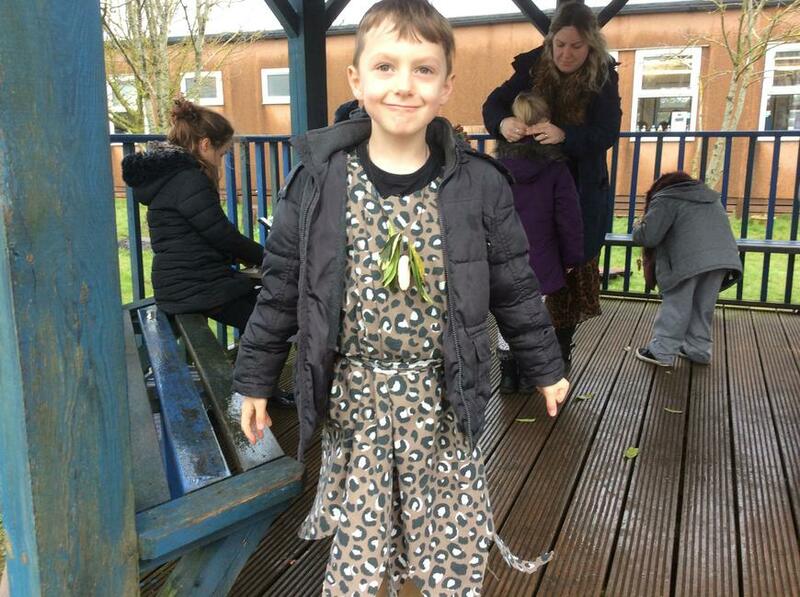 Please remember that the children need to wear shorts/trousers and a plain t-shirt. Tickets are now on sale so don’t forget to order yours. The healthy lunch challenge for next week is Protein. 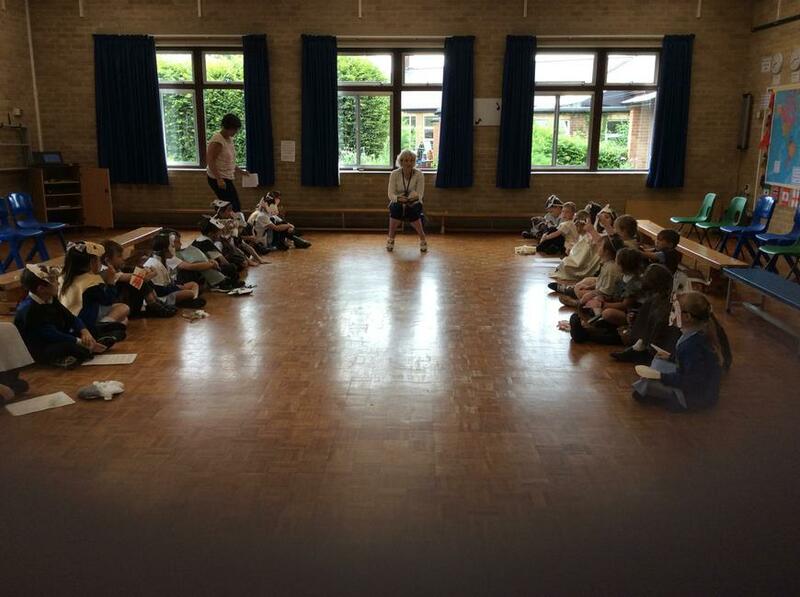 During the next week children will be performing their poems to the class. If a child needs a poem please ask them to speak to us on Monday. It would be really helpful if you can provide a bag for your child to start bringing work home. It can be a named carrier bag or a canvas bag. Have a good weekend and remember for keep Sun Safe. Half way through this final term already! 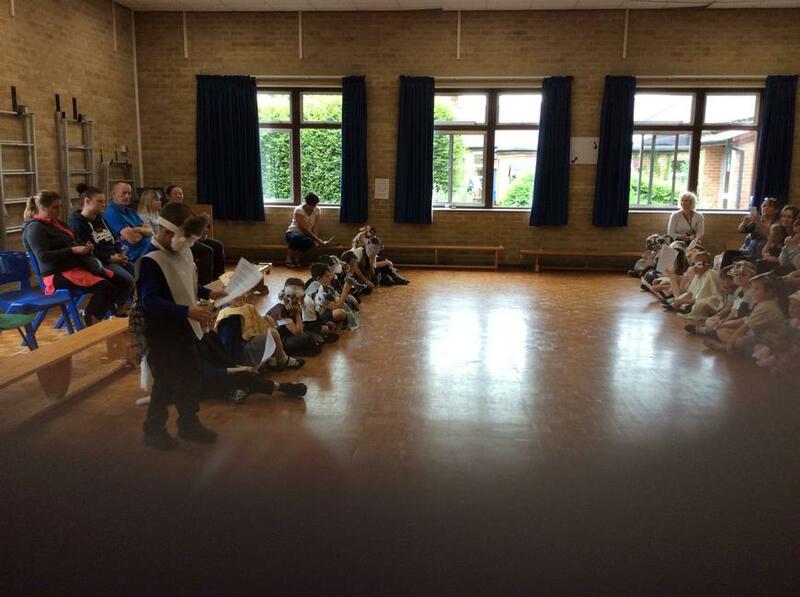 This week we have been working extremely hard with learning the song words for the upcoming production. For those of you that were lucky enough to come to the Recorder and Violin Concert on Thursday, we are sure you would agree the musical talent is an inspiration to us all! 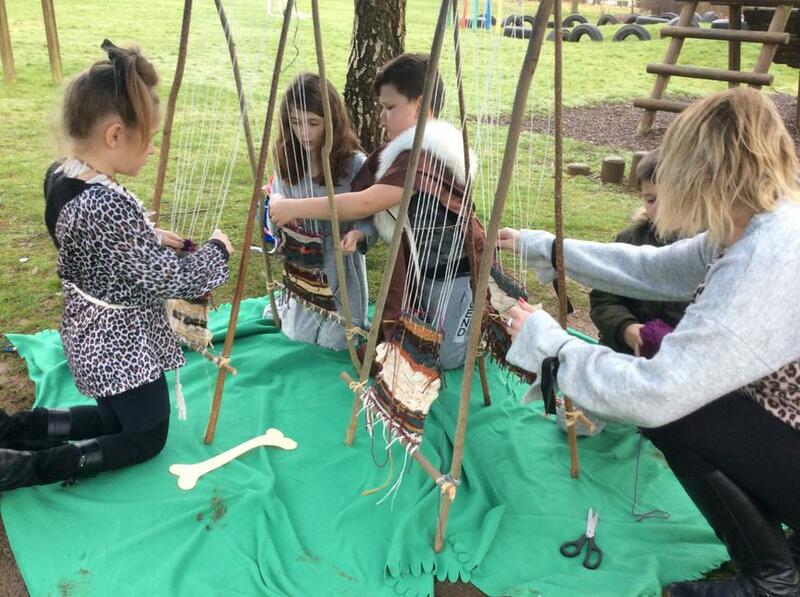 It never ceases to amaze us how quickly the children pick up playing an instrument. 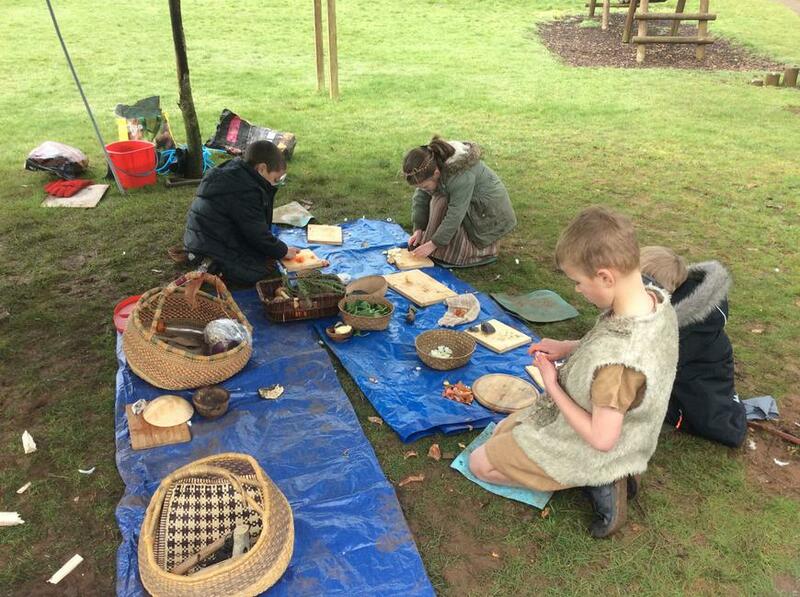 Alongside all our extra curricular activities classroom learning is still continuing. 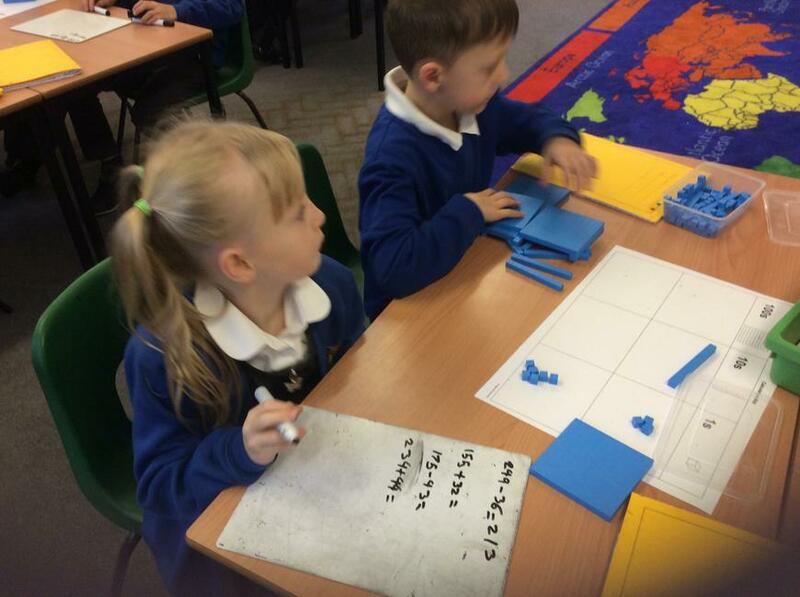 In Maths we have been looking at minutes past/to the hour. We have discussed where precise time would be used e.g train times or cinema. Please practise telling the time with your child at home as this will really help them with their classroom learning. As part of our English Myth planning the children have so far written a short description of their character for their own and have been looking at describing different settings. 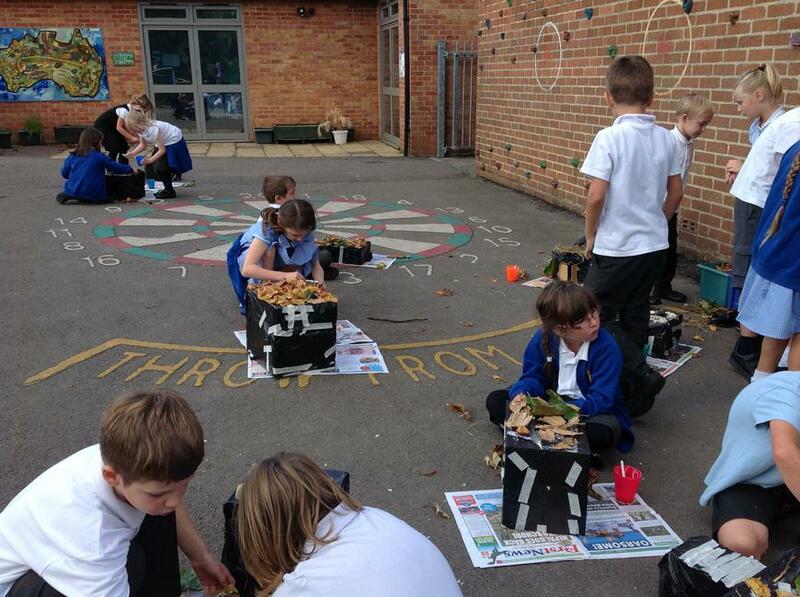 This will help them to plan and write their own myth over the next 2 weeks. 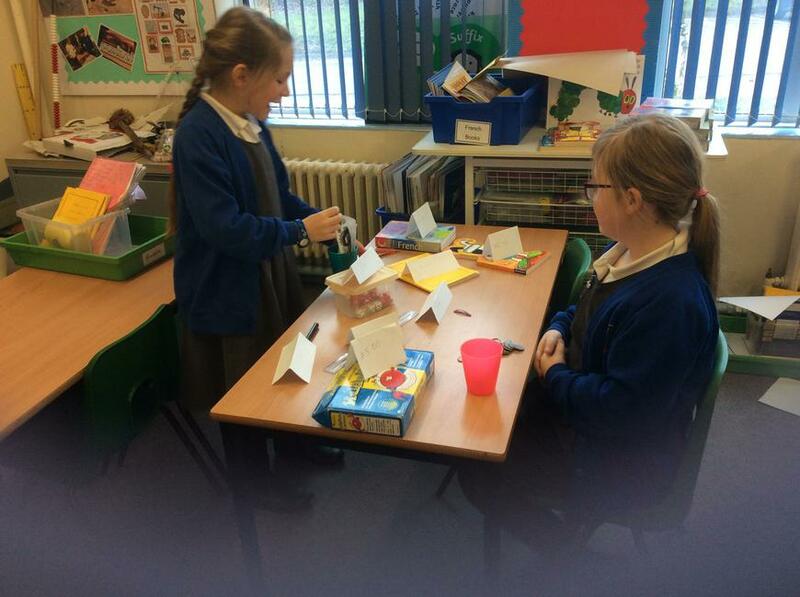 They are all enjoying using their imaginations and creativity to challenge themselves to use higher level descriptive vocabulary. 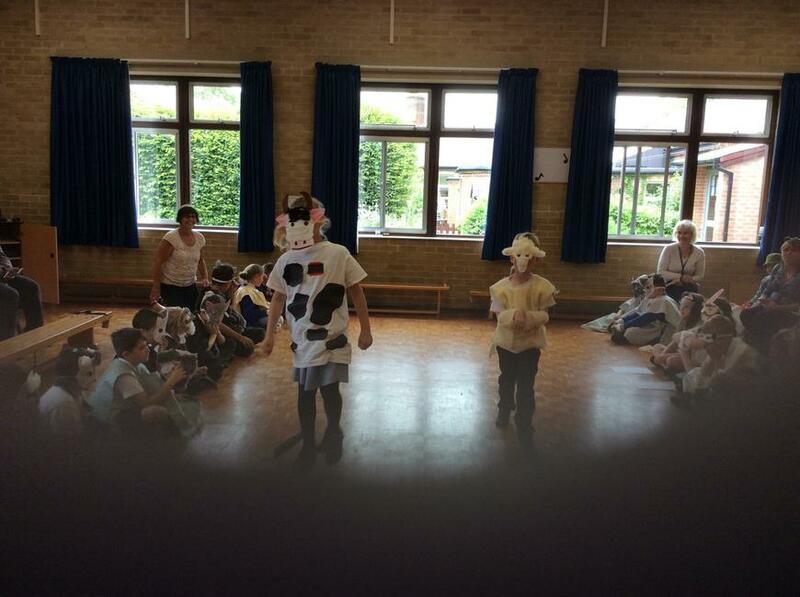 Next week as part of our Healthy eating we are all going to try and include a dairy product in our lunch box. Thank you for supporting us with this challenge. Please make sure children are coming to school with a named water bottle and sun hat and that they have applied sun cream. We are reminding them to drink regularly and are encouraging them to play in the shade for some of their playtime in this very hot weather. Sports day Morning - Friday 06 July - we look forward to you joining us if you are able. We have been so impressed with how the children are coping with the singing practice for the KS2 production. 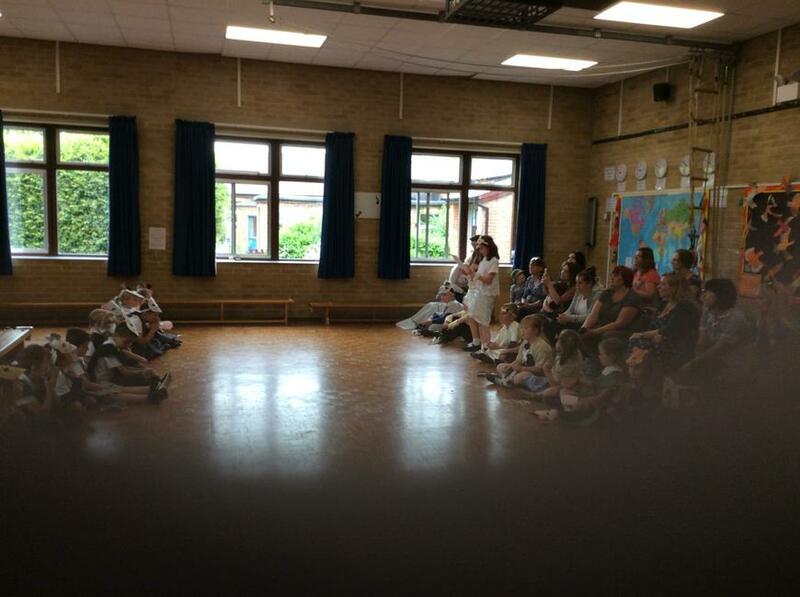 This is a very exciting opportunity for all children and all children have the song words to practice. 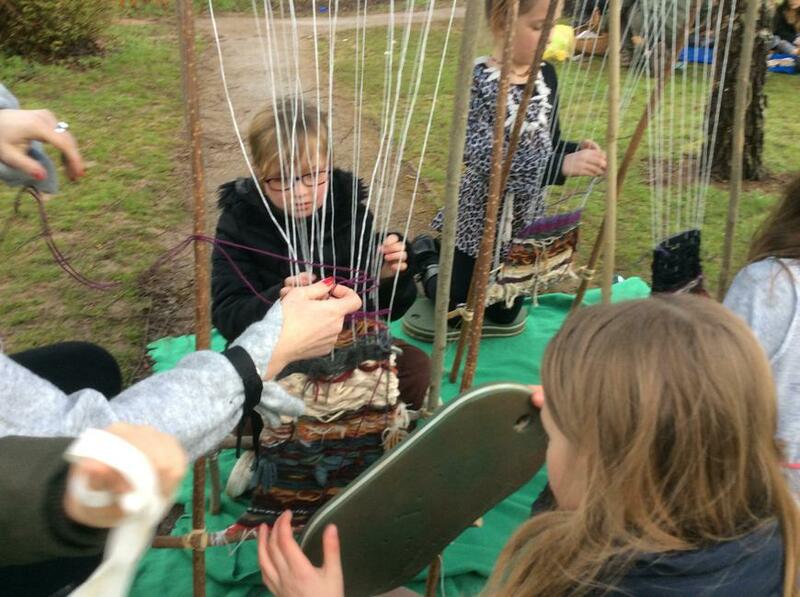 It also gives children experience of what it takes in putting together a big production and the importance of their role. 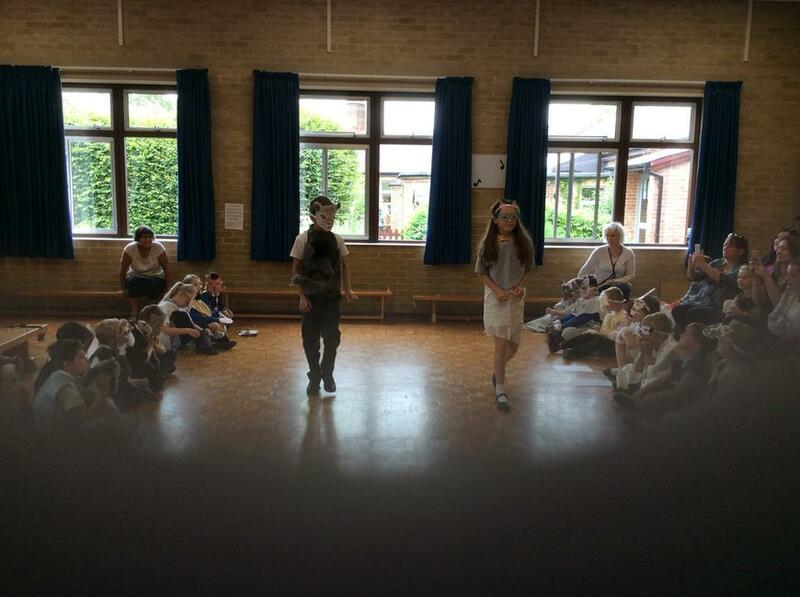 As part of the experience the children will take part in the evening performance. Please send in the green slips giving permission for your child to take part. 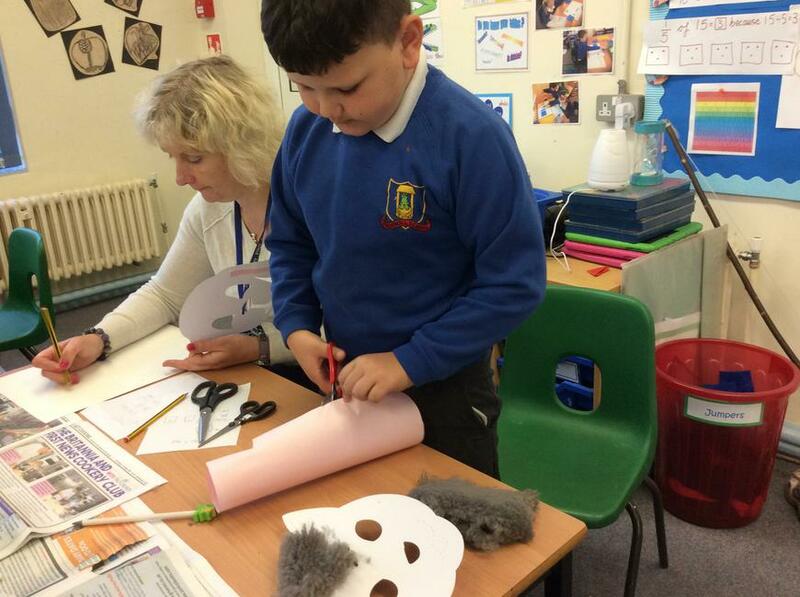 In English, imaginations were in full flow as children designed and described their monsters as part of our Myths and Legends learning. 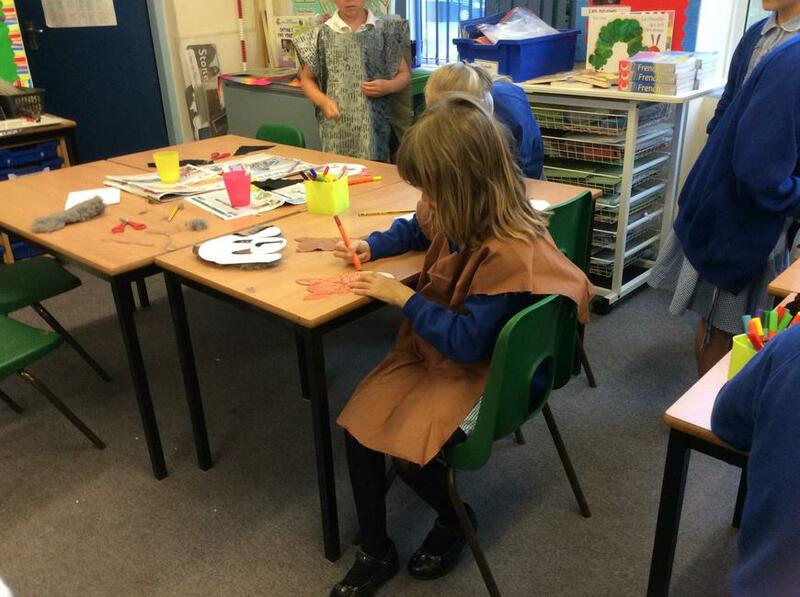 We have been learning how to tell the time. Keep practicing by asking your child to read an analogue clock by introducing half past, quarter past and quarter to first and then adding in other minutes to and past. If unsure please come and see us. This is a life skill that everyone needs. This week the lunch challenge is Fruit and Veg. Thank you for your support in helping your child make a healthy choice. As the weather is warming up, please ensure children are coming to school with suitable sun protection, a hat and water bottle. 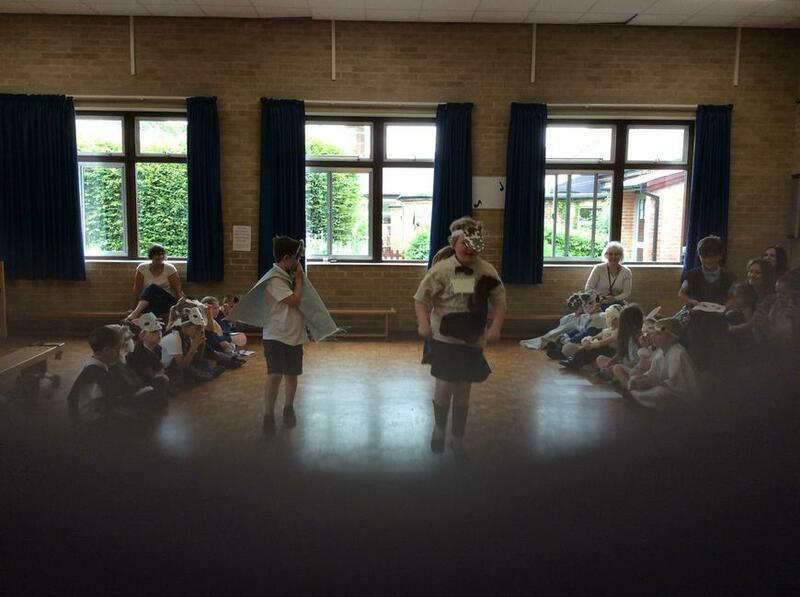 We are continuing with looking at Myths and Legends as part of our English learning. 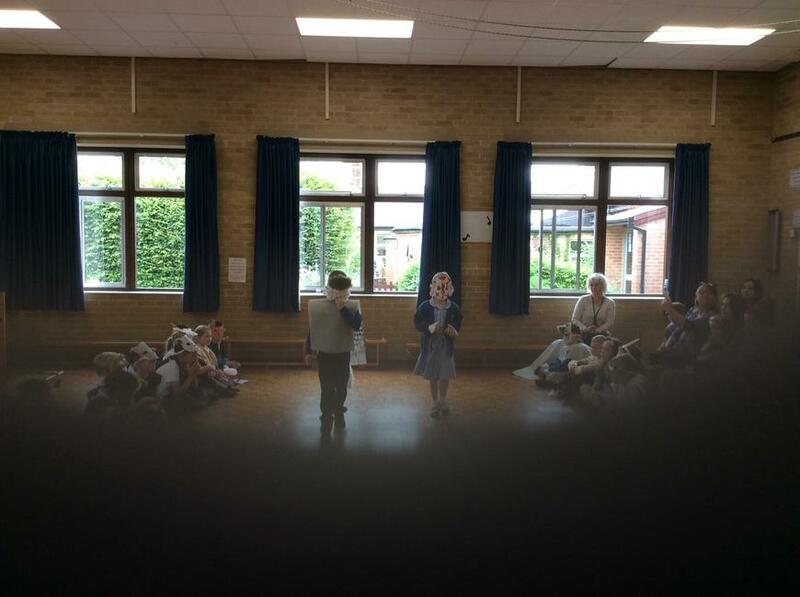 The children are learning songs for an exciting forthcoming production (more details to follow soon). Our class are trialling a healthy eating plan and if it proves successful we hope to launch to the whole school in September. 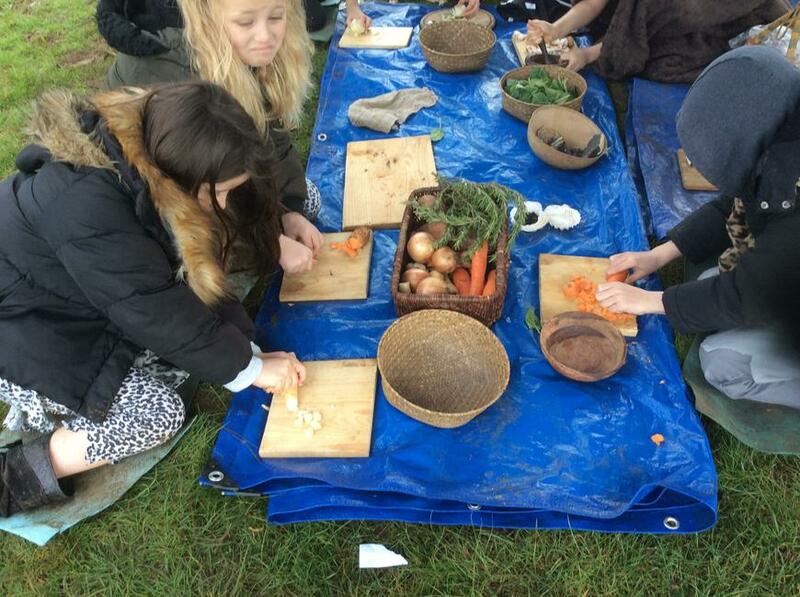 Your support would be much appreciated as it helps adults and children learn the benefits of healthy eating. Our focus for next week is Carbohydrates. 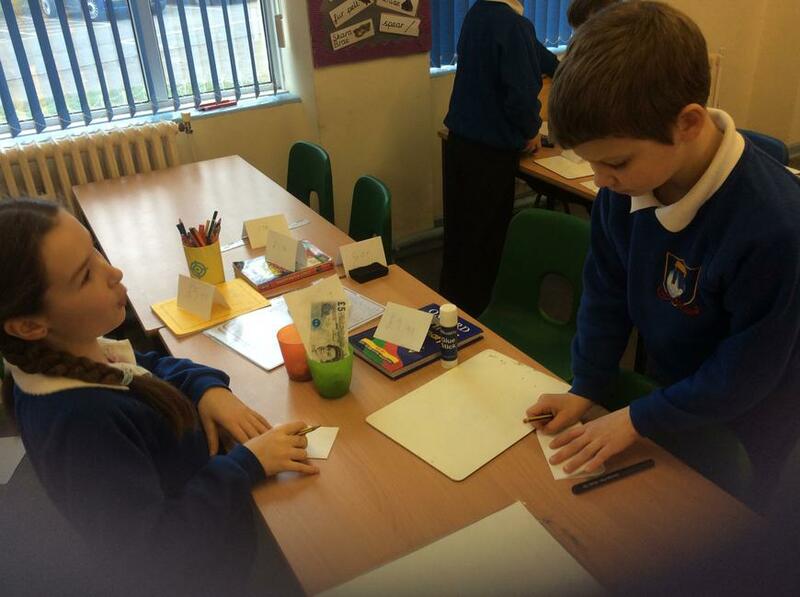 Our Maths learning on fractions has ended for now and we are going to learn about Time over the next few weeks. Please work on this with your children at home to help them. Ask them to the tell the time during the day as the more reinforcement that they get with this will support their classroom learning. Please continue to support your child with home learning and reading. 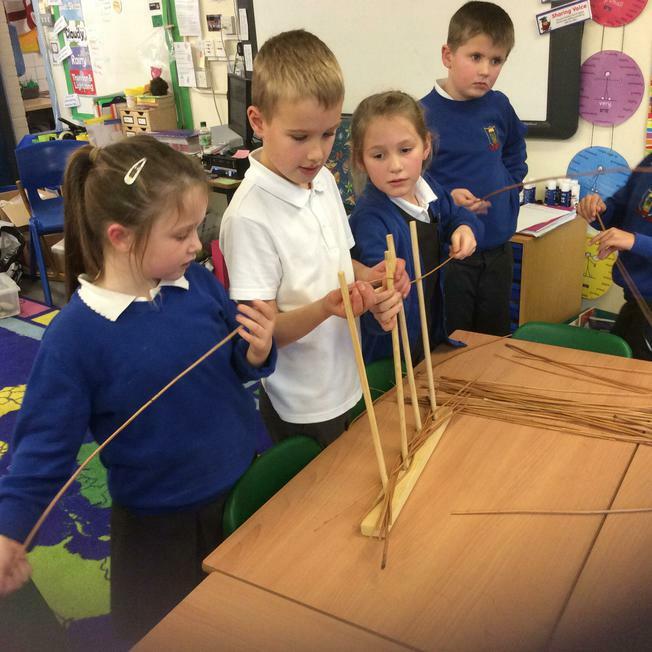 It helps reinforce their class learning. Any problems or questions with this please come and speak to us we are happy to help. 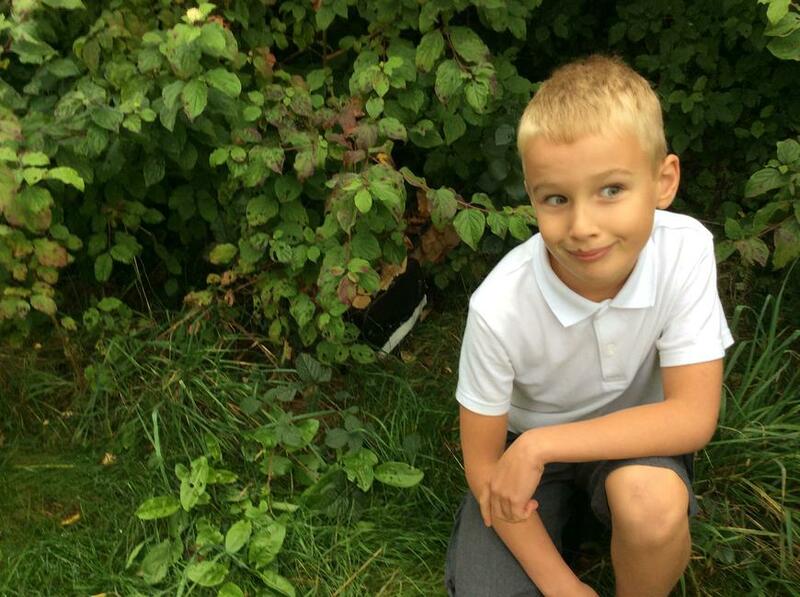 Can you please ensure your child is in the correct uniform with black school shoes. The only jewellery that is allowed is stud earrings and a watch. No other jewellery is permitted. Also no tattoos of any sort are permitted. 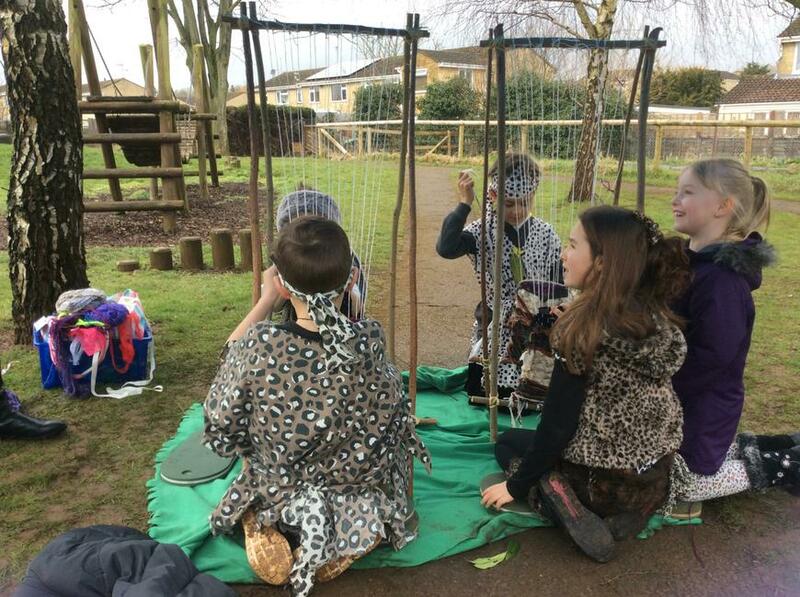 We are encouraging the children to be smartly presented as this gives them the correct attitude for learning and teaches them to take a pride in themselves. 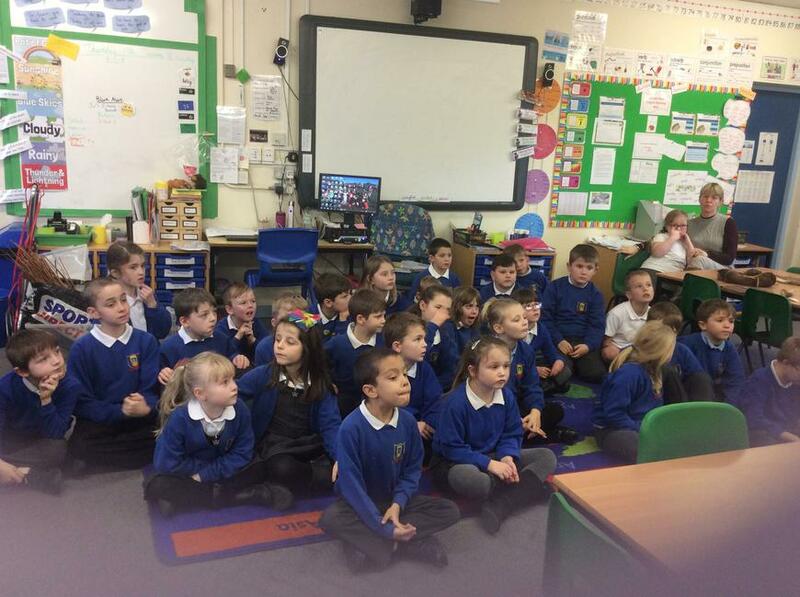 Week 1 has flown by and we are now in the final term of Y3. 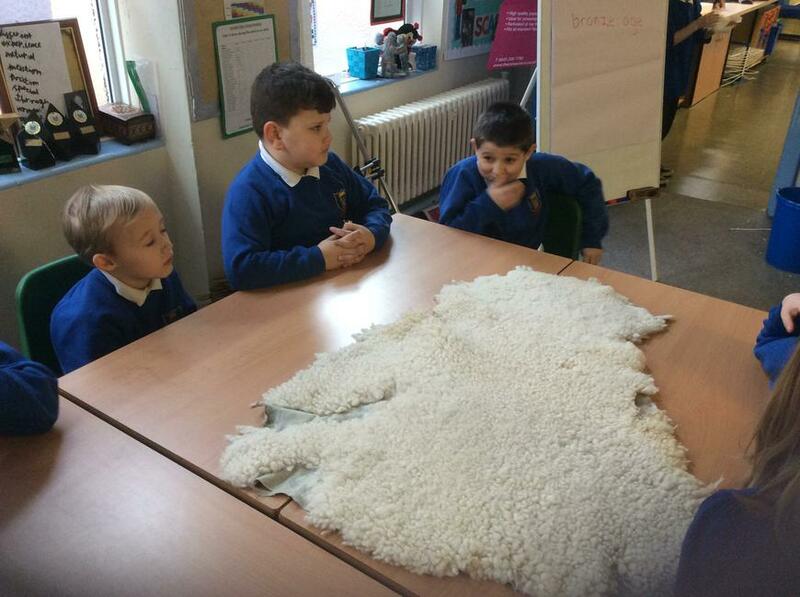 This term the children are looking at myths, legends and fables. There was a lot of enthusiasm when this English topic was introduced in the week. 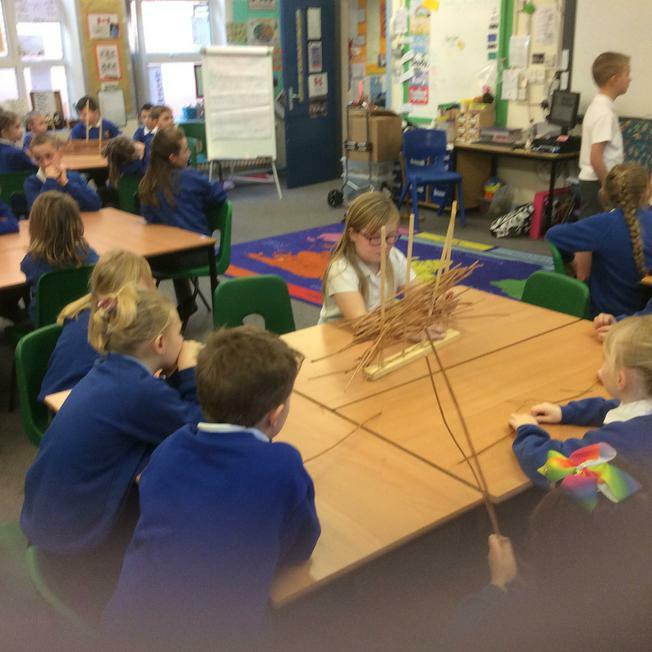 We started the topic by reading Kuang Li and the children then did role play in small groups. 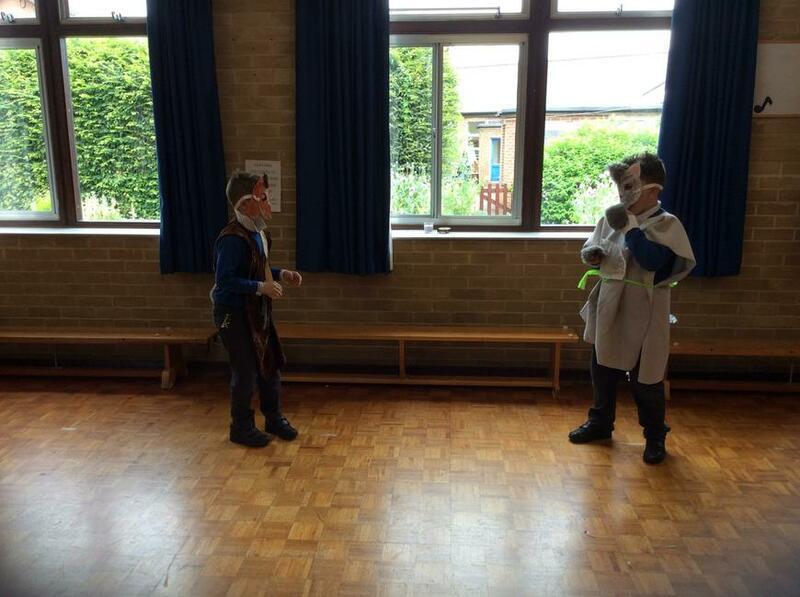 We have some great actors in our class. 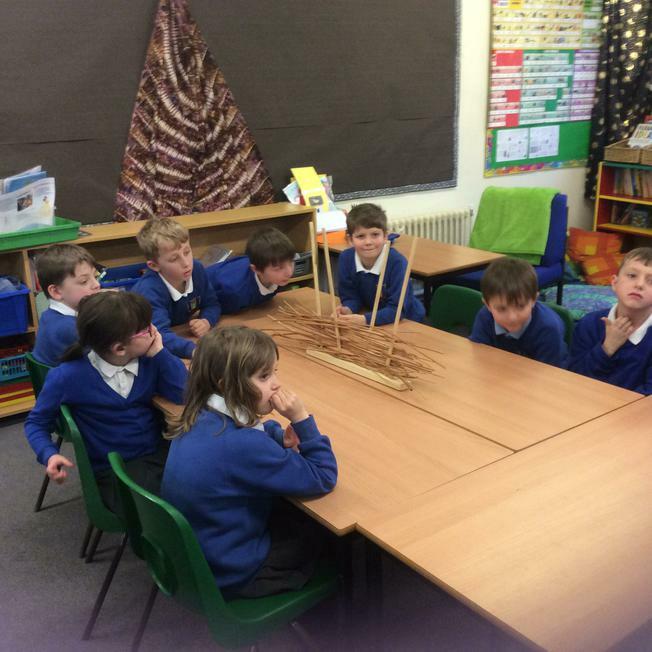 It’s great to see children are progressing with their X tables in the ‘Club 66’ challenge. Well done to Anais, Riley G and Cairon who have all moved up to the next level. In Maths we have been looking at equivalent fractions as we come to the end of this topic. To reinforce the learning please discuss half and quarters with the children and see if the can see any relationships in fractions. 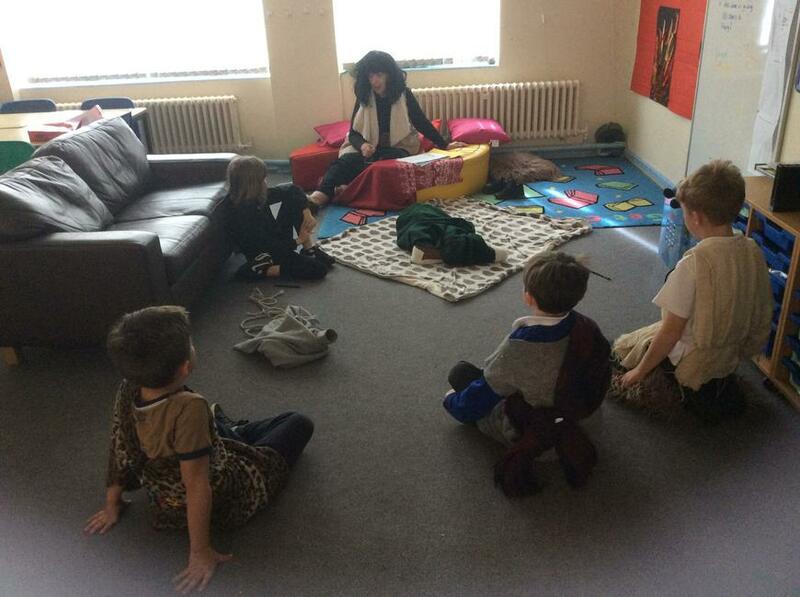 Please keep up the home reading as this really helps the children in many other areas of their learning. 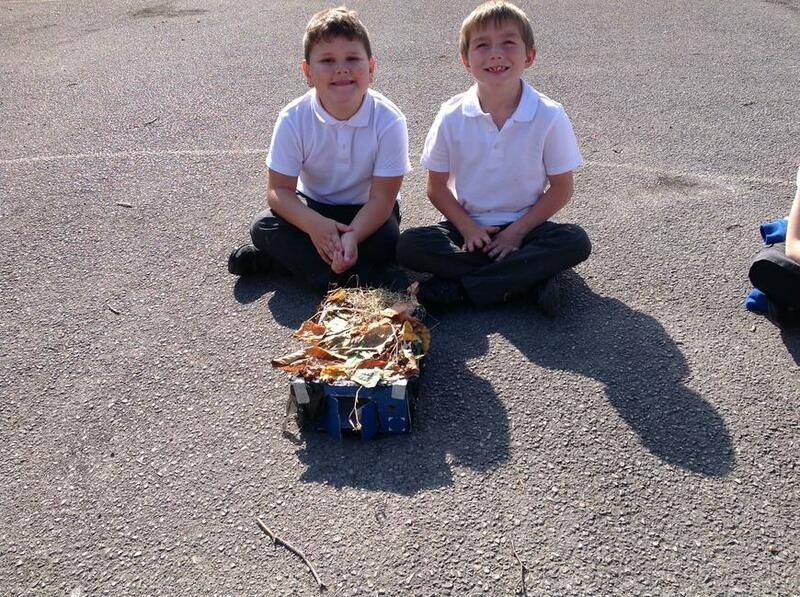 On Tuesday we are looking forward to the Scrapstore visiting us. 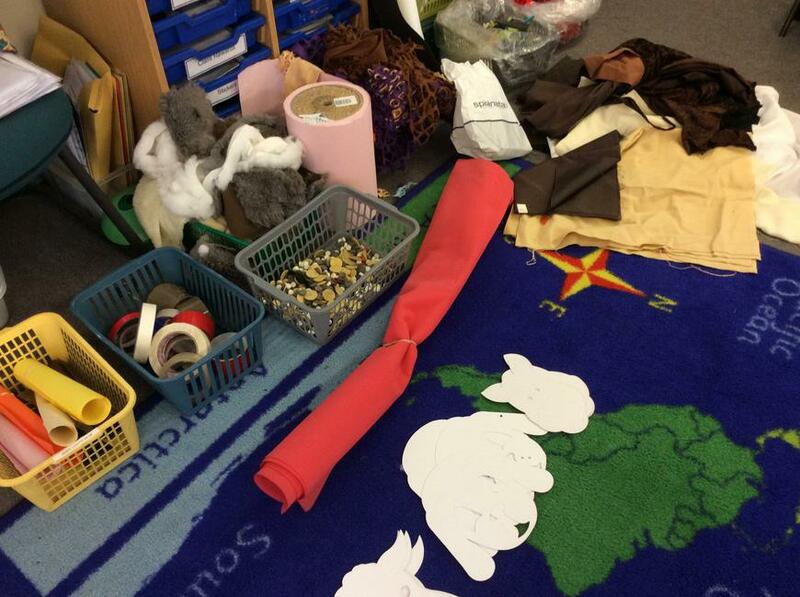 We hope you can come to see our animal parade at the end of the day where you children will show off their creations. 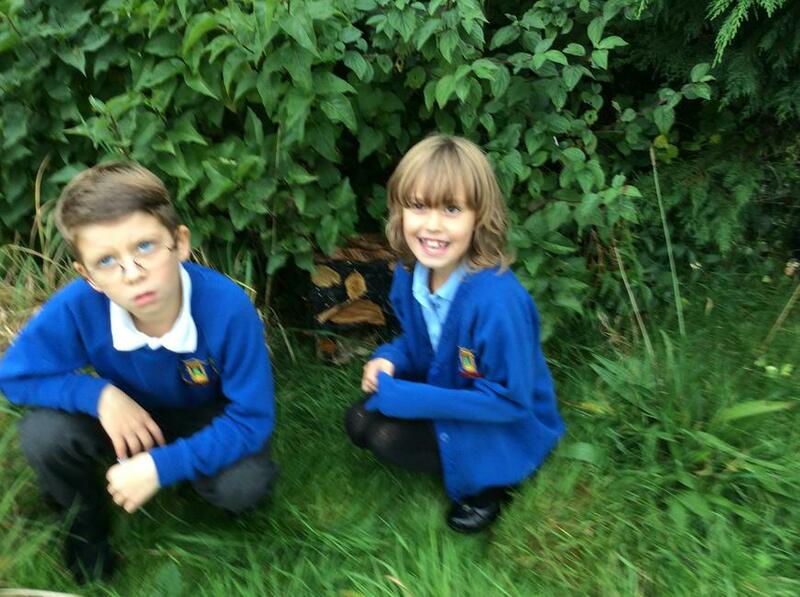 Home learning needs to be in on Wednesday. If there is a problem handing it in time please come and speak to us. 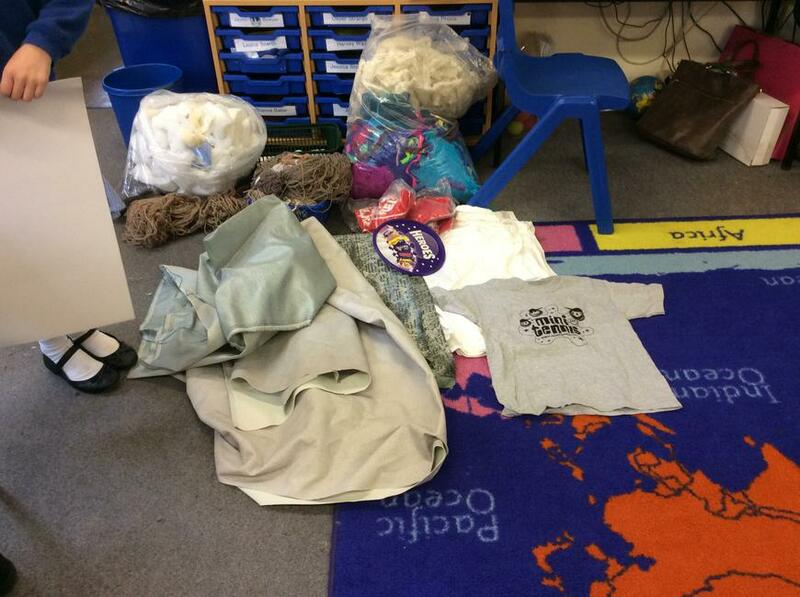 A small selection of second hand uniform is available to buy from FoFS. If you require anything please leave a message at the office or ask Mrs Gosal. We are reminding the children about staying safe in the sun by bringing in a hat to school to wear at playtimes and by applying suntan lotion in the mornings before they come to school. 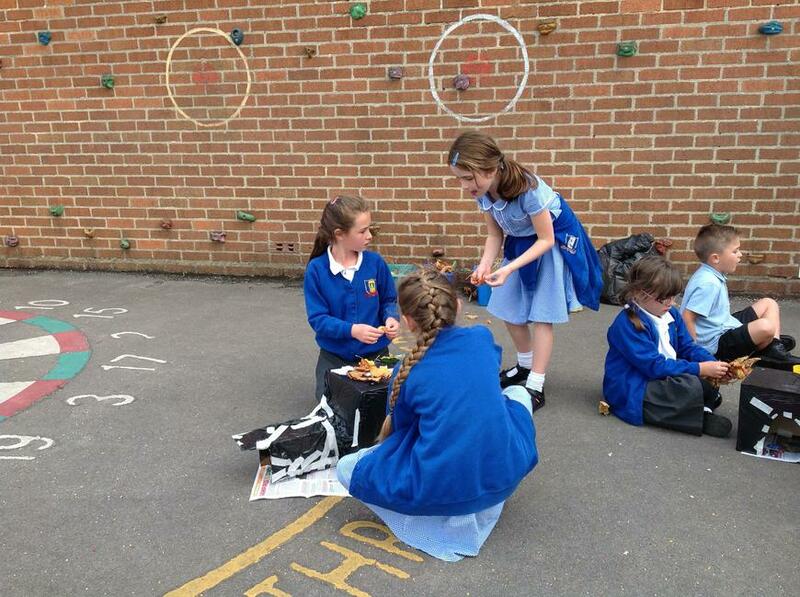 We are also suggesting that they play in the shade for some of the time especially at lunchtimes. If you could reinforce this message at home too then we will be helping your child to start to think about this for themselves. Thank you. 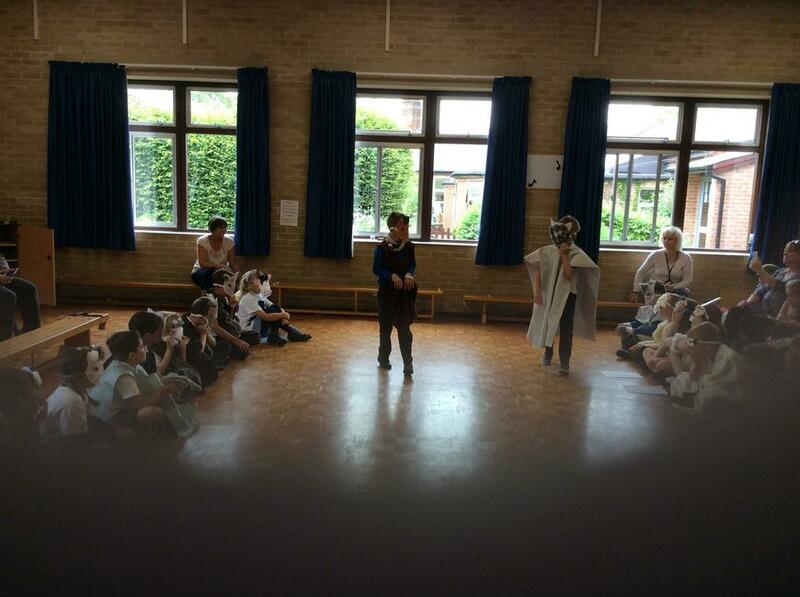 Yet another term has flown by and what an end to it! 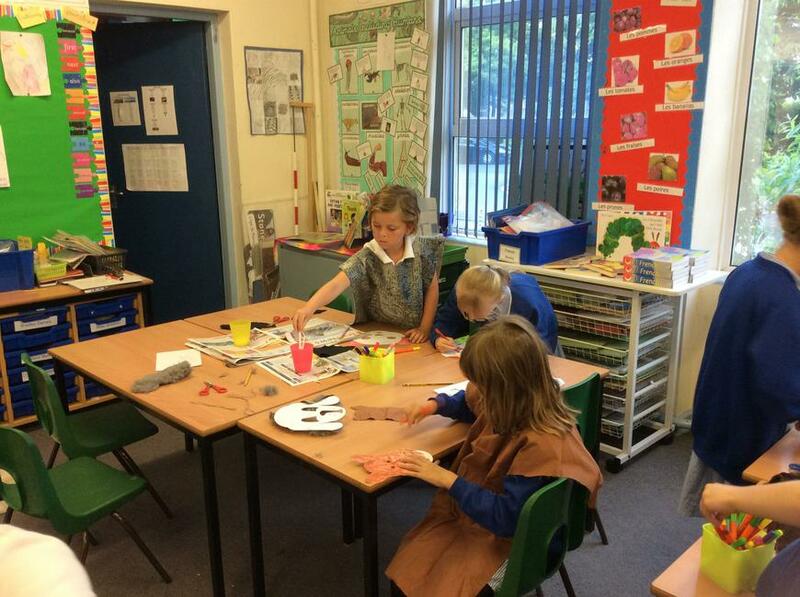 Canada class has been involved in the whole school Art Theme and everyone enjoyed painting a flower onto a wooden tile and using pastels for colouring butterflies. 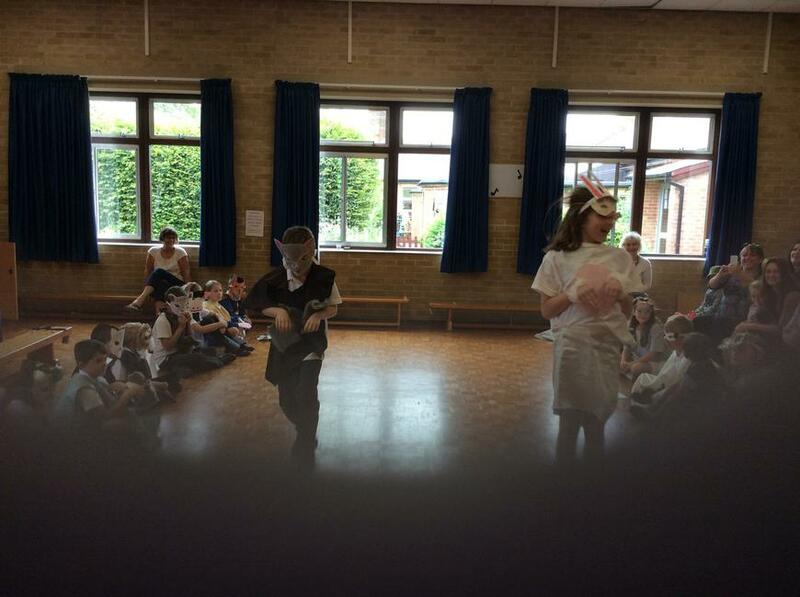 Also some children helped Mr Bacon and Mrs Dudbridge complete some amazing masterpieces. 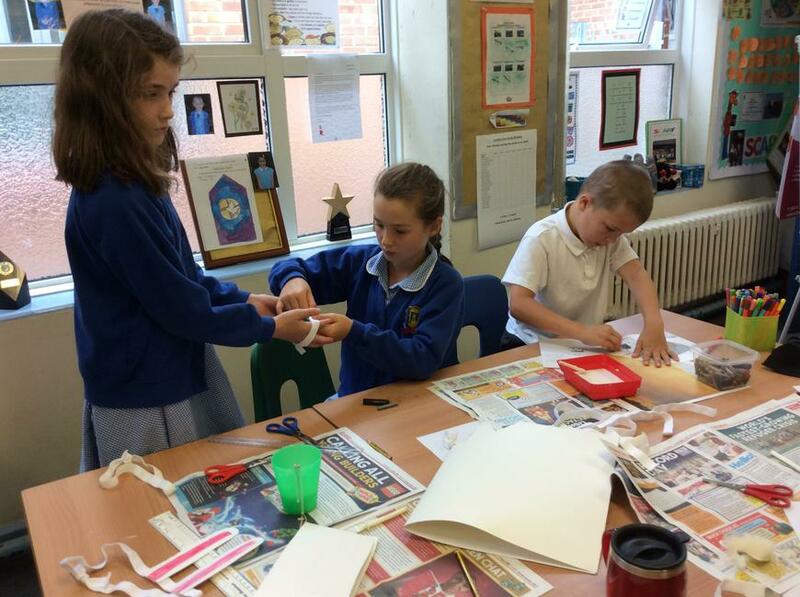 We are very lucky to have talented staff and children in Frogwell School. 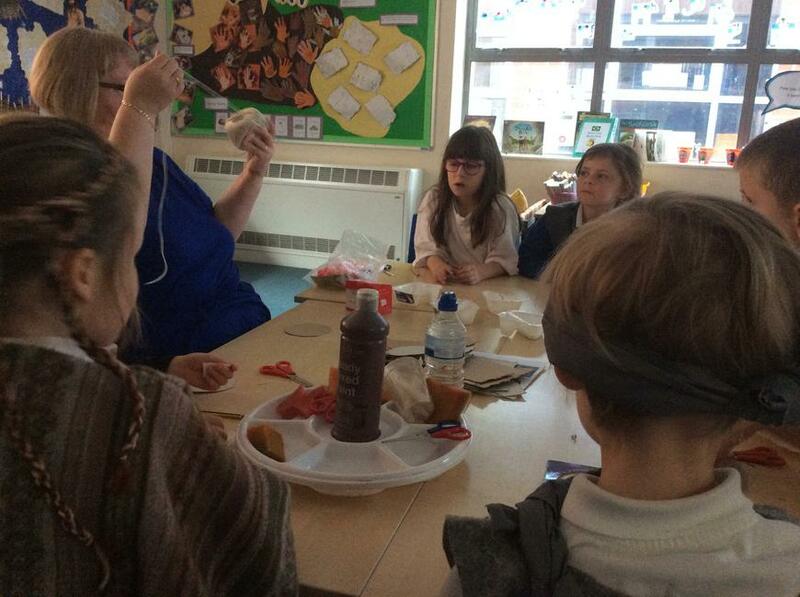 We all enjoyed following our instructions to make and enjoy a healthy sandwich. 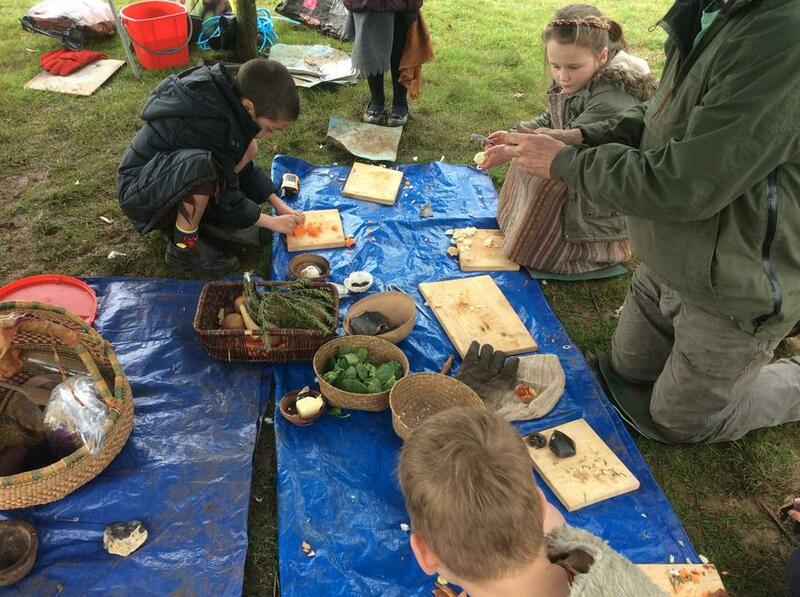 Some children tasted food combinations that they had not tried before. 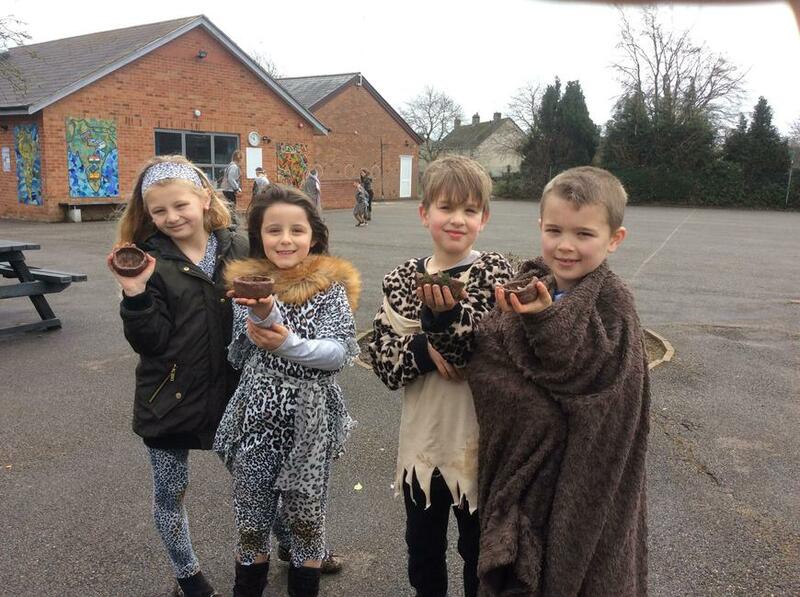 As part of our Maths project homework we have been impressed with some of the children’s baking skills and have enjoyed some delicious cakes. Thank you to everyone that has supported their child with homework over the term. 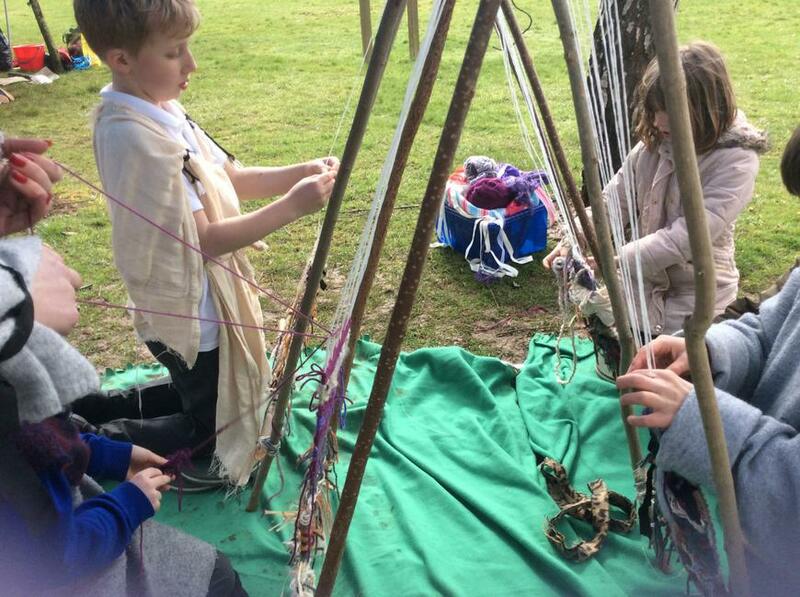 Whilst it can become an extra chore, you are helping your child enhance their learning and learn a life skill of meeting deadlines and able to complete projects outside of the classroom. We cannot stress the importance of listening to children read and require your support in this. Please set aside at least 10 minutes everyday to sit with your child and read. We try our best to listen to every child read in class but along with all the other balls we juggle we hope you can support us as part of the Home School Agreement. If you need any support with this, then please come into school and chat to us. On behalf of the teaching team in Canada class, we hope you all have a restful and enjoyable break. We had a fun packed week in Canada class this week. 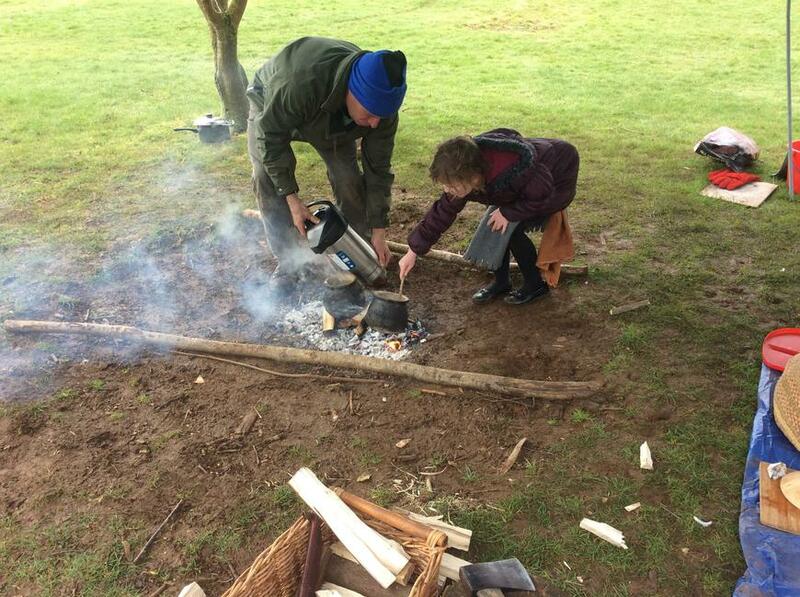 It was our last Forest School session and all the children were successful in building their fires and getting them alight. 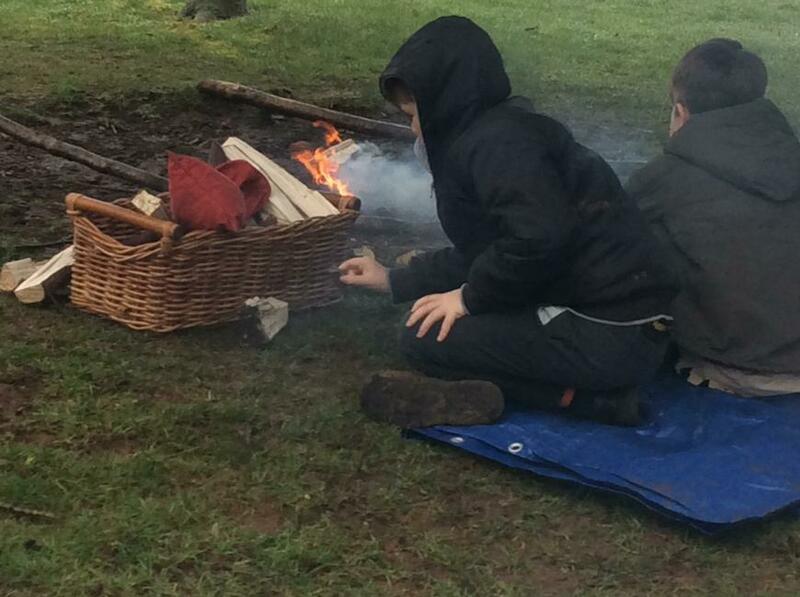 They even toasted marshmallows. We have been working on fractions this week. It was challenging but the children took the challenge on and showed good perseverance with their learning We looked at whole and part fractions, for example 1 1/4. This then led on to finding the fraction of a number e.g. 1/3 of 15. We have been busy writing our instructions for a healthy sandwich and look forward to making the sandwich next week. 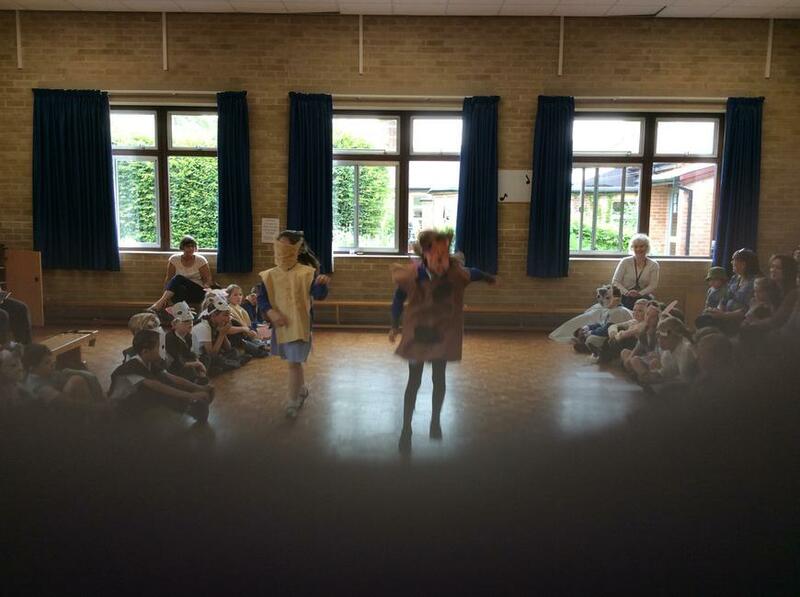 As the last week of term approaches we are looking forward to the whole school theme linked to Art. Reminder - homework share is due Monday and we look forward to sharing and celebrating the work that the children have completed. 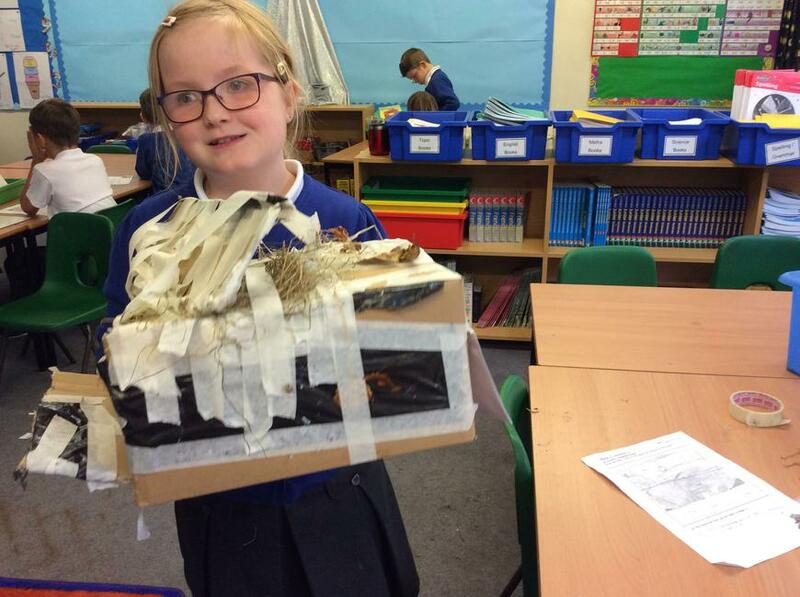 Please encourage your child to choose a topic that they are interested in and work on a piece to share at home. 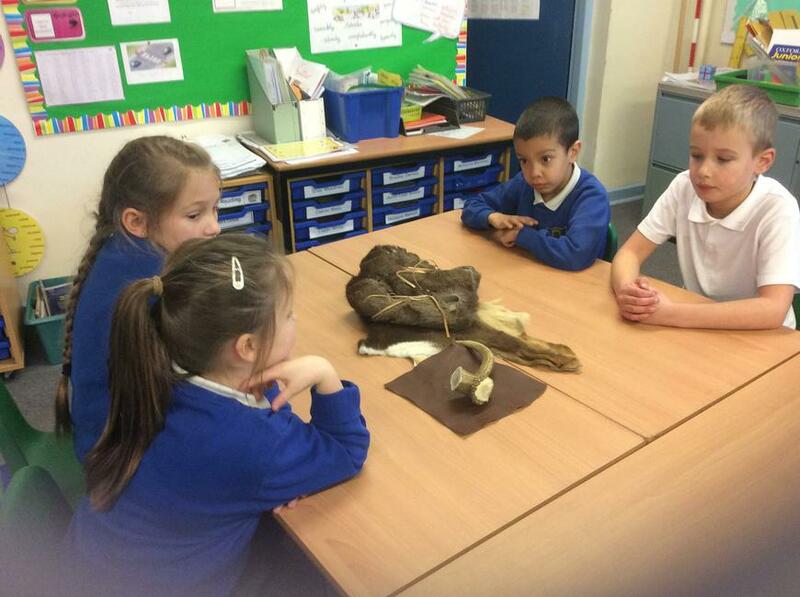 The children really enjoy sharing this with their peers and answering questions about what they have done. They will be rewarded for their hard work. Enjoy your weekend and the sunshine. Only 4 days this coming week until half term as Friday is a TD Day. The weeks are flying by and it’s not long before half term will be upon us. 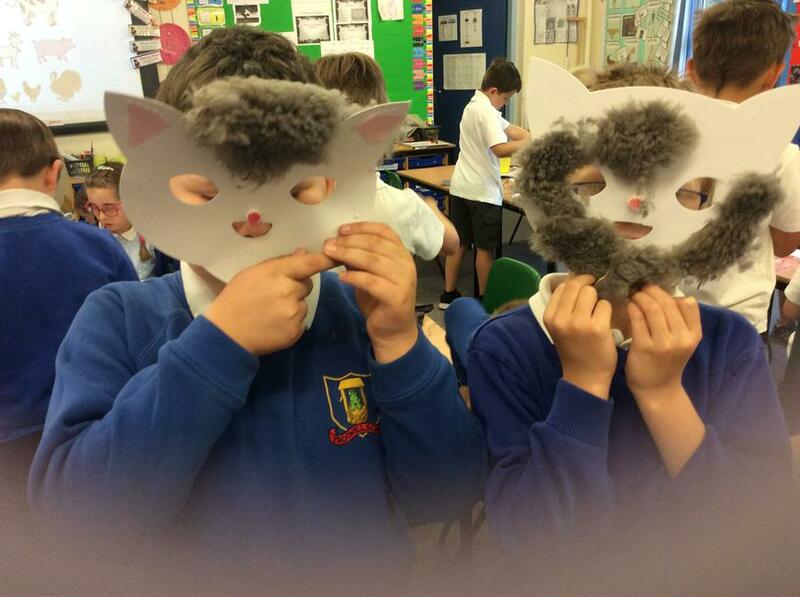 The children have been learning how to write Haiku poems this week. Ask your child to explain the special features of a haiku. 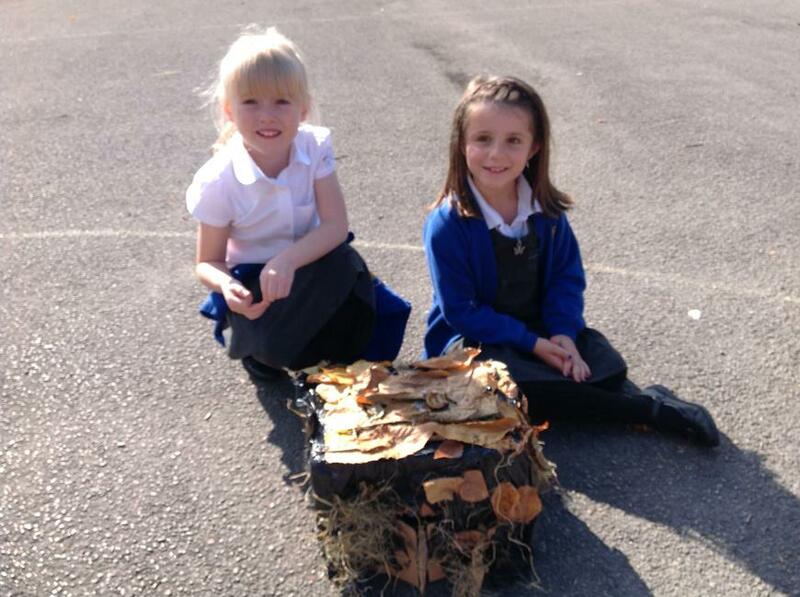 We have put together a class poetry book. You are welcome to come in at the end of the day to have look. 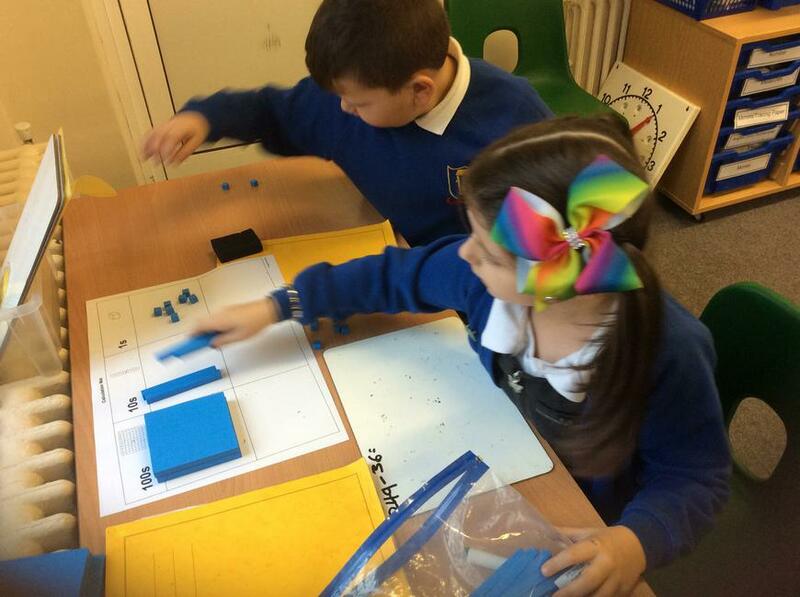 Our maths learning focus this week was fractions. We revised, what is a fraction? 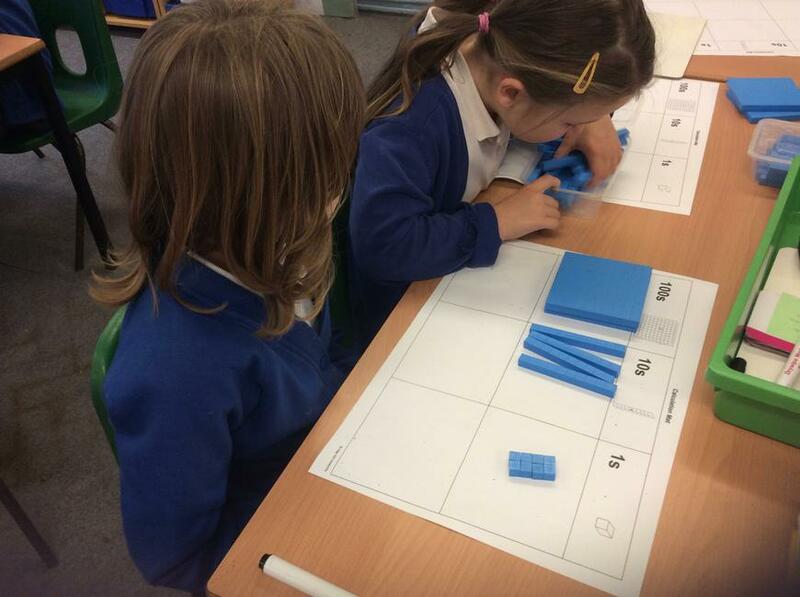 We have been looking at halves, quarters and tenths. 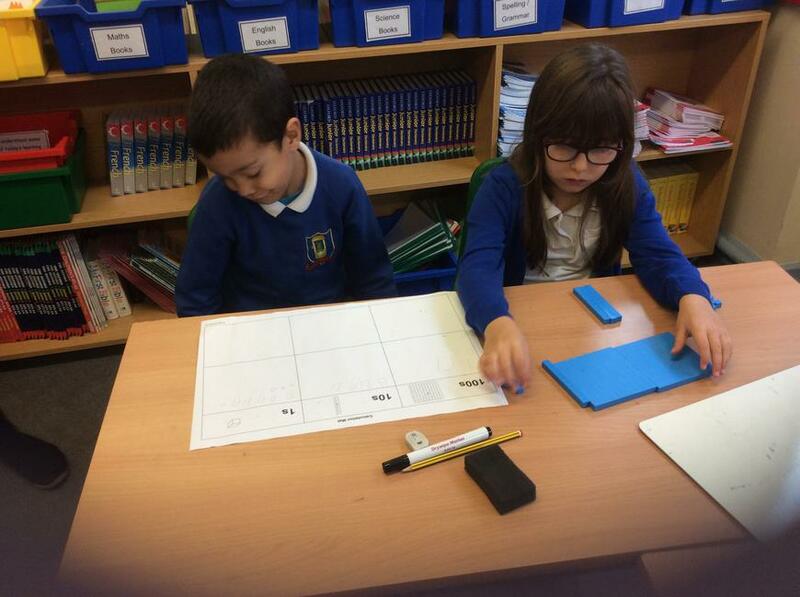 Keep up the times tables practice. 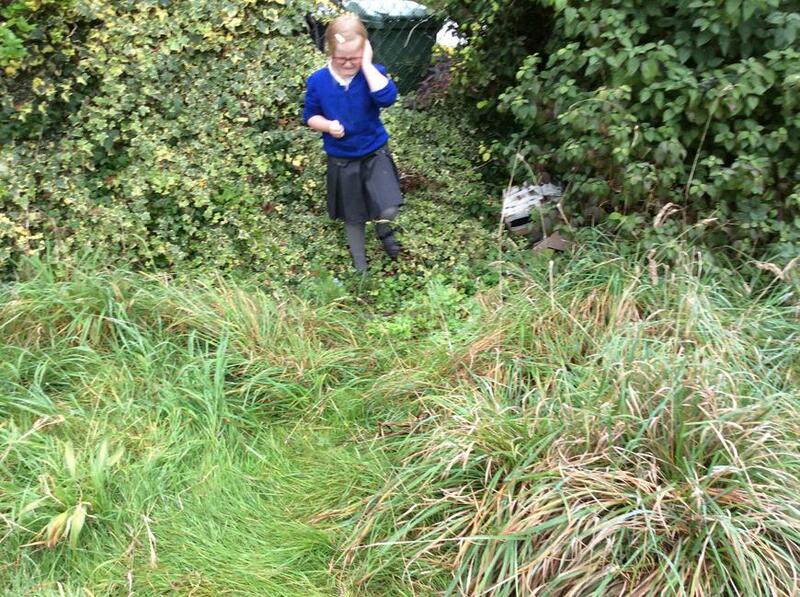 You can do it anywhere, for example, whilst walking to school or driving in the car. 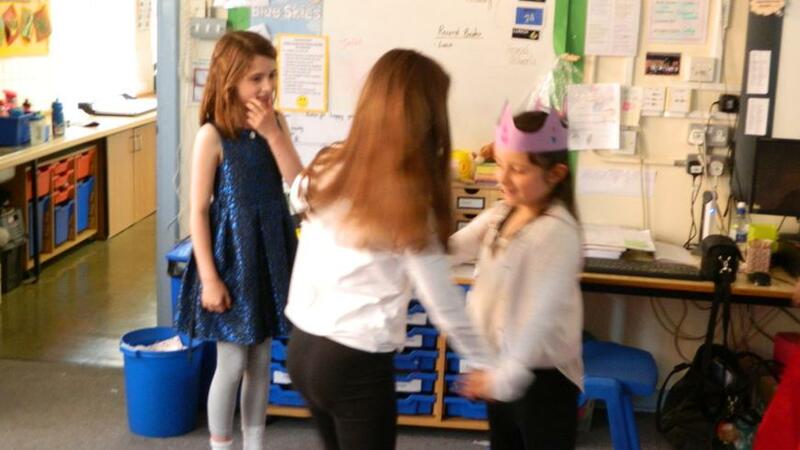 As part of our reading comprehension we studied Royal weddings. 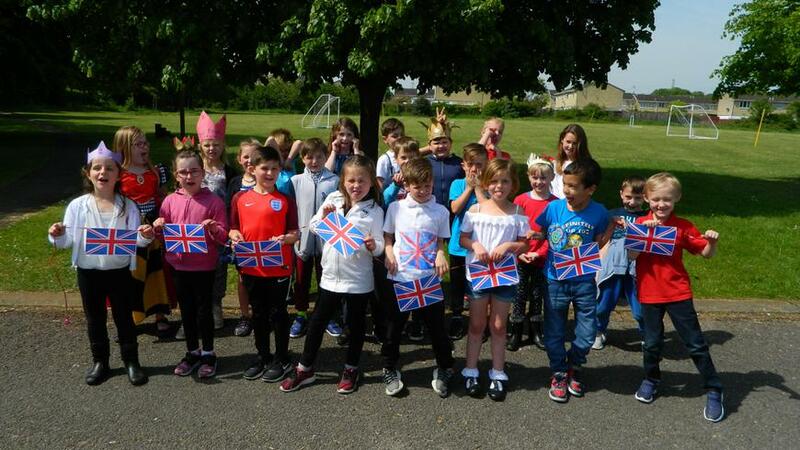 This was of particular interest to the children with the latest Royal wedding approaching. Please keep up the home reading. 4 reads = a treat. Reading records need to be completed and signed by an adult. It only takes 10 minutes every day. 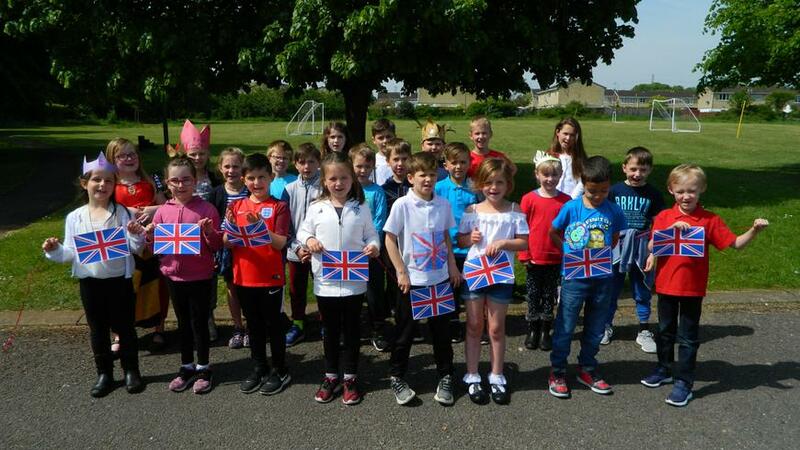 Up coming events - Royal morning on Friday 18th May in Canada Class. 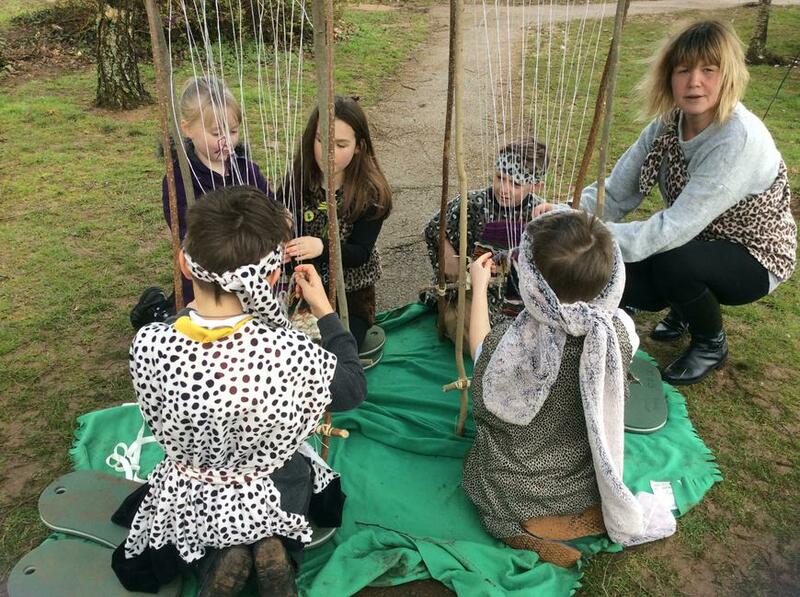 Forest Schools with Mrs Dudbridge in the afternoon, this will be our last session so please make sure that children have the correct clothes and have sun-cream and a hat to protect themselves if the weather is hot. Hope that you are enjoying the weekend. 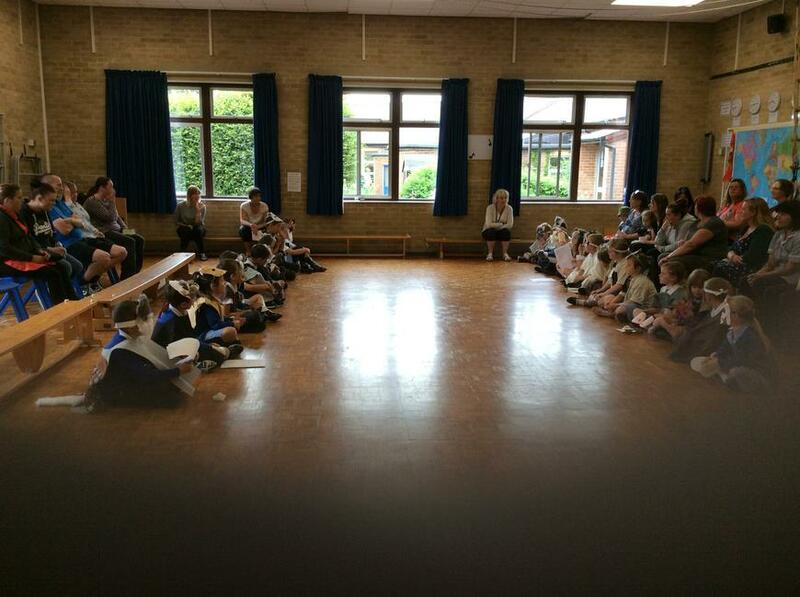 Week 3 has come to an end and this week the children learnt a class poem off by heart. 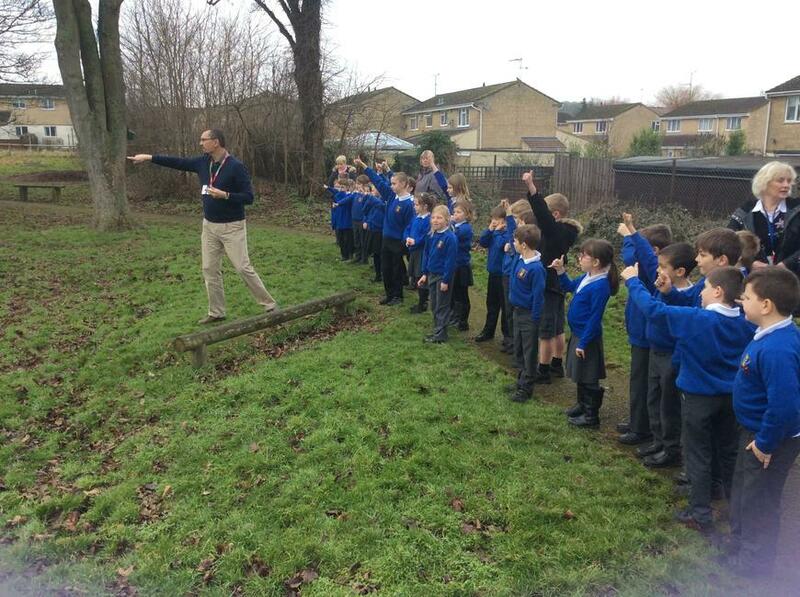 We used our prior learning of using actions to help us remember the poem. 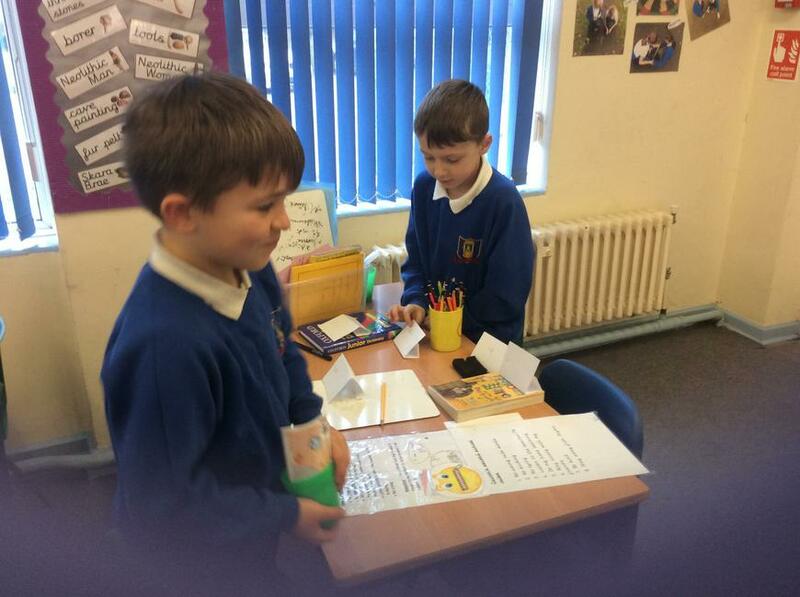 The children had great fun writing their own Kennings poems. It’s a poem that allows you to play with words. 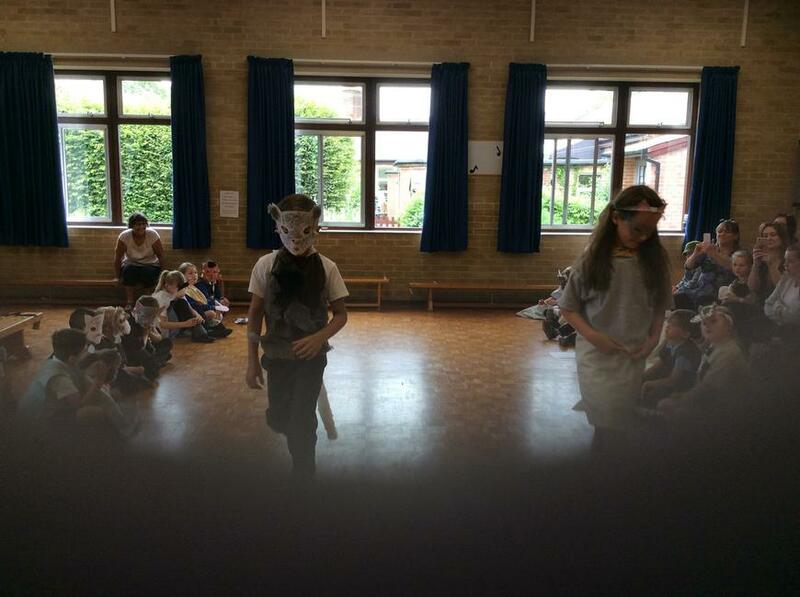 Ask your child to tell you the features of a Kenning poem. 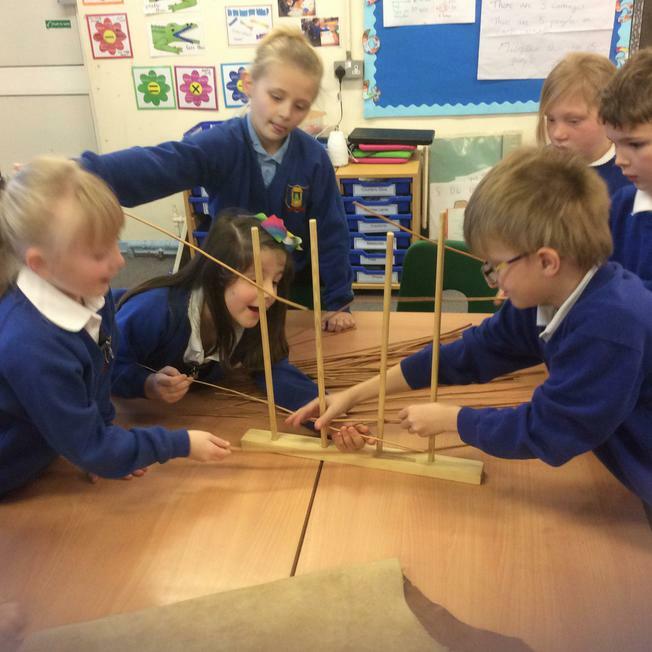 In Maths we have been using our measuring skills to work our perimeters. 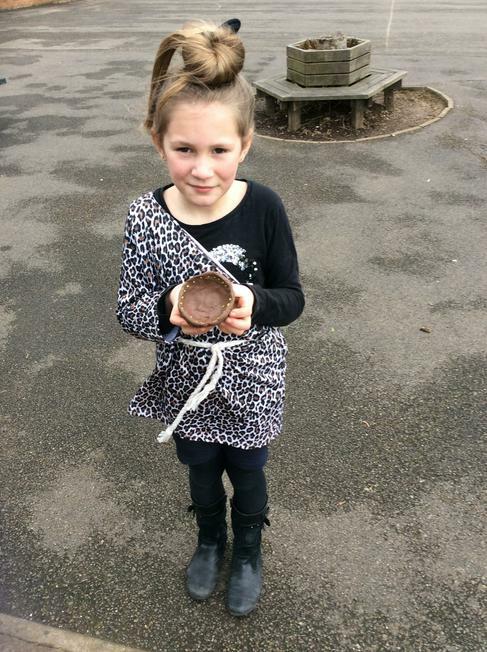 The children used charcoal to create a still life pepper. 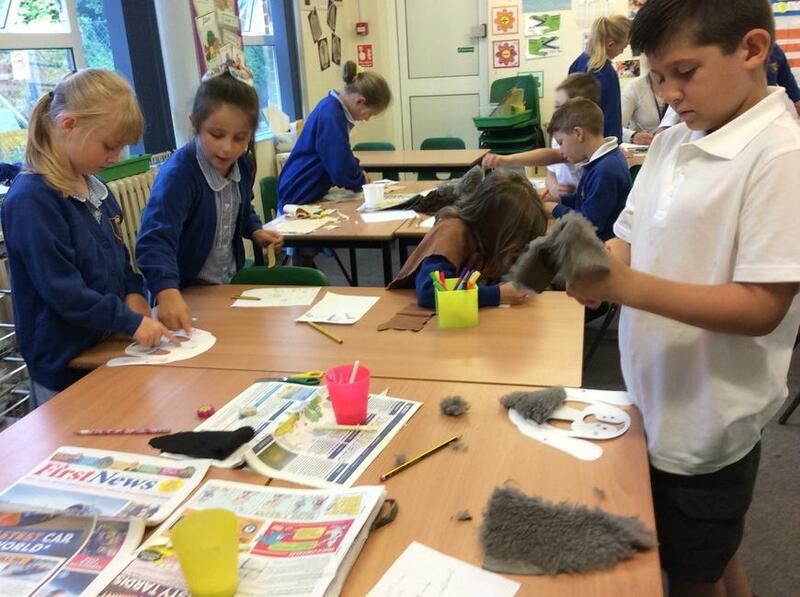 Mrs Farr explained the different ways that charcoal can be used in art. Their work is really effective and is on display in our class. 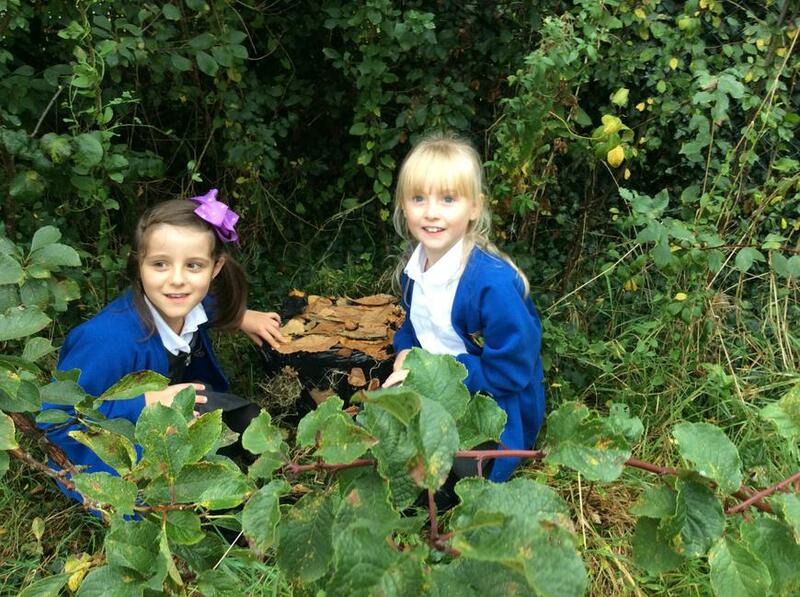 Well done to Lily-May and Lily V for completing the 28 Club. 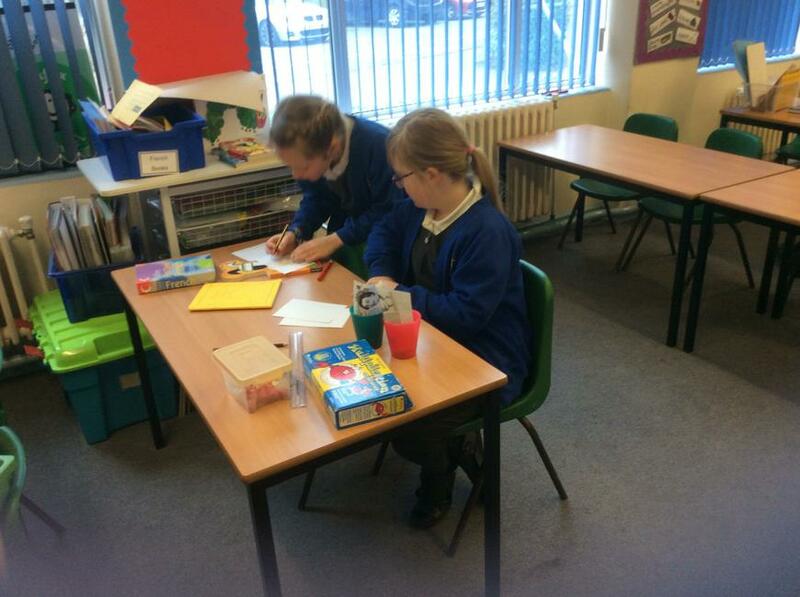 They are now moving onto the 36 Club in times tables. 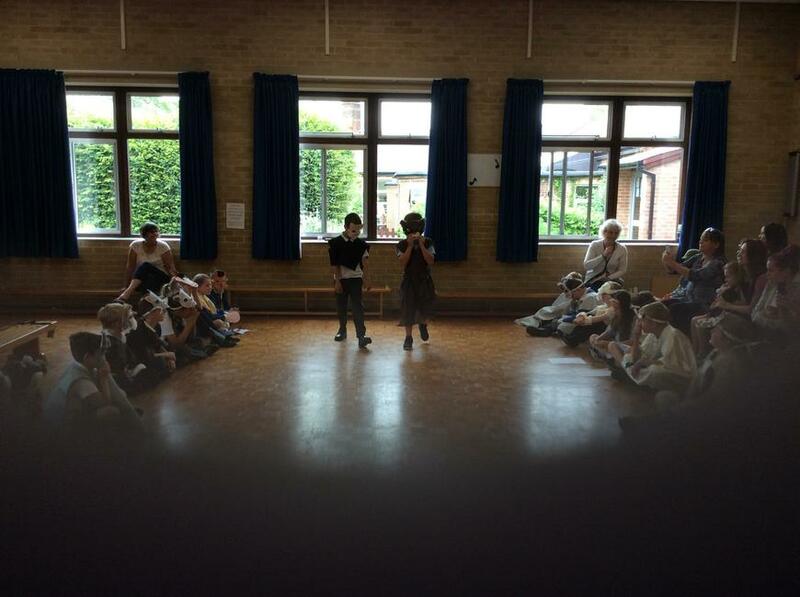 End of another week and in our class this week we have been holding Poetry Slams. Children have been looking at the features of a poem and tried to apply these to their recital of a poem of their choice. We have been impressed. 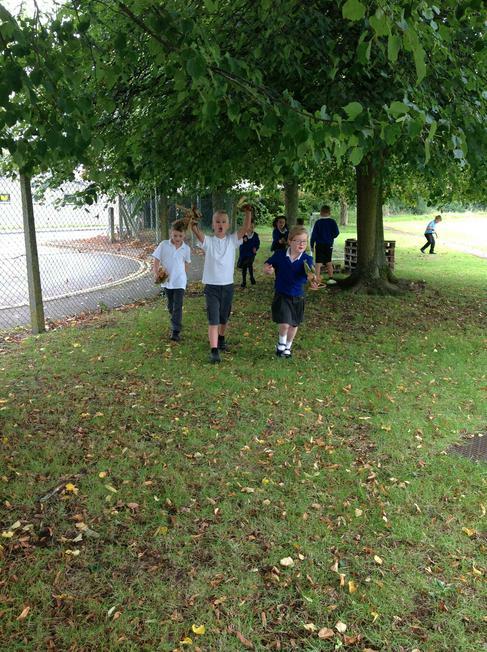 Our favourite class poem is, 'I’m walking with my Iguana' by Brian Moses. 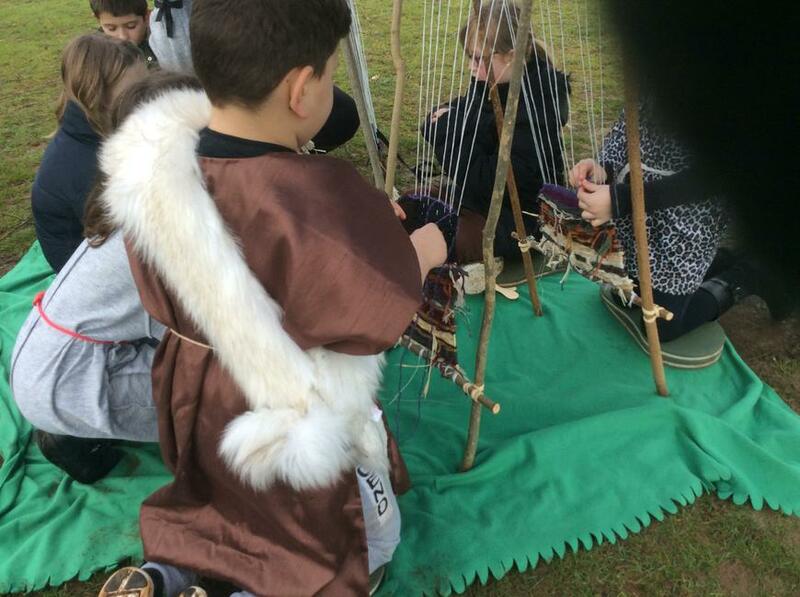 You can see and hear the poem on line, I am sure that the children would enjoy sharing it and talking about it with you. In Maths we have progressed into converting millimetres into to centimetres and cm in to M.
Ask you child, how many mm= 1cm, how many cm = 1m. We have also started adding measurements. 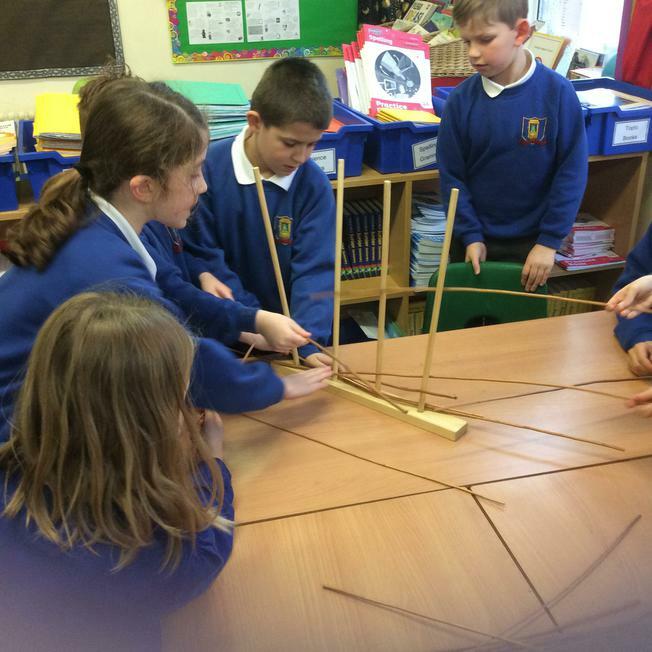 This is challenging and the children have tried really hard. Well done to Riley Mc for achieving his first ‘Club 66’ certificate. 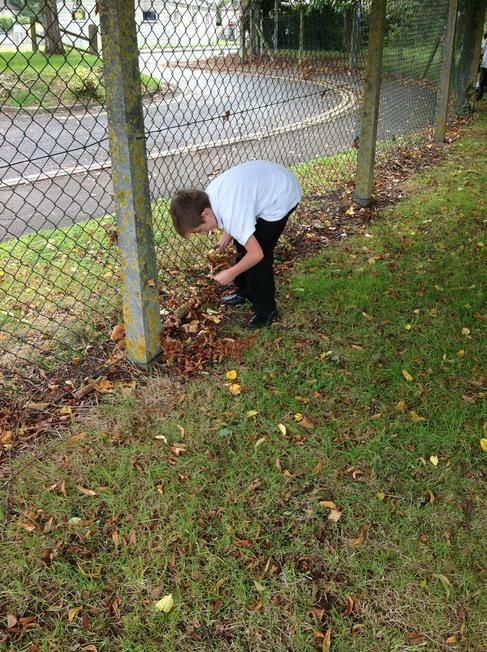 Thanks to Ms Tracey for taking out Crystal and Luca for a litter pick around our school grounds. 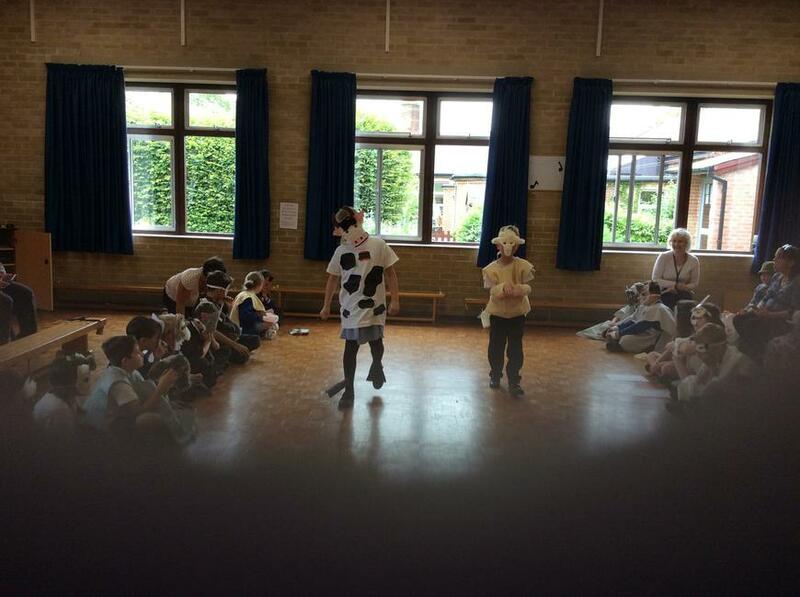 This is linked in with our ‘Caring’ theme for the whole school. 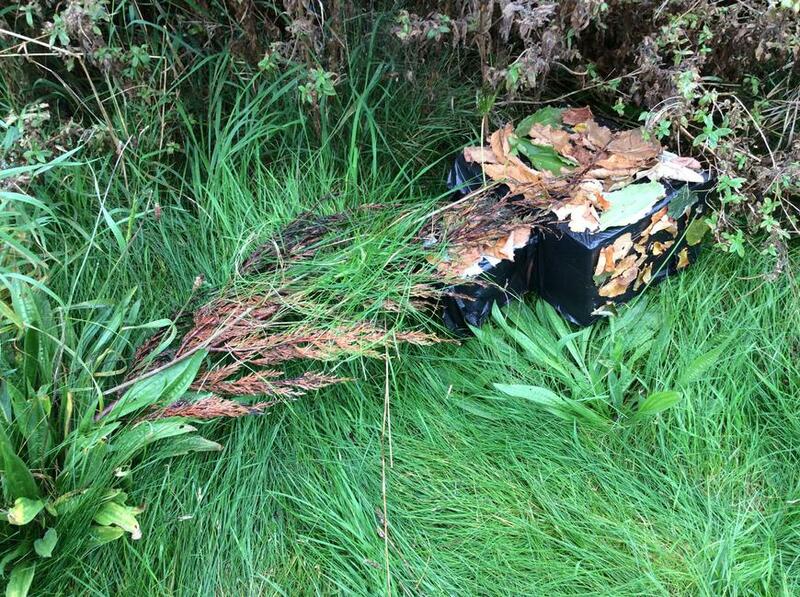 It’s important that we all discuss with our children the implications litter has on the environment and how we all need to take responsibility for caring for our environment. 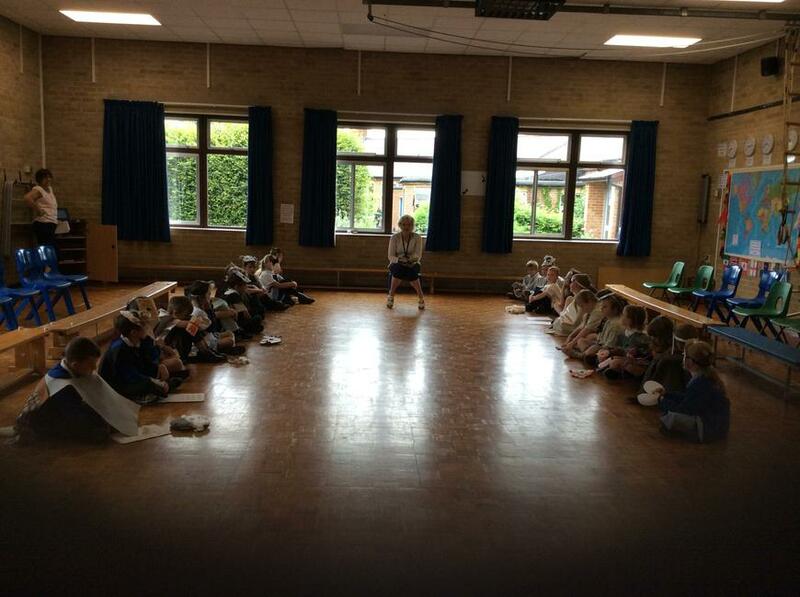 We are continuing on improving our cricket skills with Mr Kingwell on Fridays. Please ensure that full PE kit is in school for the whole week. 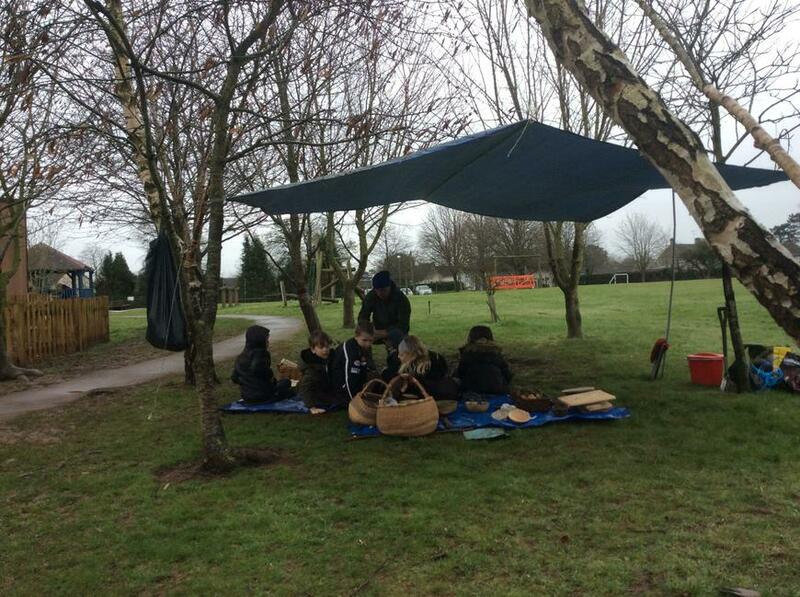 Don’t forget Forest schools is every Friday for rest of this term and children must have suitable our clothing and footwear. 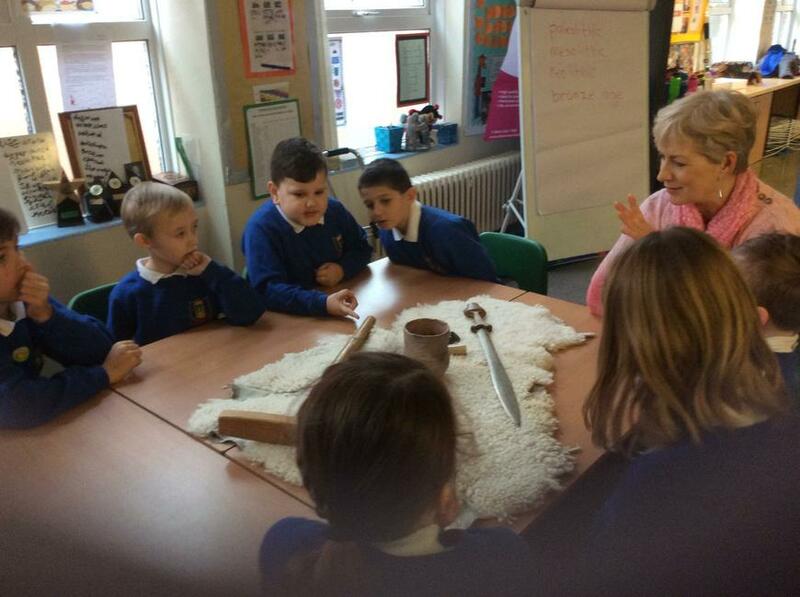 They thoroughly enjoyed their visit this week and all behaved really well. 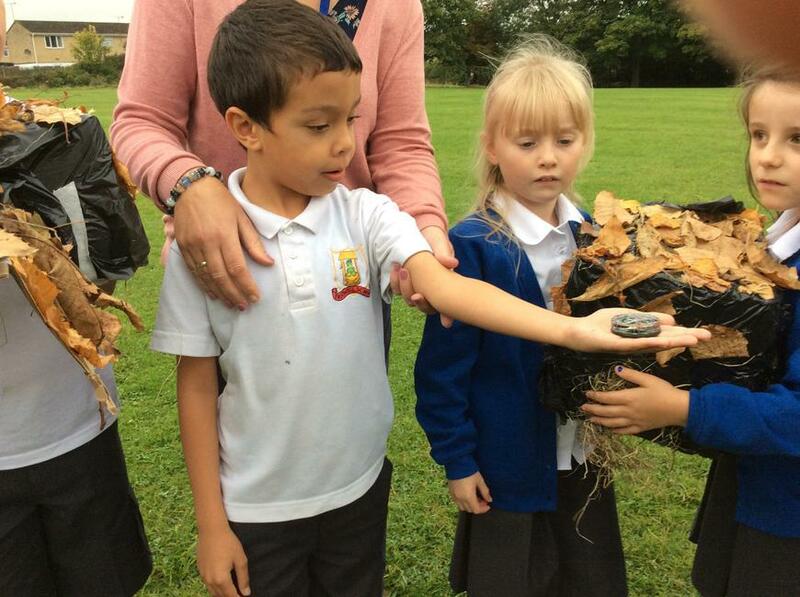 As the weather is changeable please ensure children are coming to school with a coat or jacket for playtimes. Hope that you all had a nice break. 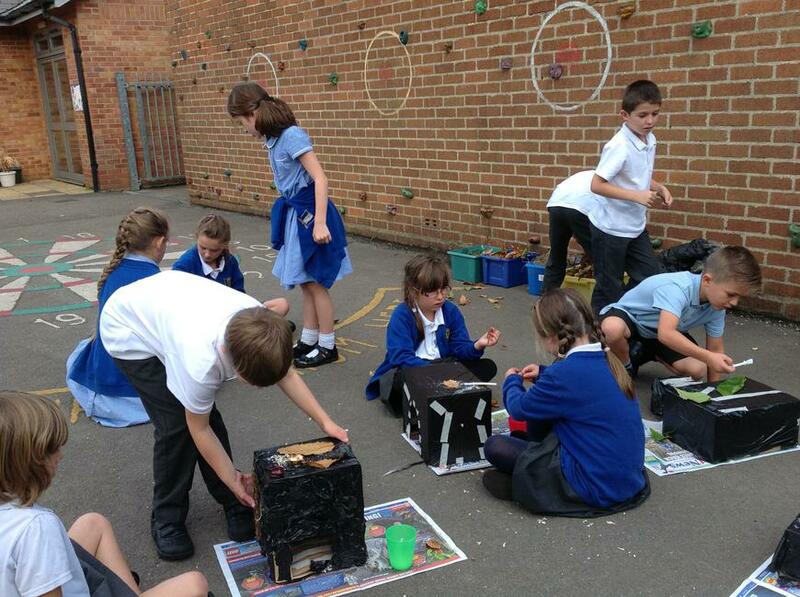 We are now in our Summer Term and it won’t be long before the children move into Year 4. Our English focus this week has been reading. We shared our favourite books and discussed them. We have been improving our dictionary skills and discussing extracts of writing to infer meaning. We’ve also worked on strategies to workout the meanings of unfamiliar words when reading a text. Please support you child by listening to them read and recording this in their reading books. It is important that this is completed on a regular basis to support them with their progress. Reading record books will be checked every Wednesday and children who have read at least 4 times in the week will be rewarded with a treat. In maths we have been measuring in mm, cm and m, we have been working on improving our skills so that we can measure more accurately. Ask you child what measurement they may need to use to measure an object? 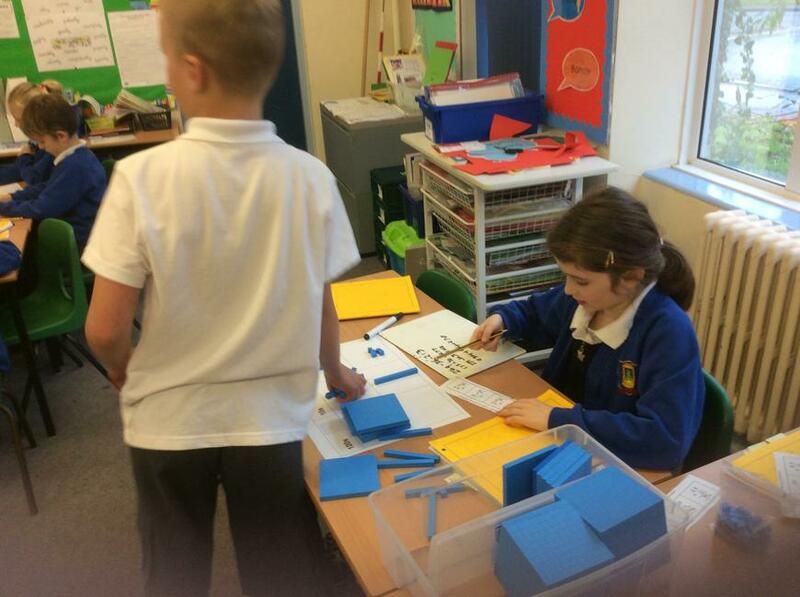 Keep up the times tables practice. Find or buy a pack of cards and ask your child to show you the game we play in class. You could have a competition to see who can achieve the highest score in 1 minute. 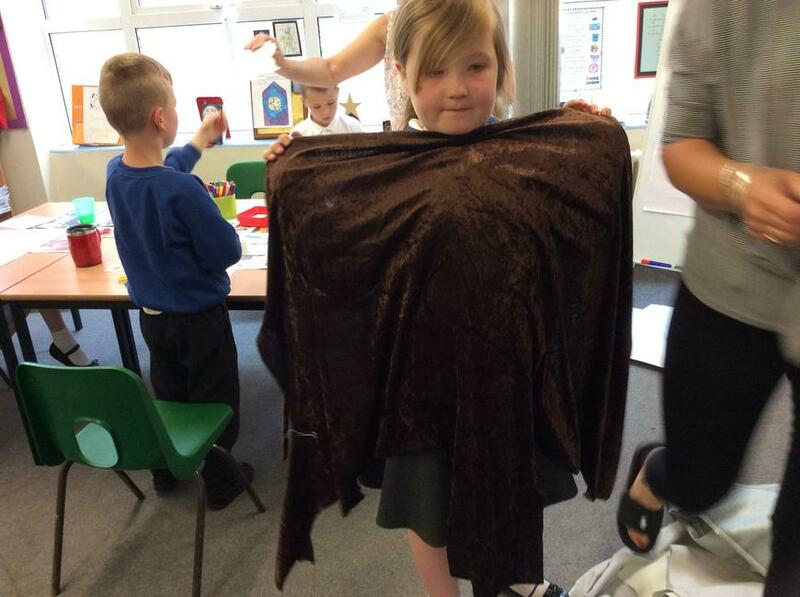 Our class book is 'Vlad the World's Worst Vampire' by Anna Wilson. If the children have their signed copy then they can bring it in to follow along as we read. 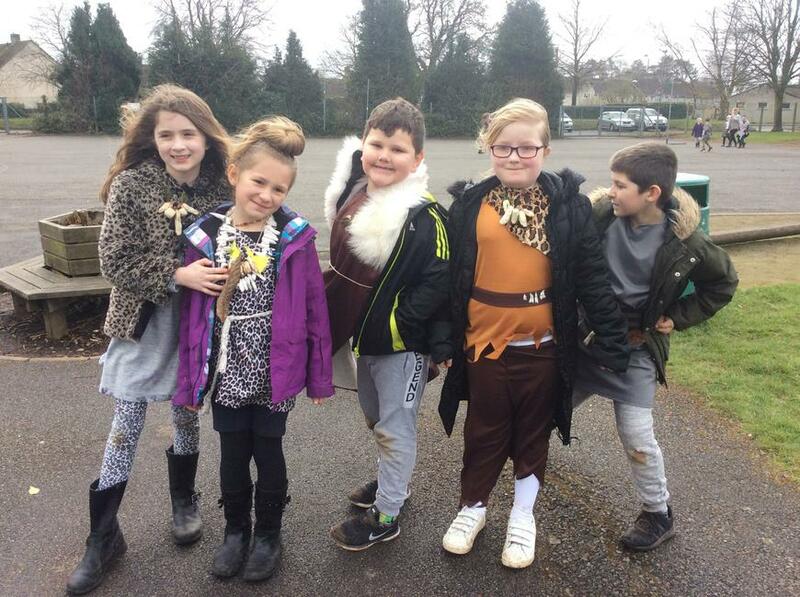 Please remember PE kits need to be in school for Cricket with Mr Kingwell on Fridays and also this Term the children will need to bring in Outdoor clothes on Fridays for Forest Schools with Mrs Dudbridge. As the weather is starting to improve please make sure that the children have fresh water bottles everyday and that they also have a hat to protect themselves at break times. 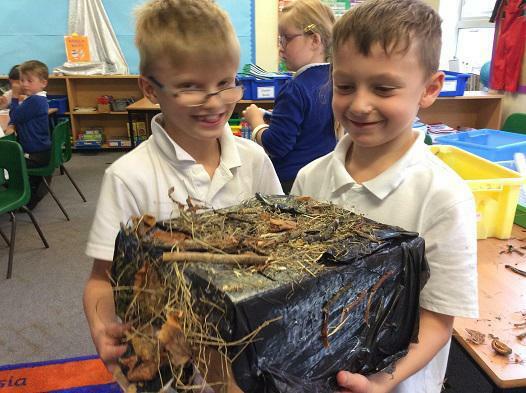 Our topic for this term is 'How do Living Things Survive?' Please have a look at the Curriculum Map to see what we will be learning about in the different areas. If you feel that you can support us in anyway then please come and let us know, we would be very grateful. 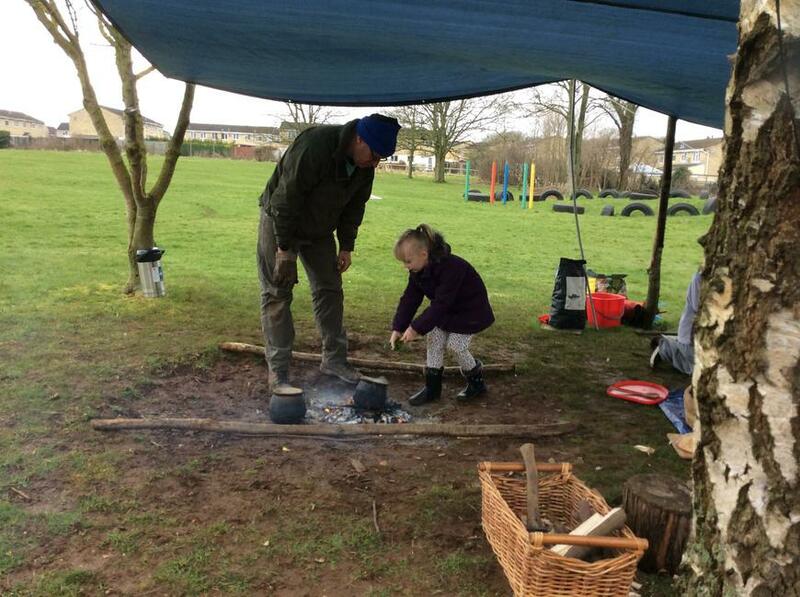 Stoneage Day Activities: Cooking on an open fire, Story telling, Weaving, Pottery, Jewellery making. 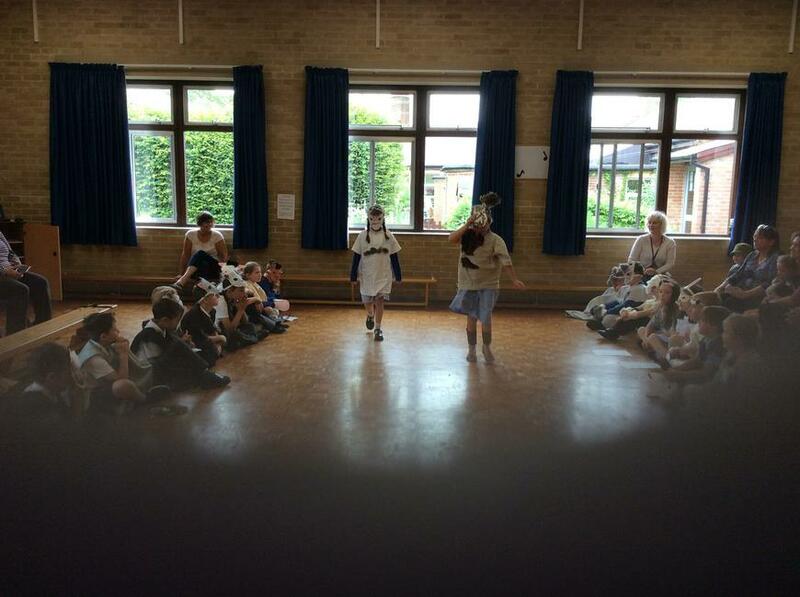 What an active end to the week, Friday morning started with Sports Relief. Meditation was followed by a few laps of cycling, scooting or running around our field. 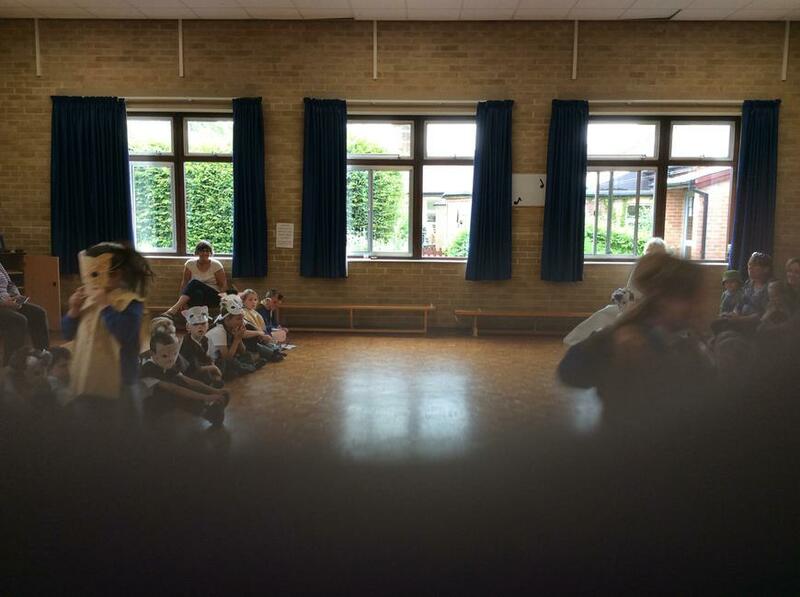 We then stopped to play a game and moved onto dance finally finishing by doing a circuit. 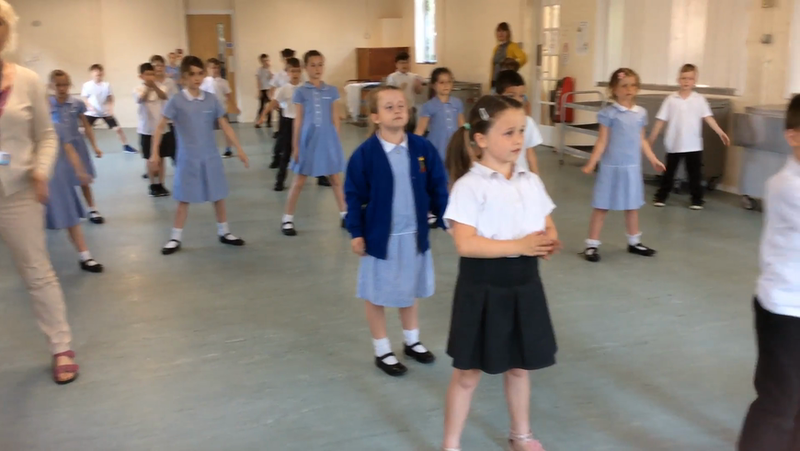 However, that was not the end as local MP Paul Harvey visited us to collect money raised and we ended our very active morning by dancing with Paul and his team. 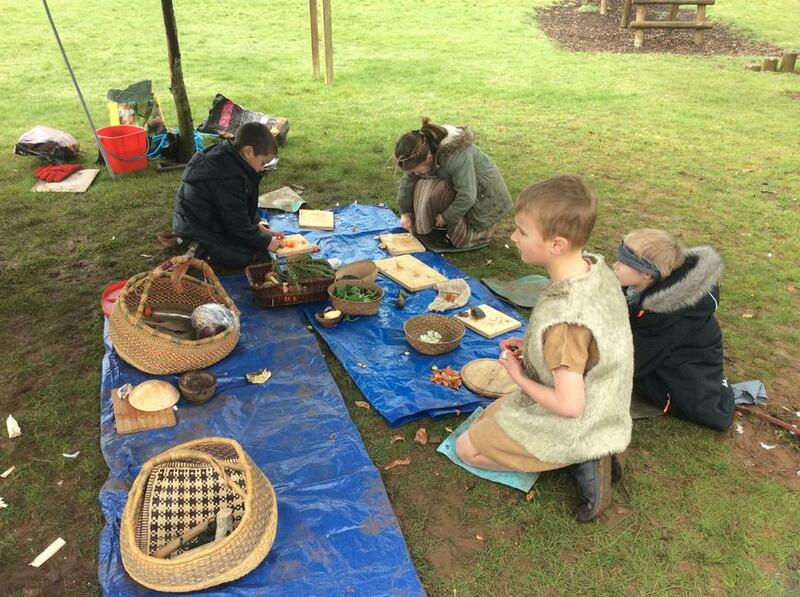 We were all looking forward to lunchtime as we had worked up an appetite. 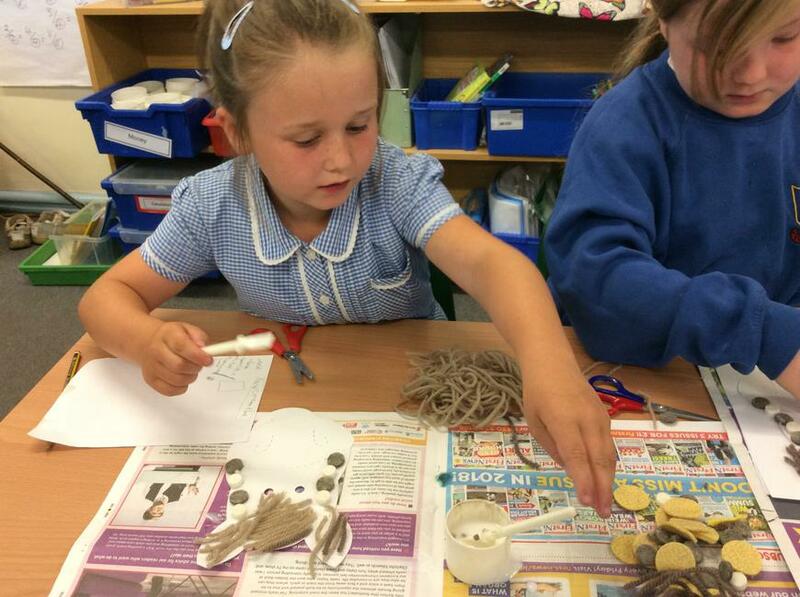 The children have had great fun using their previous maths learning about Money. 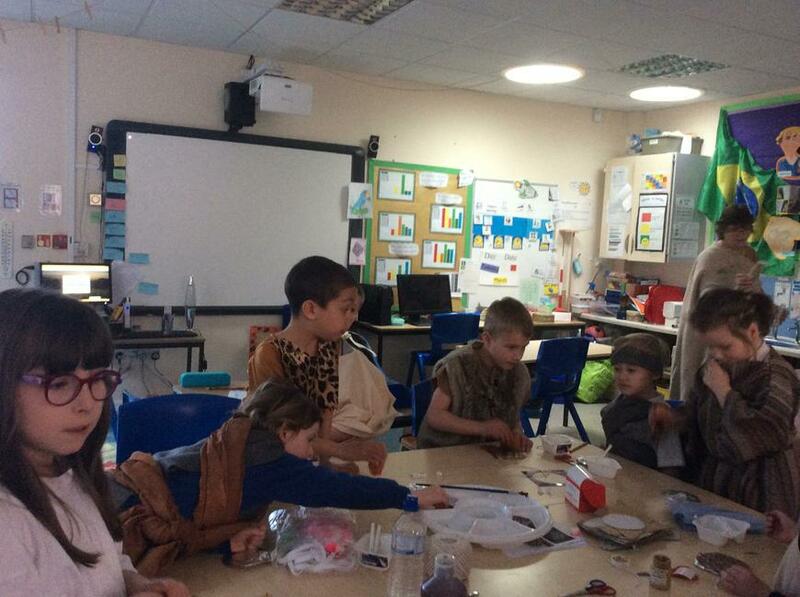 In groups they had to set up a shop and role play shop keepers and customers, paying for items and giving change. (see the photos below) This is a skill that they can continue to practise when you go shopping as a family. Can they pay for the shopping and check that the change given is correct? Alongside this, we spend everyday learning our times tables. The children are becoming more confident with this so please support them be helping them practice 2x, 3x, 4x, 5x and 6x, 8x tables. Thank you for supporting the children with their reading. Reading records get checked every Wednesday and children need to have read at least 4 times from Wednesday to Wednesday to get a surprise in their reading records. Well done to the children who regularly achieve this. 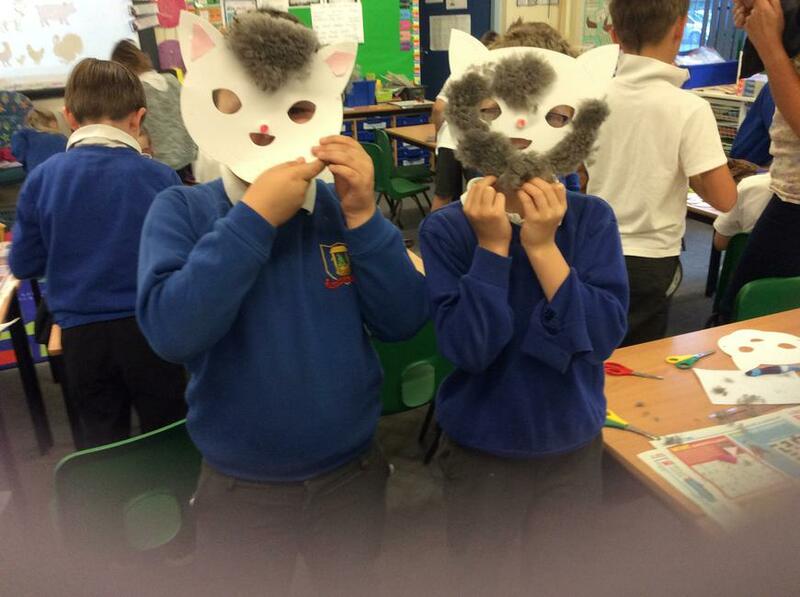 We have enjoyed sharing more themed homework this week. 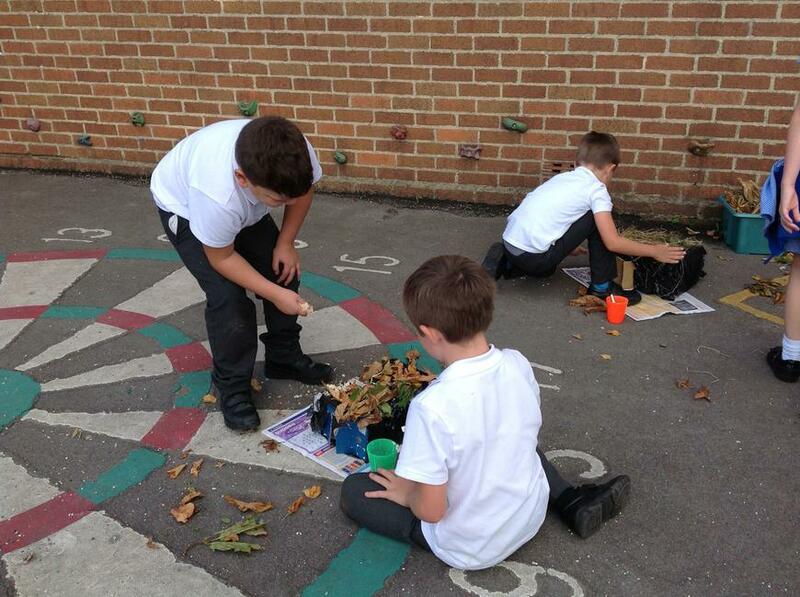 The effort that has gone into the work that the children have produced is excellent. The golden book entries that they have received are well deserved. Thank you for all the support with these, we fully appreciate the encouragement and practical help that they receive at home to complete this. 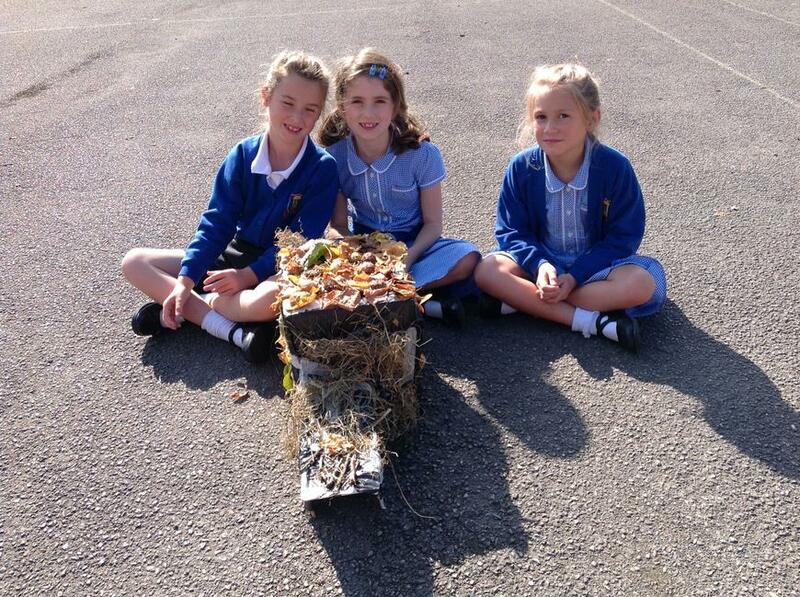 They enjoy presenting these to their peers and are able to explain the process that they go through to create them. We always have interesting questions for them to answer. 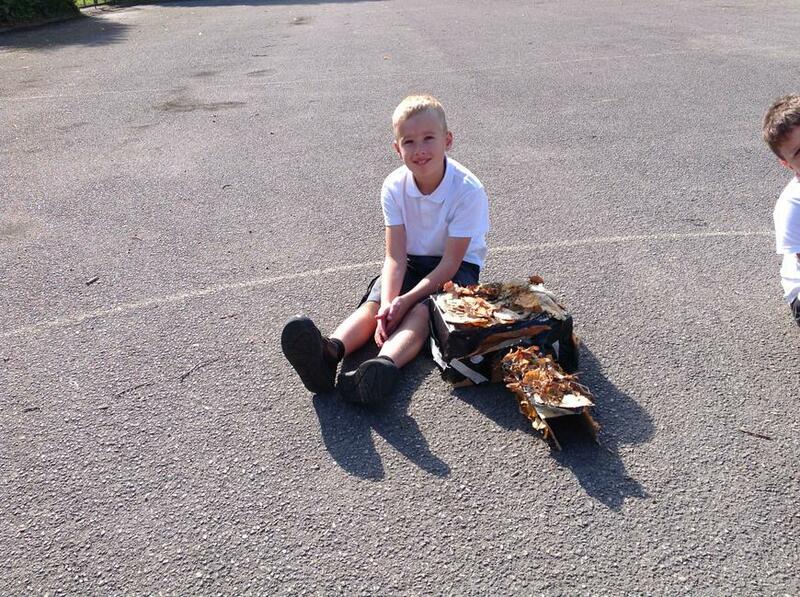 Well done to Logan who is now on the next level in the ‘Club 66 Challenge’. 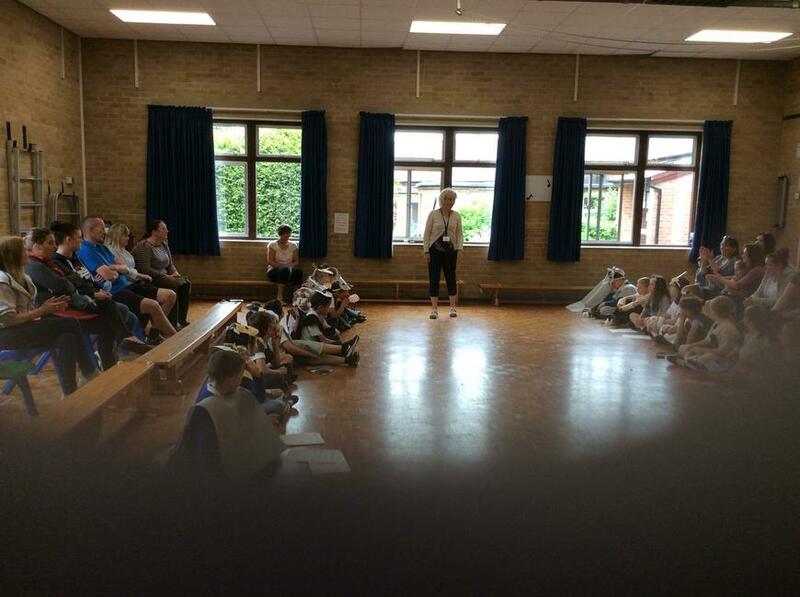 This week we will also be saying farewell to Mrs Gostellow who is moving on to another job closer to where she lives. We will all miss her and are very grateful to all the support that she has given to Canada Class Learning since September. 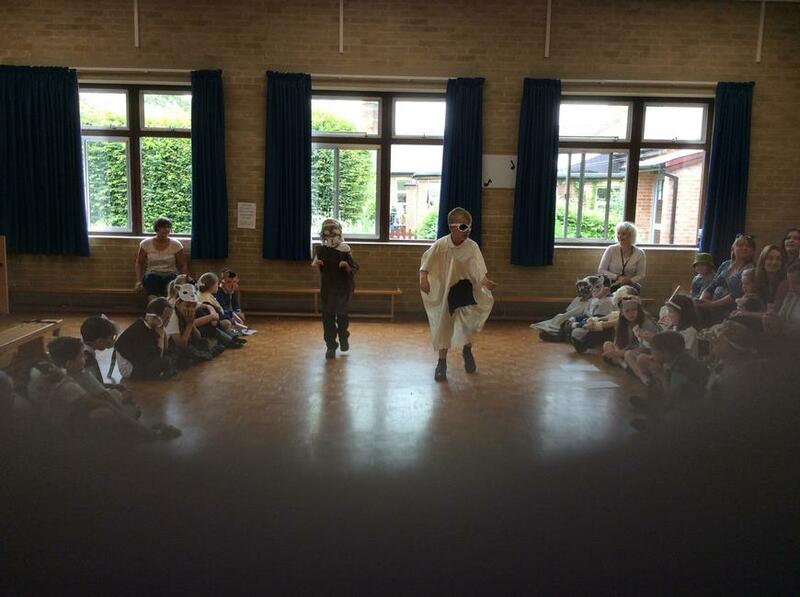 End of term and Easter Activities on Wednesday. On behalf of Canada Class staff we wish you all a Happy Easter. Enjoy the break. Apologies we forgot to mention Ava’s snow picture last week. 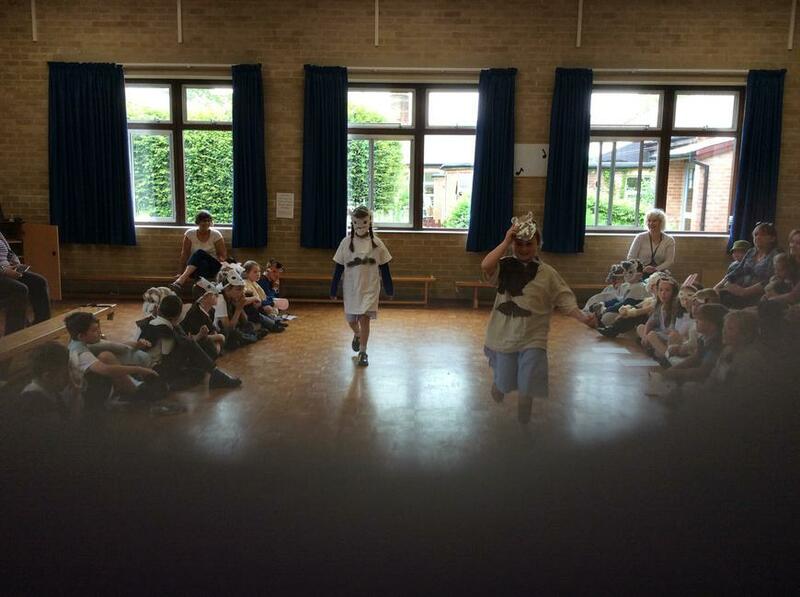 All photos have been handed to Mr Bacon who will be selecting a winner to be announced soon. 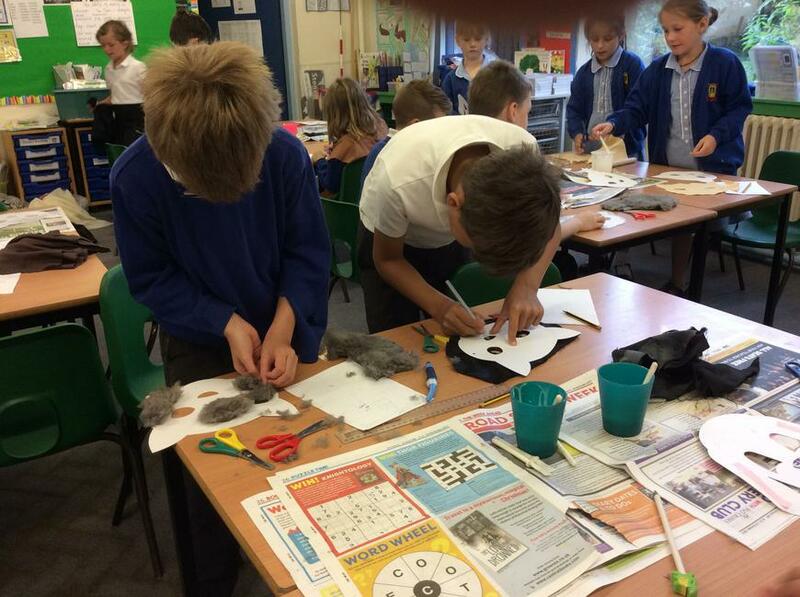 We are coming to the end of writing our information leaflet about Stonehenge. Wow, some of the children really challenged themselves and wrote some super and informative chronological writing. This was a challenge as it’s the first time the children have had to find facts and information and then put into a factual piece of writing. Please keep practising X tables for quick recall especially the x3, x4 & x8 tables as these have been our focus this term. Home Reading - we are challenging the children to read to an adult at home at least four times a week. Reading records need to be signed by the grown ups. Those that achieve this get a small prize. We would be grateful for your support in this challenge as we can’t stress enough about the importance of reading. 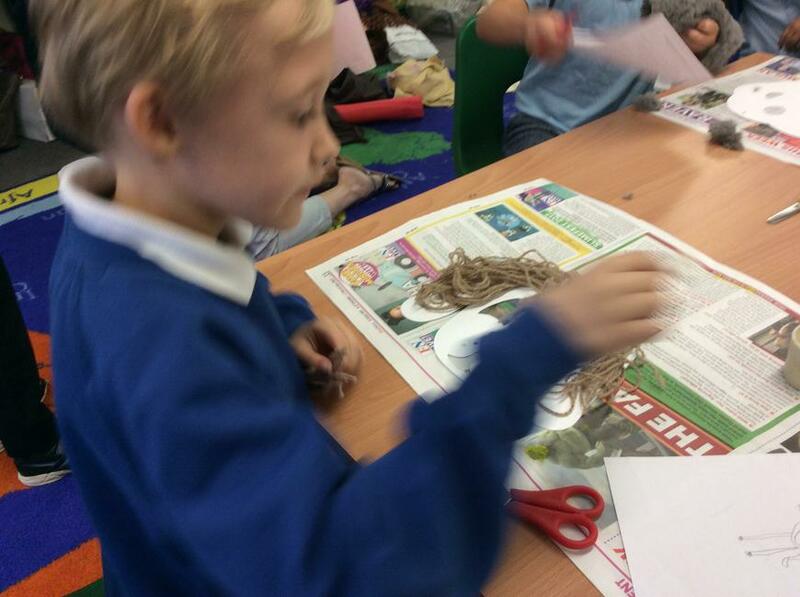 Children can read anything from books to suitable newspaper articles or even an information leaflet. As parents ourselves we understand time constraints but it need only take 10/15 minutes everyday. Mrs Gosal checks reading records weekly on a Wednesday so 4x reading needs to be from Weds to the following Tuesday. Well done to Riley G who will be going to the next Headteachers Tea Party for detailed writing of his information leaflet, he really impressed us with his independent effort and detail. 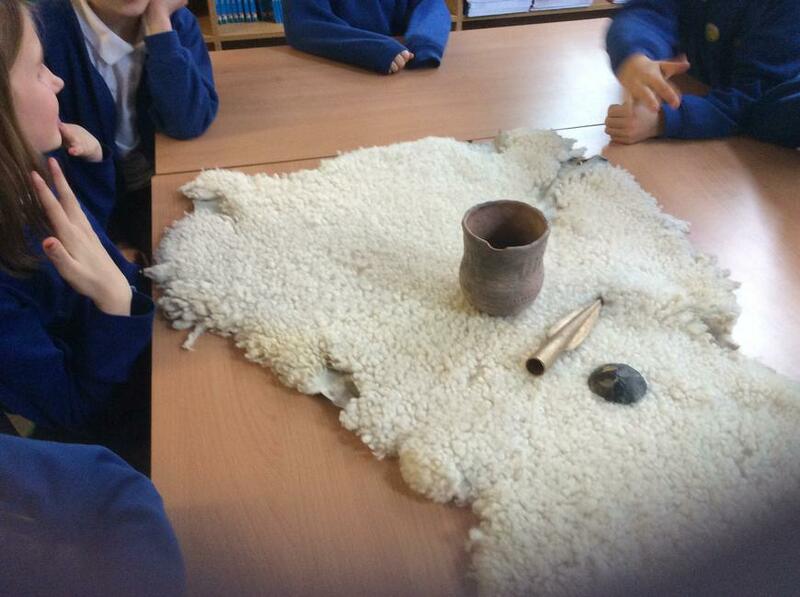 In R.E we have been discussing parables that Jesus told and have shared some different examples. 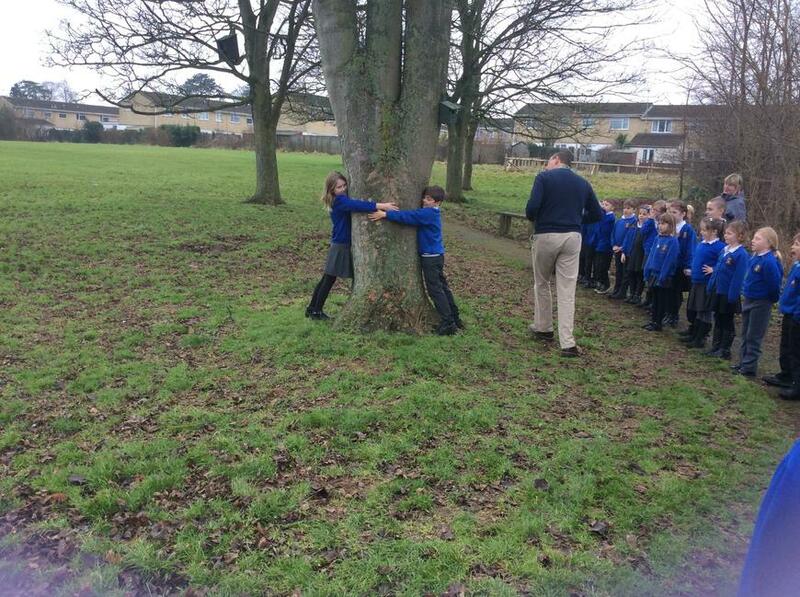 This week we shared the 'Parable of the mustard seed' and used this as a stimulus to produce a Kindness Tree showing positive behaviours that can make a difference to our school community e.g. providing a listening ear to others, cooperating in a helpful way. 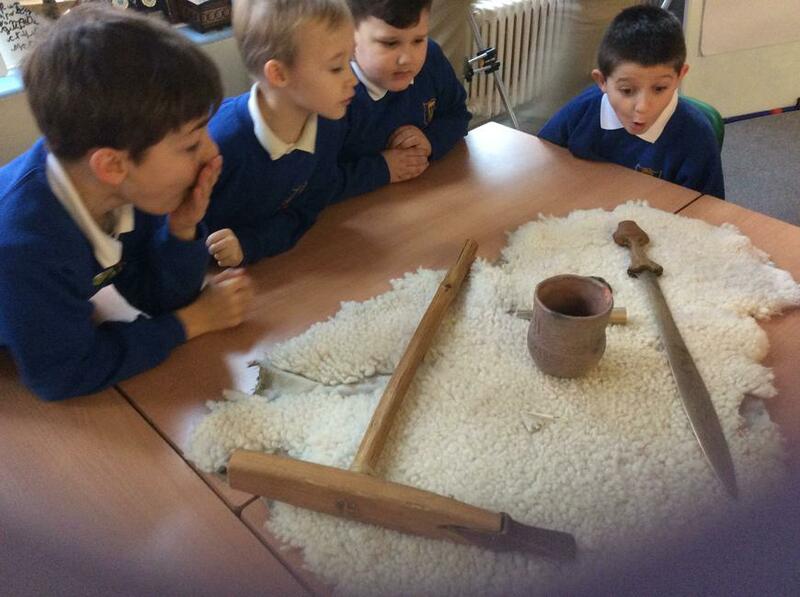 We have had lovely snow photos from Lily-May and Anais to share. This term we would really like to continue with our reading focus and need your support to hear your child read at home. We cannot stress the importance of your help with this skill as a good reader goes on to become a good writer. 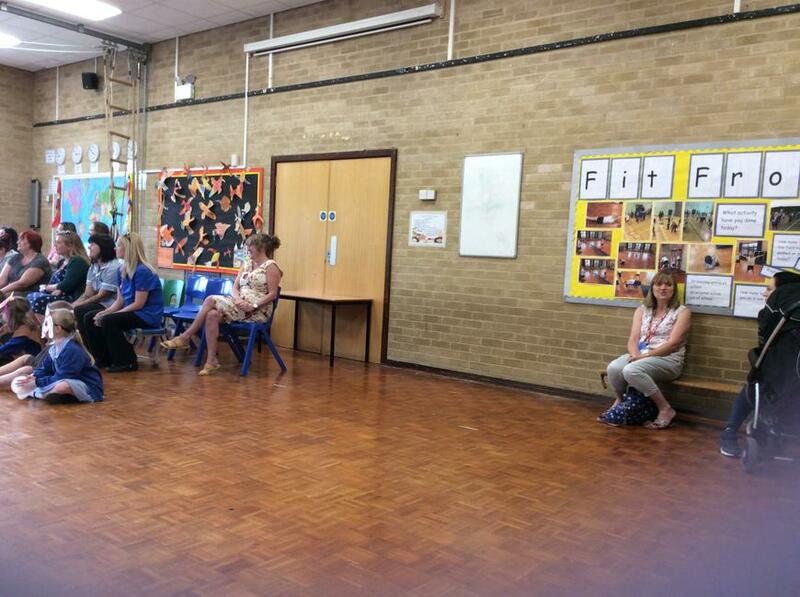 We are happy to discuss strategies with you at Parents Evening meeting to support. Our Class Book that we are reading is a classic - The Iron Man by Ted Hughes. Ask your child what has happened in the story so far and if you have it on your book shelf at home they could read that favourite part so far to you. 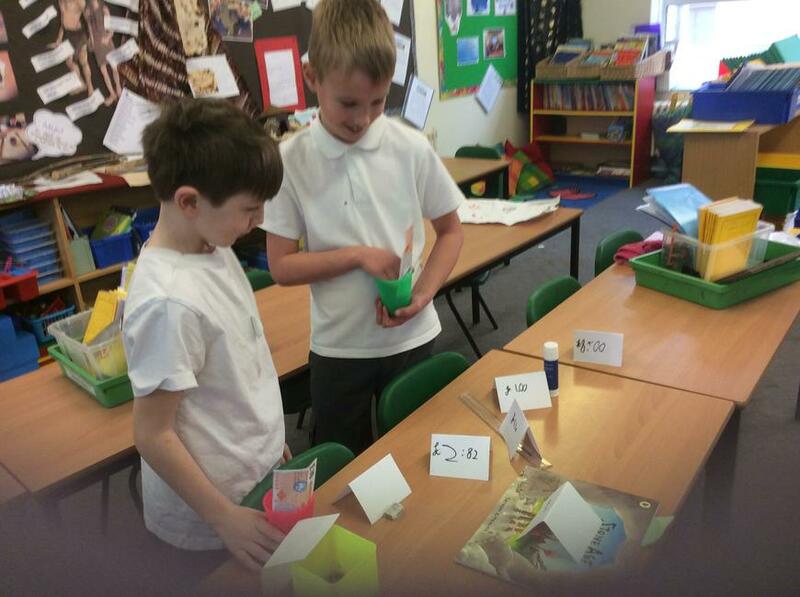 Maths learning has been adding and subtracting money using number lines. 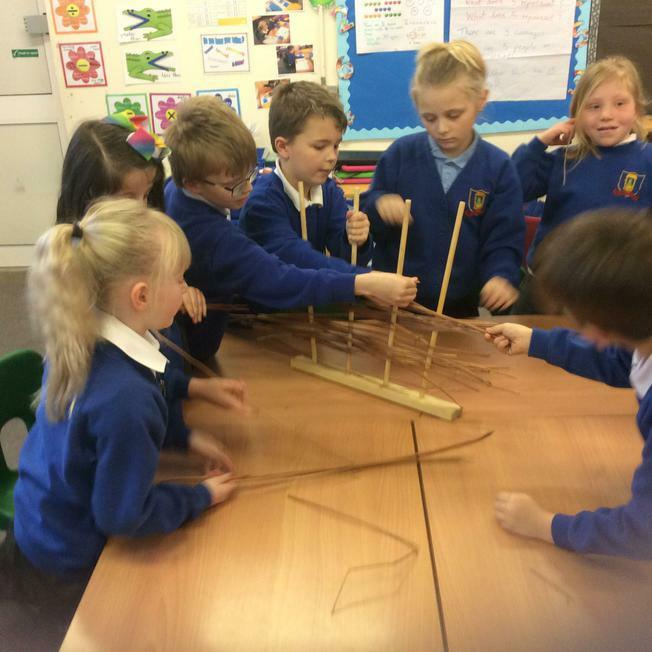 Some children took the challenge and were able to work out mentally. If you get a chance pop to the shops and let your child buy something. 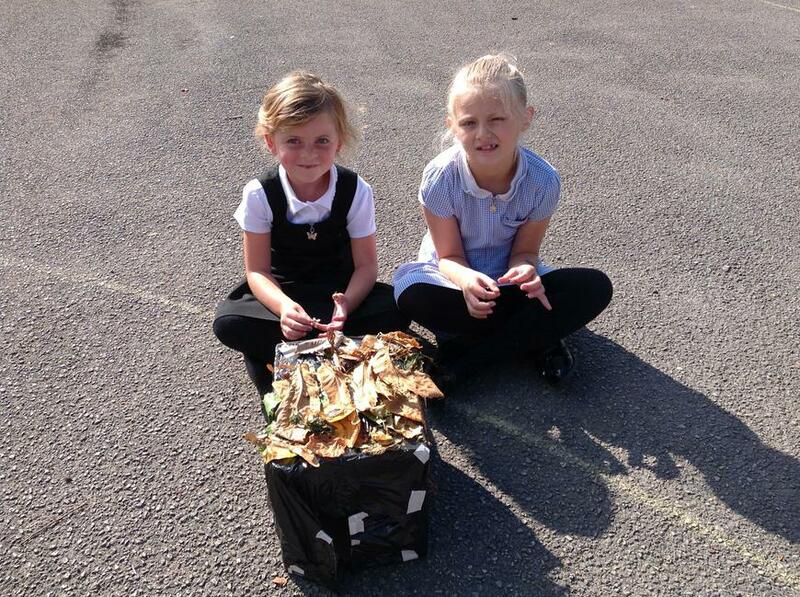 Can they work out how much change they will get back? 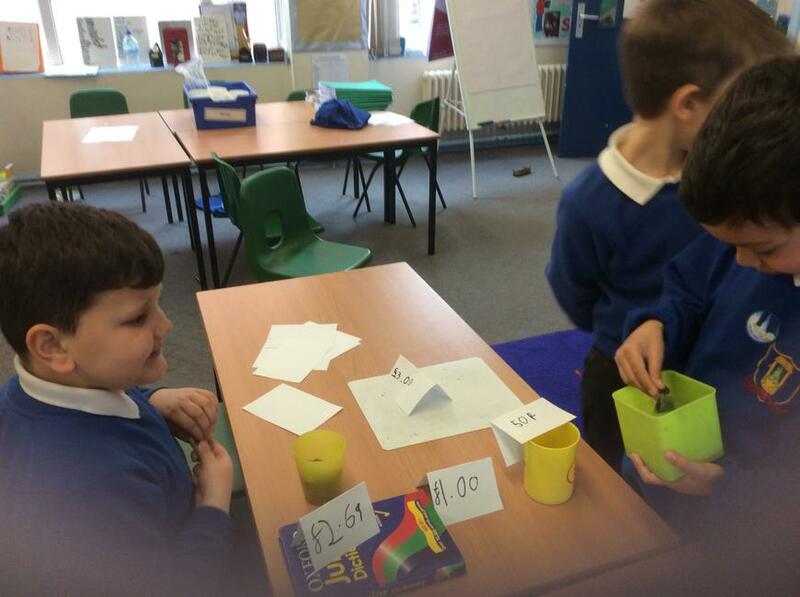 Can they work out the total of two items? Can they also help you to pay with the correct amount of notes and/or coins? 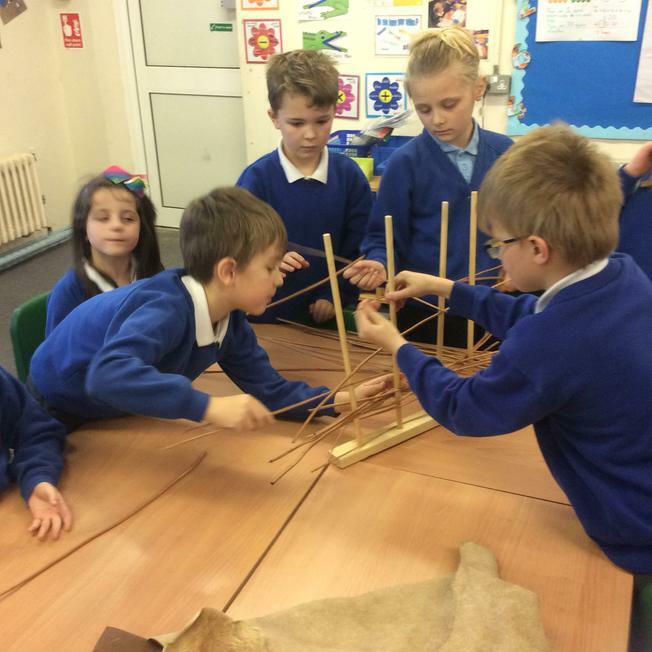 We have been getting excited about starting our Stonehenge information page and have used the facts collected to write our introduction. 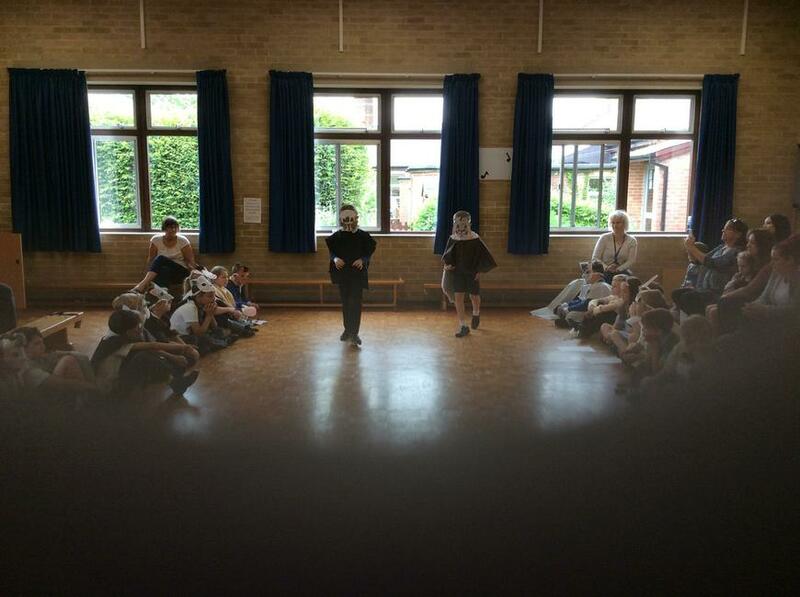 On Wednesday we continue with our football training and on Friday we have PE with Mr Kingwell until the end of term. 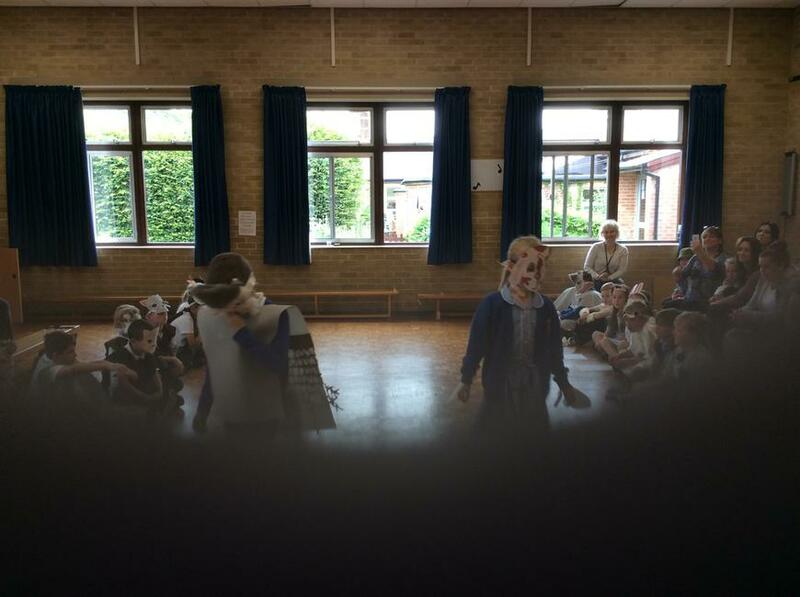 Please can you ensure that your child has their correct PE Kit in school so that they are well prepared. Our focus in assembly this term is Courage and this week we discussed the courage we need to just say ‘sorry’ and different ways that we can put things right if we have made poor choice. Good news! The author visit to Chippenham library is now rescheduled to Monday 26th March. If you have purchased a signed copy of the authors book then the children will receive it at this event. Our Road Safety training is now on Thursday 22nd March, the children will need a coat as they are going out with the Road Safety Teacher in small groups to safely cross the road. Thank you for all your support with weekly homework and a special well done to all the children that complete this on time every week without any reminders. 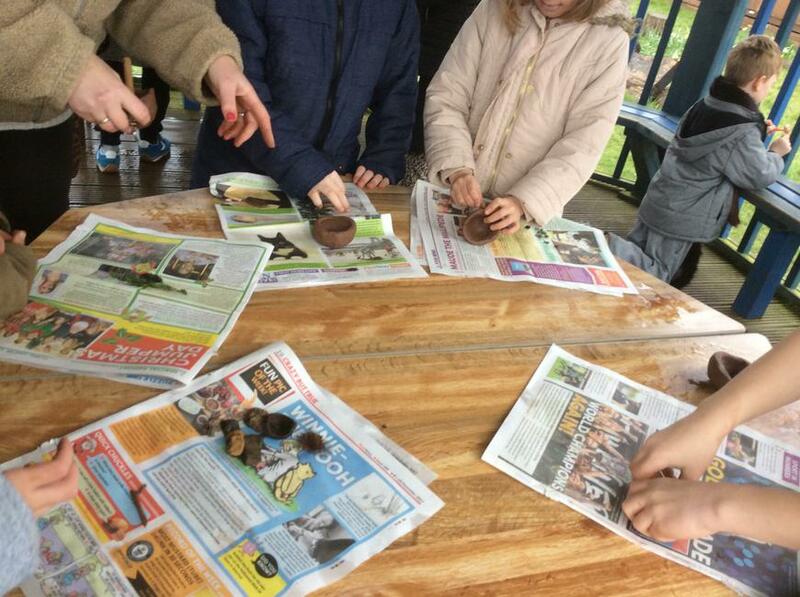 Our last Project Homework for this term needs to be handed in on 19th March and we are excited to see what the children will produce. Any questions about the homework, please come and talk to us,as we are here to help support you. This can also be discussed at Parents Evenings on - Thursday 22nd March (early) and Tuesday 27th March (late). The appointment signing up forms will be going up this week. 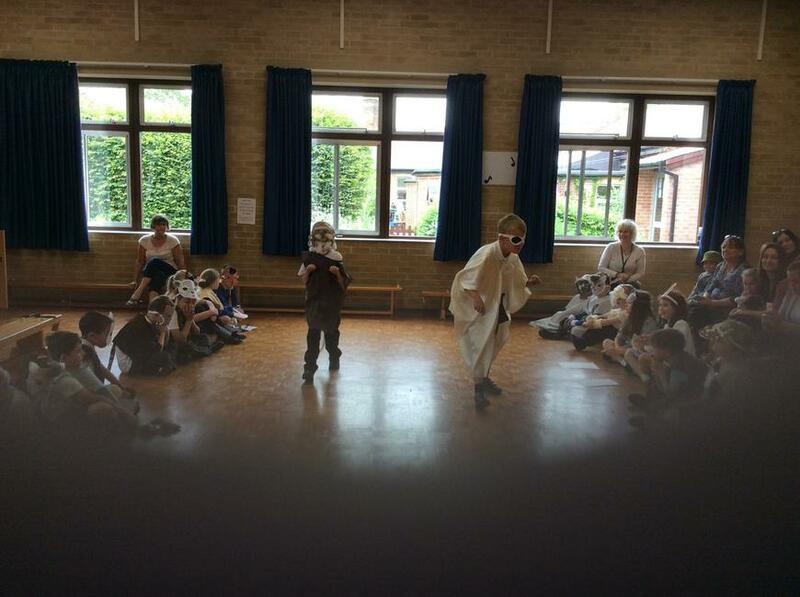 World Book Day - can you identify the books and characters that we dressed up as? 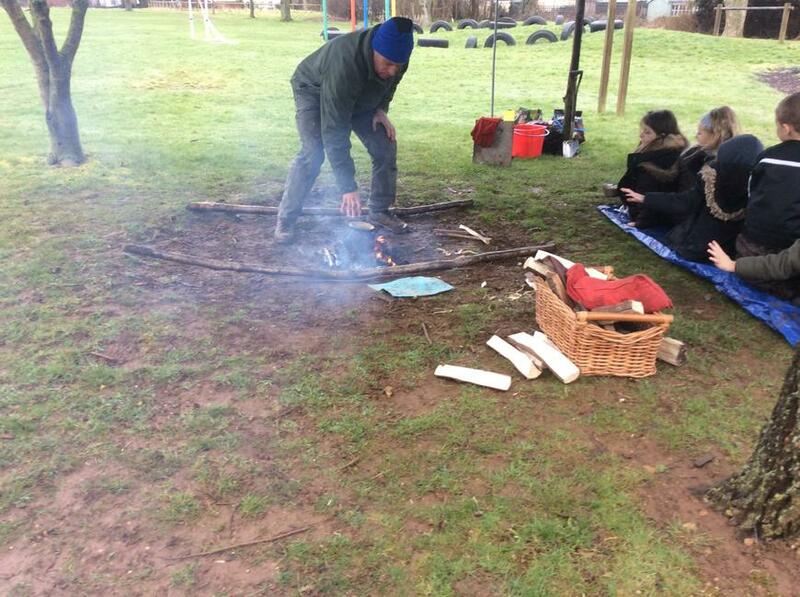 What a cold week it has been but in Canada class we have been on fire with our research about Stonehenge. Did you know antler bones were used to dig this famous monument? 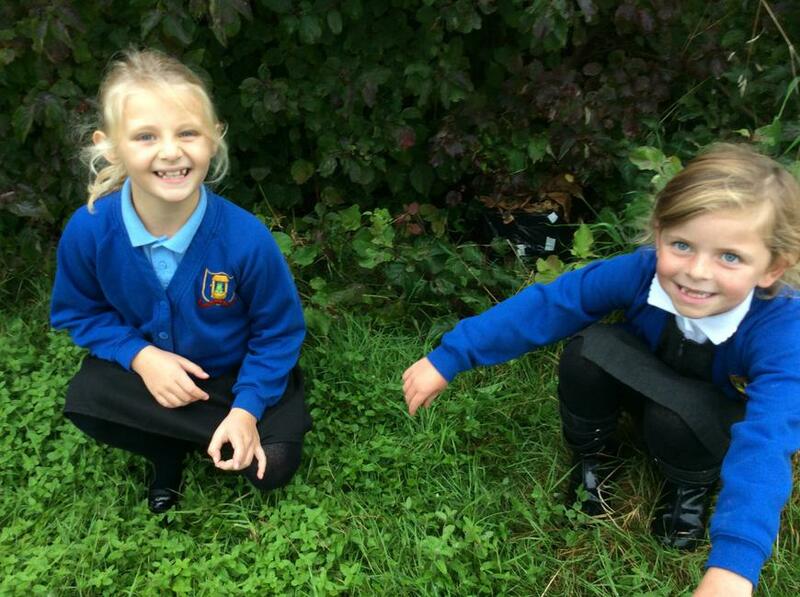 Ask your child for more interesting facts we have found out. In our Computer session, we went on a 'virtual tour' around the site to help our understanding of how it looks in real life. With the information obtained, children will be putting together an interesting, information leaflet about this world famous attraction. Well done to all the children for completing their NSPCC Maths challenge. 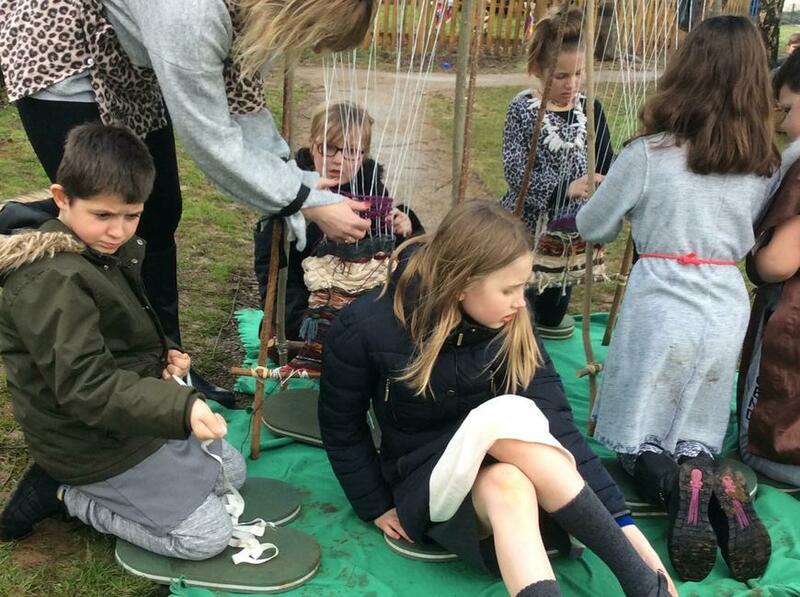 Children all completed Task 1 and then most children were keen to complete Task 2 and some even went on to complete the most challenging Task 3. Thank you to families and friends for sponsoring the children. 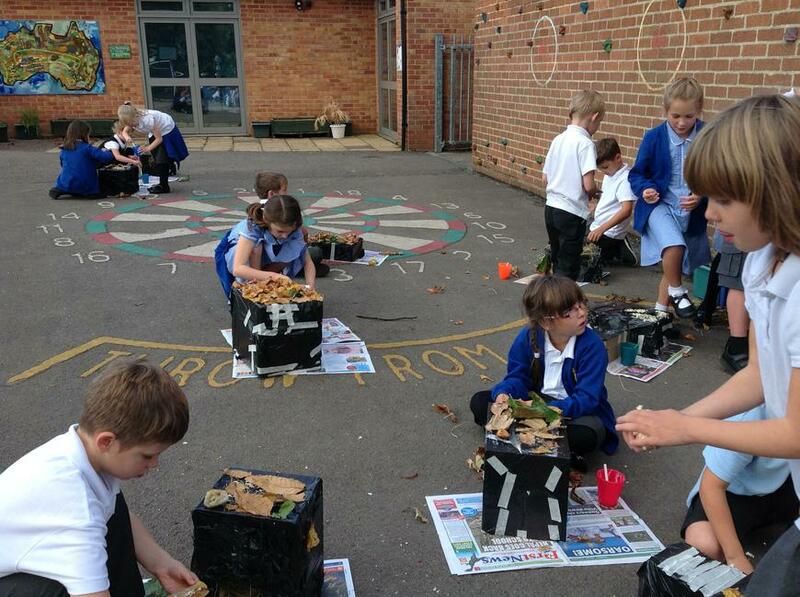 With your help the school has raised over £1,000, an amount that both the NSPCC and the School are really proud of. Throughout the day, children shared Buddy Reading with Nigeria Class, they wrote a book review on our class book ‘Flat Stanley’ and we held a class quiz. 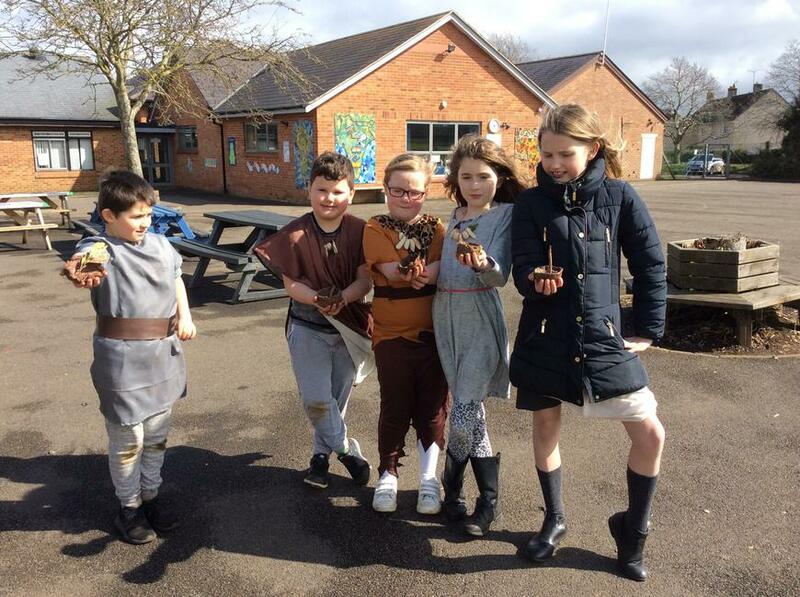 Well done to the winners of the quiz, they will receive a bookmark. We hope you will support your children in the reading challenge as this will really help their personal reading progress. Unfortunately due to the snow, our practical Road Safety training has been postponed. We will let you know as soon as a revised date has been arranged. 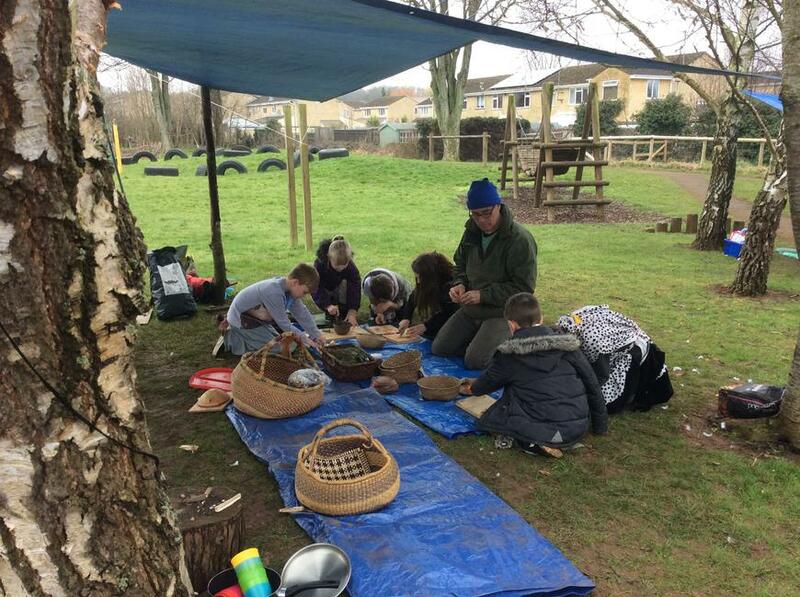 With this adverse weather please ensure children have suitable coats and footwear for playtime and lunchtime as we feel it’s important for the children to get outside and get fresh air. Have a restful weekend. Keep warm and enjoy your fun in the snow! We look forward to seeing the snow sculpture photos that you take. Hope you all had a restful week off. It’s back to normal in Canada Class. This week we have already had a trip to the library and played an alphabet game using book. 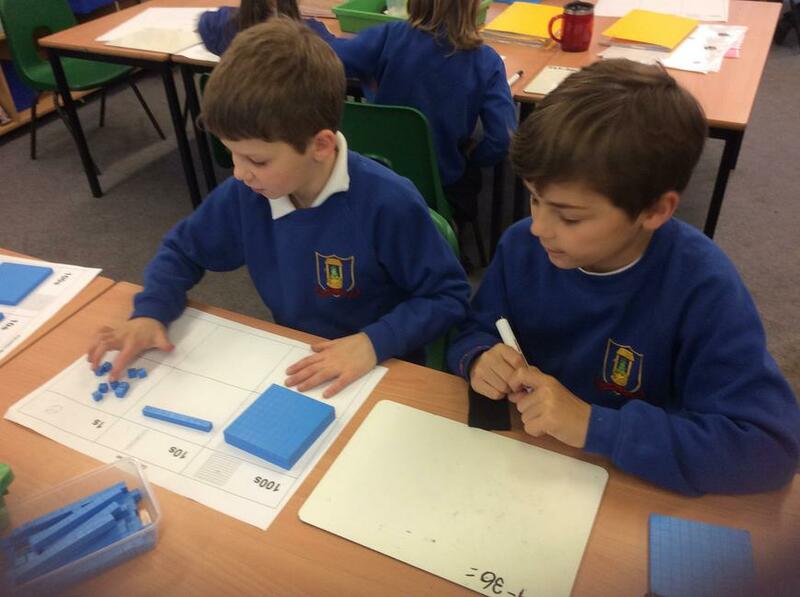 We have been busy dividing higher numbers in Maths using equipment and our times table knowledge. 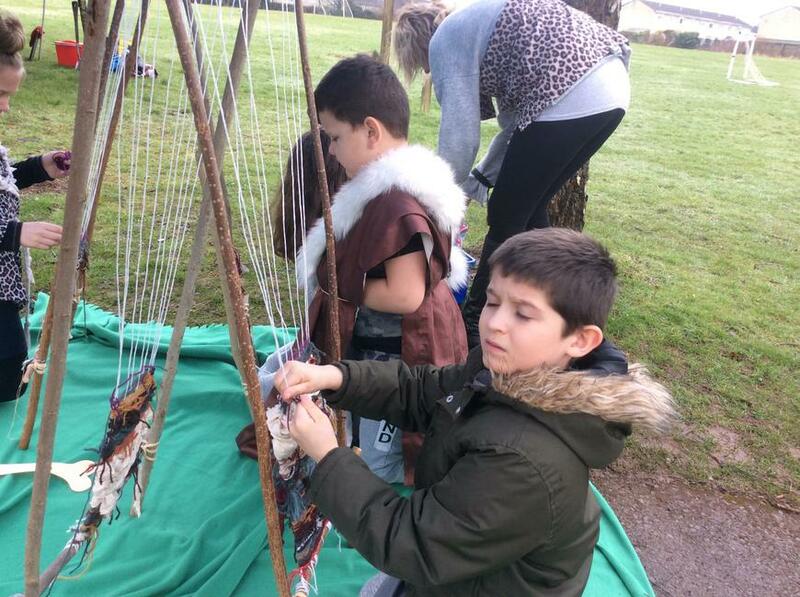 In English we have innovated our own story for Stone Age Boy. 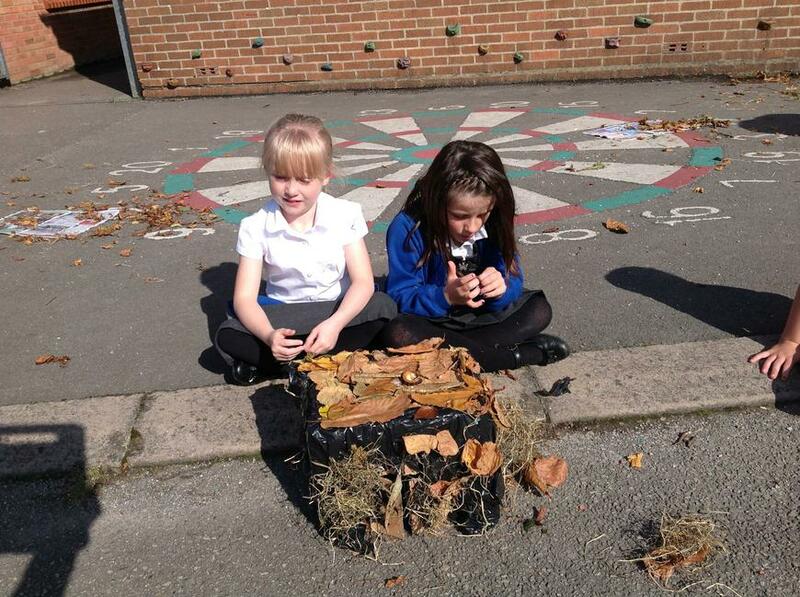 Ask you child to explain what an innovated story is. 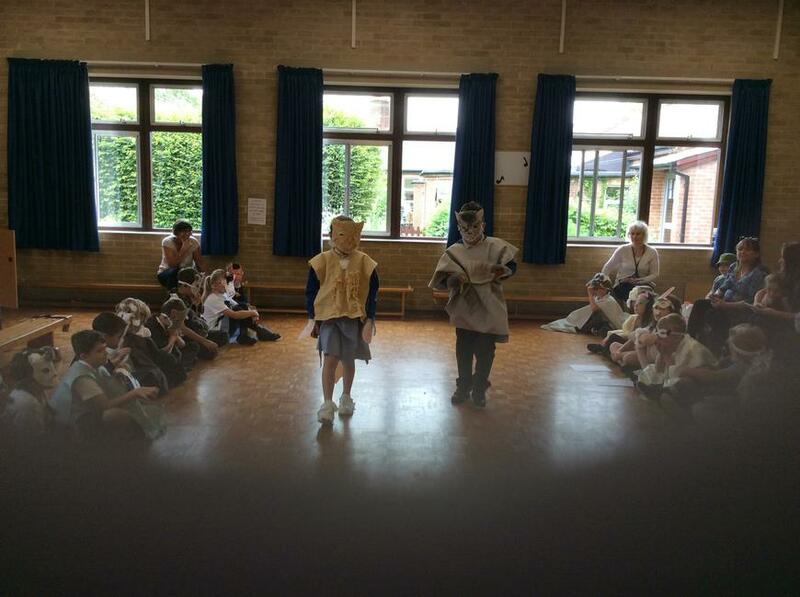 The children have been able to produce interesting stories of their own showing creative ideas. 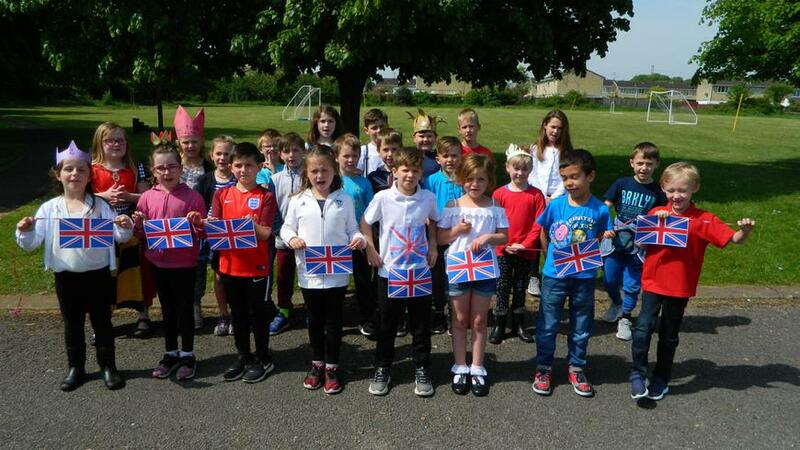 The project homework that has been handed in and presented has been of a high quality and we would like to thank you for supporting your child. 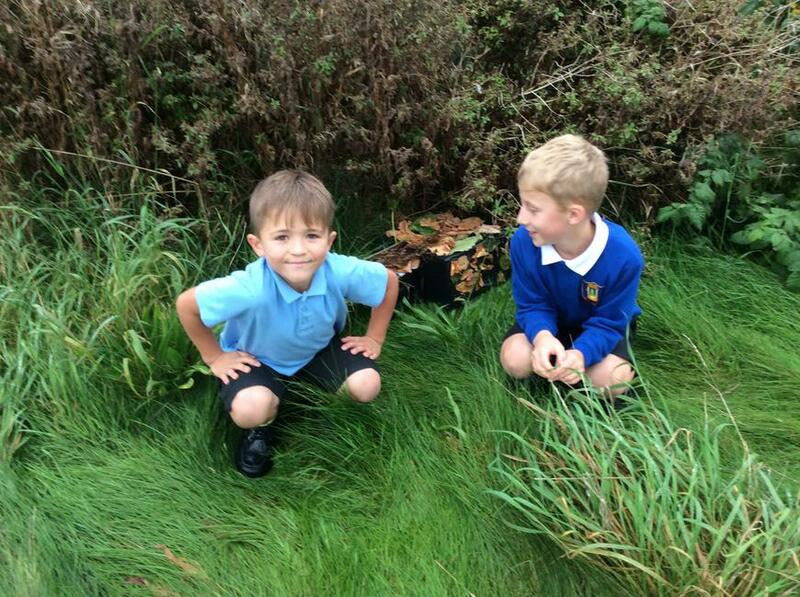 The children really thrive on the praise and merits and also the inspiration they share with each other. PE - this term we are very fortunate to have a football coach visit our school. 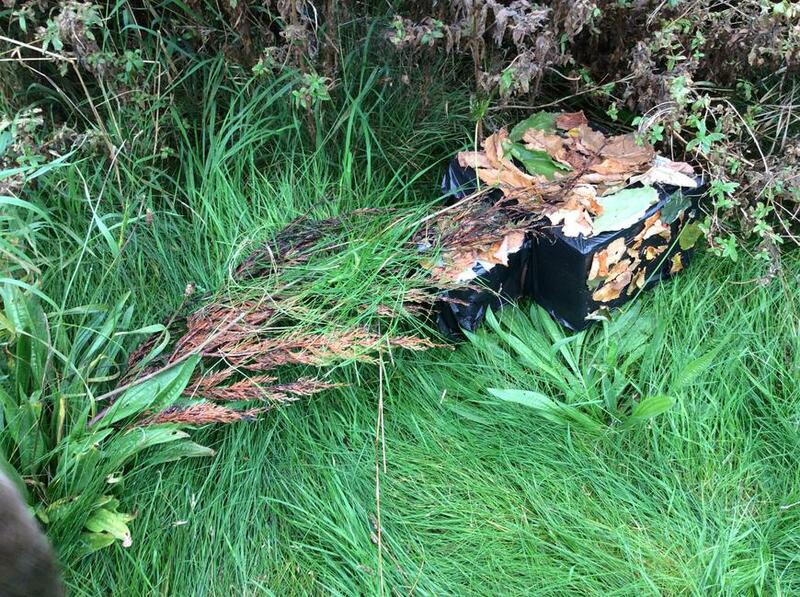 Training is outside and children do need trainers, warm navy or black joggers/leggings and a hoodie style top. 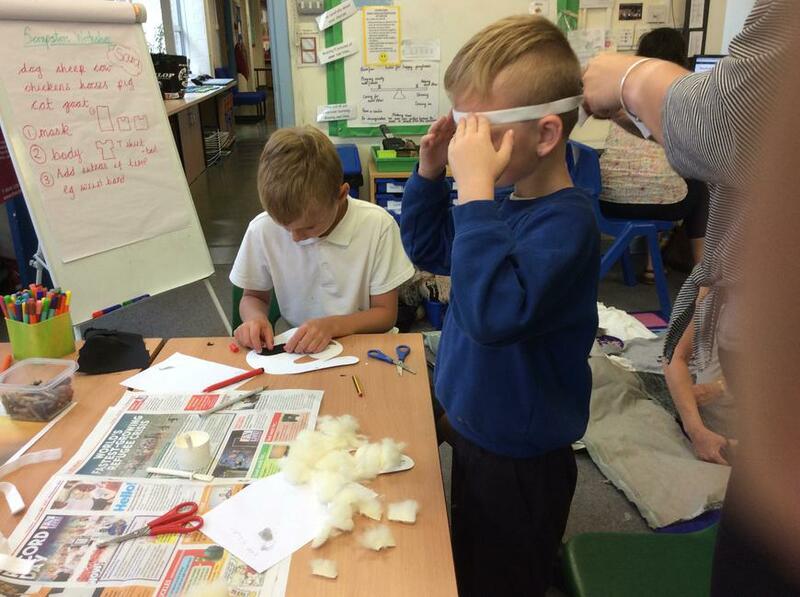 We need your support in making sure the correct kit is in school as it’s essential the children get to participate. 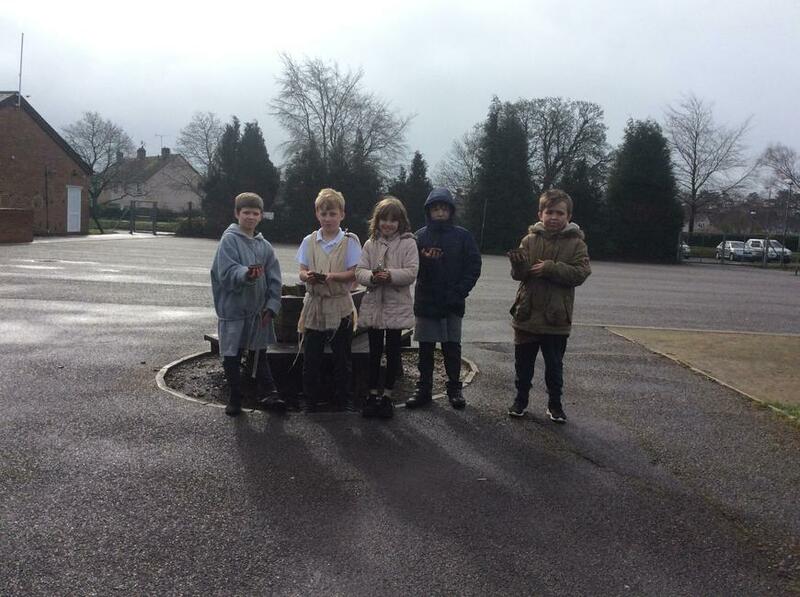 The children have also been lucky to have Road Safety Training which is provided by the Wiltshire Council Road Safety Team. 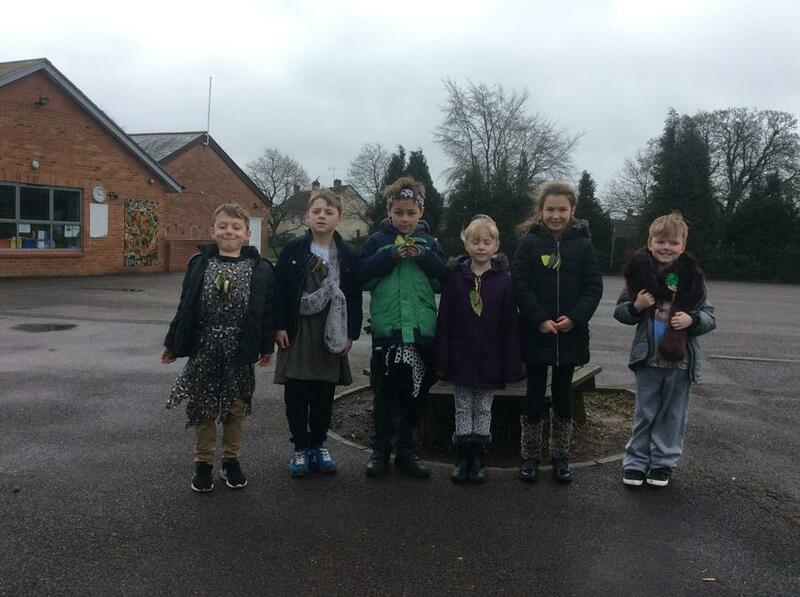 The focus was to make children aware of finding safe places to cross and to be aware of where they should cross the road. 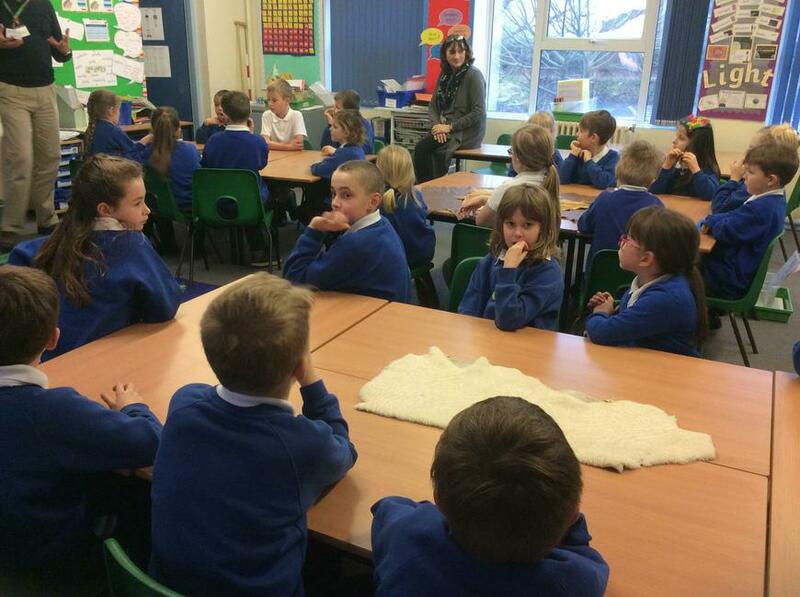 Lots of discussion took place re use of mobile phones whilst driving. 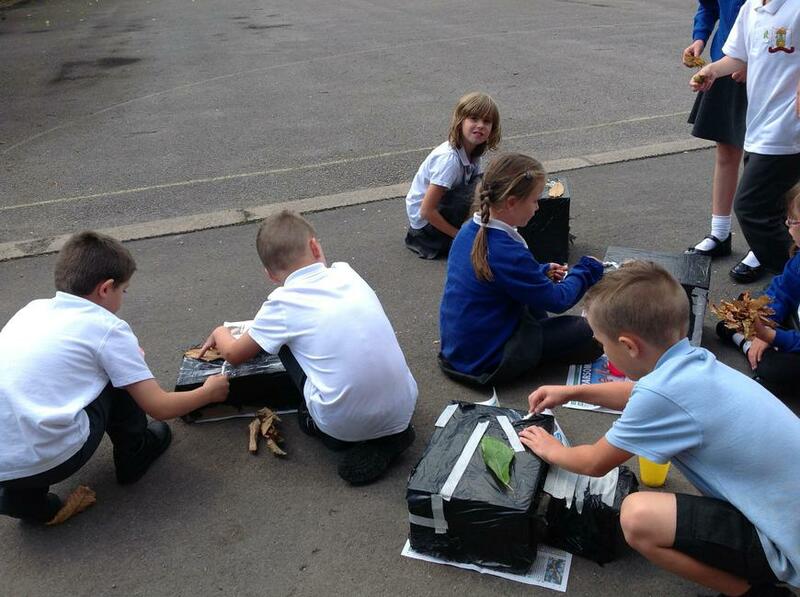 Next Friday, the children will be involved in practical road crossing sessions in small groups. This will consolidate the work that we did in Term 2 when we focussed on writing instructions for Crossing the Road safely as a follow-up to the Hodgeheg. Don’t forget it’s World Book Day on Thursday 1st March. NSPCC fund raising - thank you for the sponsorships that the children have collected, we will be testing their Maths questions on Monday and sponsorship money, if possible needs to be collected by Wednesday. 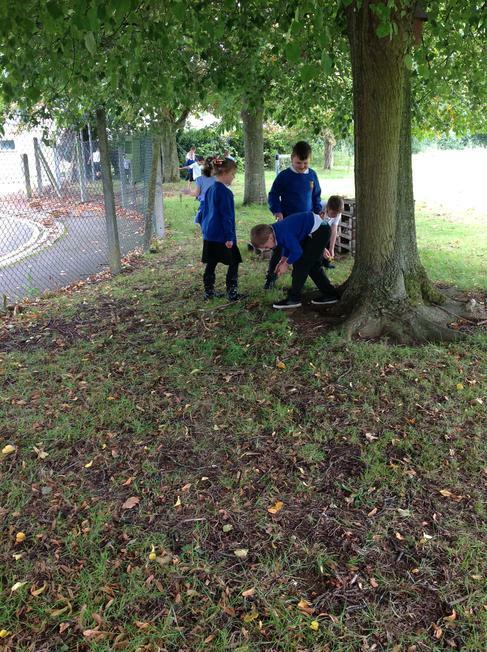 We enjoyed our visit to the Chippenham Library today and the children were very sensible walking along the road. At the library we enjoyed listening to 2 stories: 'The Rabbit Belongs to Emily Brown' and 'Kitchen Disco'. 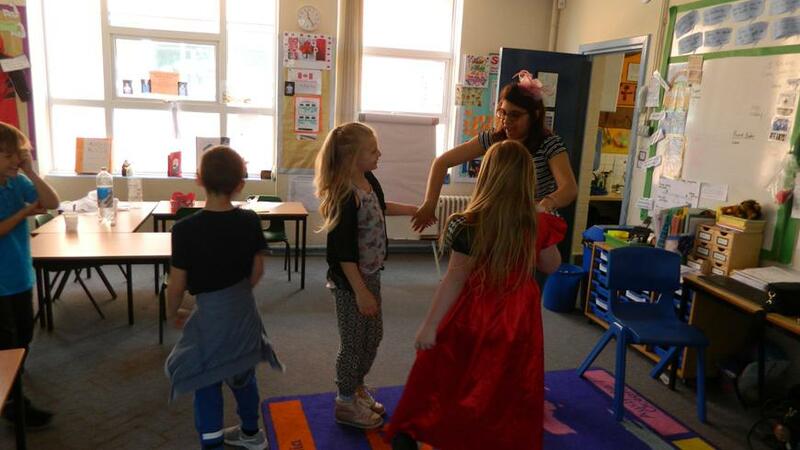 We also played the alphabet game which involved us getting into alphabetical order by our surnames and we then repeated the game with a book of our choice. Some of us have chosen library books to take home and read. Remember the library is a free resource to use and has a range of interesting books for all interests. The library is hopefully going to rearrange our visit to hear Anna Wilson share her books so we will be able to get our signed copies of her latest book then. I will let you know as soon as I know more details. 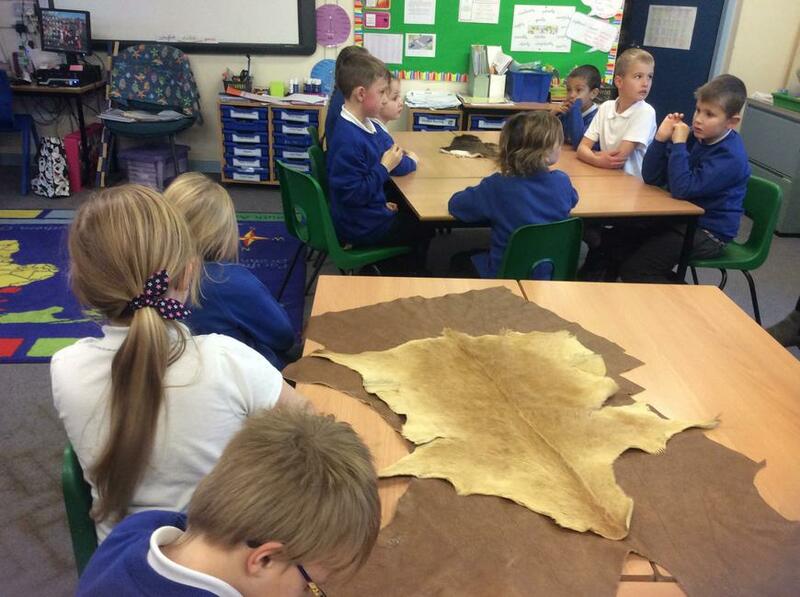 As half term approaches Canada class is working really hard, we now know lots more interesting facts about the Stone Age. 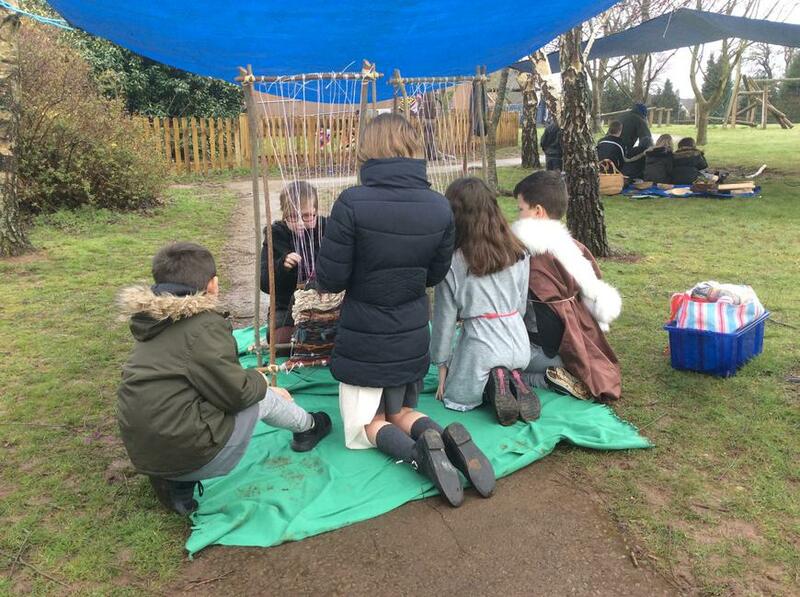 This week we have been looking closely at the dwellings that they would have used and have identified the materials that would have been used to make them. 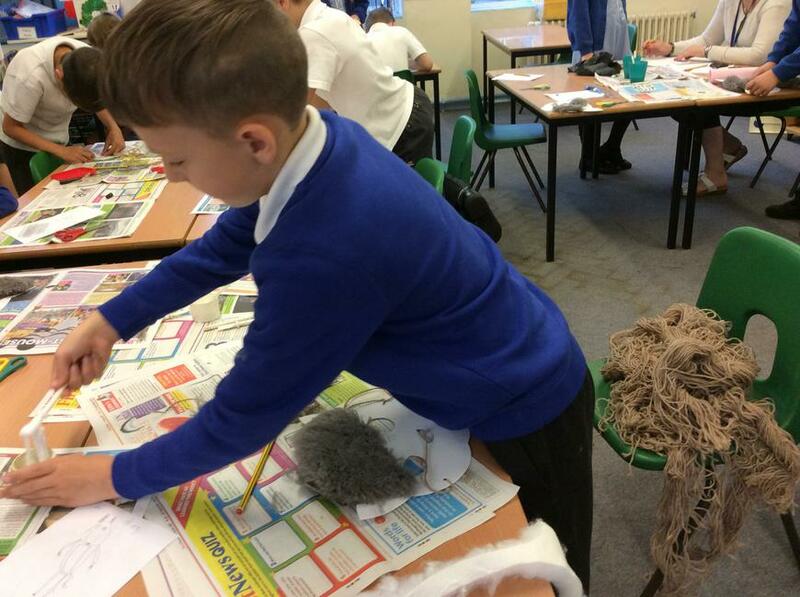 Also this week, we have been working on our story maps for the 'Stone Age Boy' story. We have read the story and are now using our maps as a basis for retelling the story. 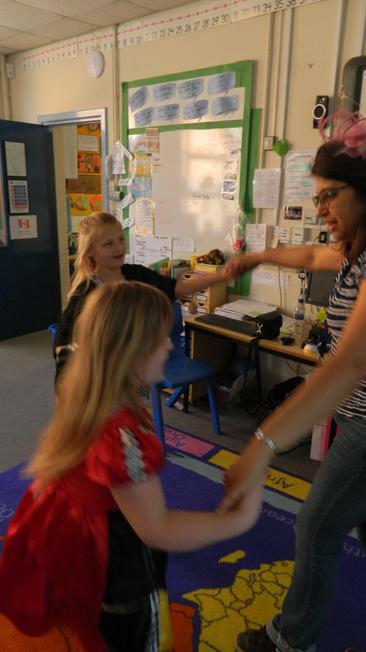 We have used lots of Makaton signs and even made our own actions to help us recall the story. 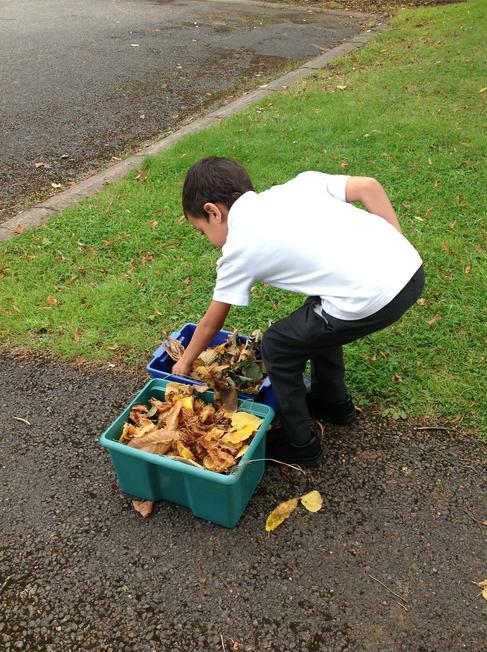 It’s been great fun and it’s amazing to see how the actions help us to memorise information. We have just finished our class book - 'Ug' and have now moved onto reading - 'Flat Stanley'. Maybe you remember reading this when you were a child? 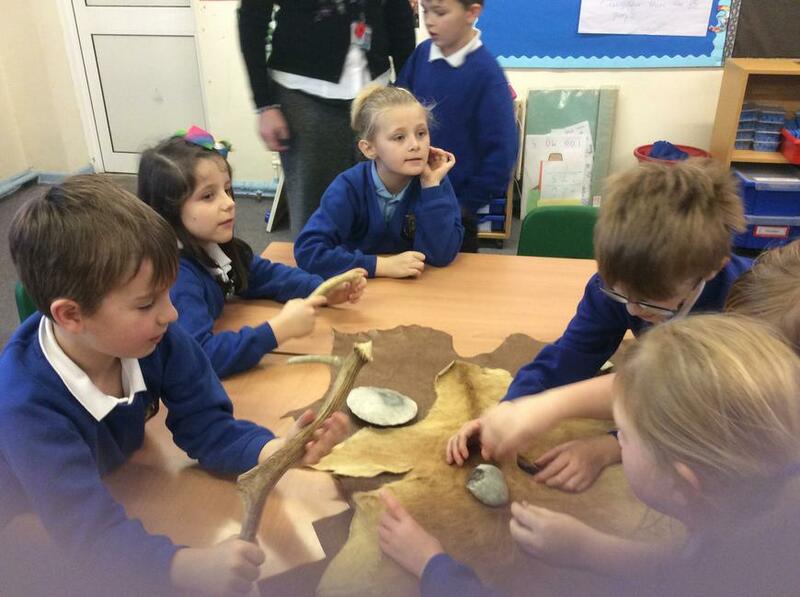 Maths has been really interesting this week as it has been Mega Maths with a Stone Age theme. We have been measuring and looking at shapes and right angles to design and make our own pendants. Please keep helping your child learn their X tables. 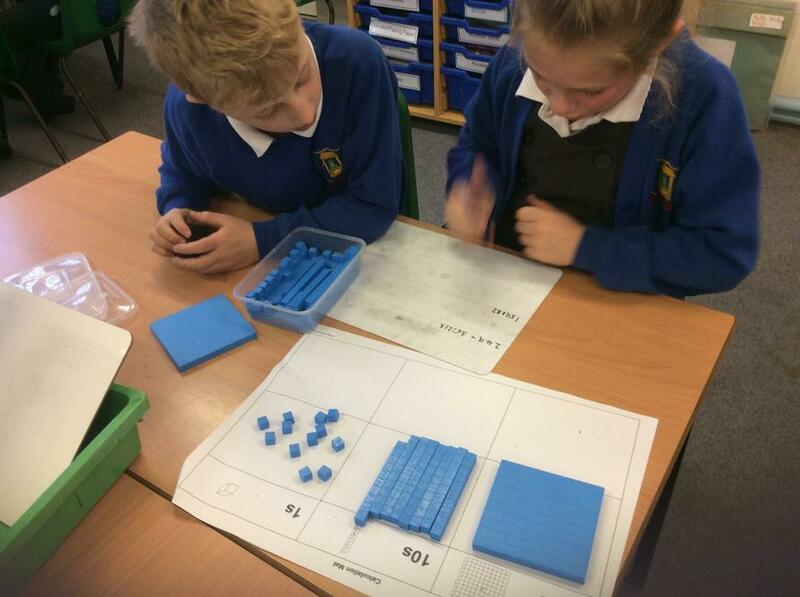 We are moving on in our Maths learning, to look at multiplication and division of 2-digit by 1-digit numbers so our recall of our X tables is crucial to our understanding and calculation skills. 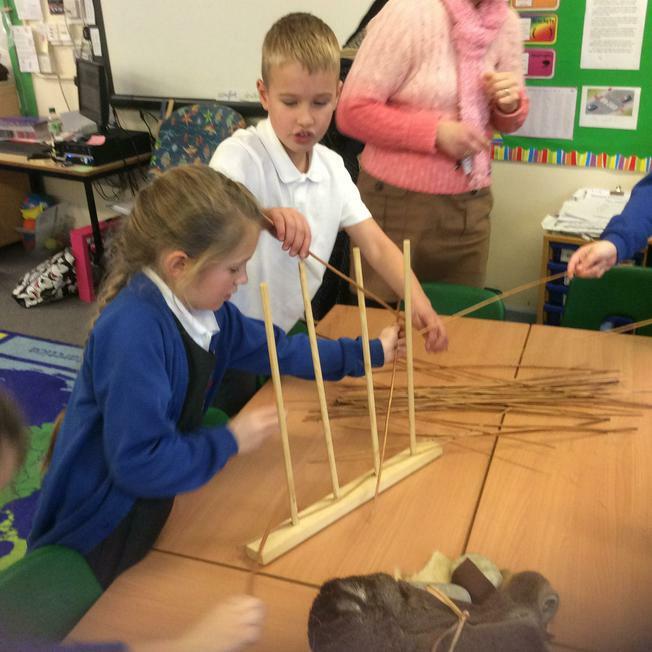 In French we have been working with a French teacher from Hardenhuish Secondary School. 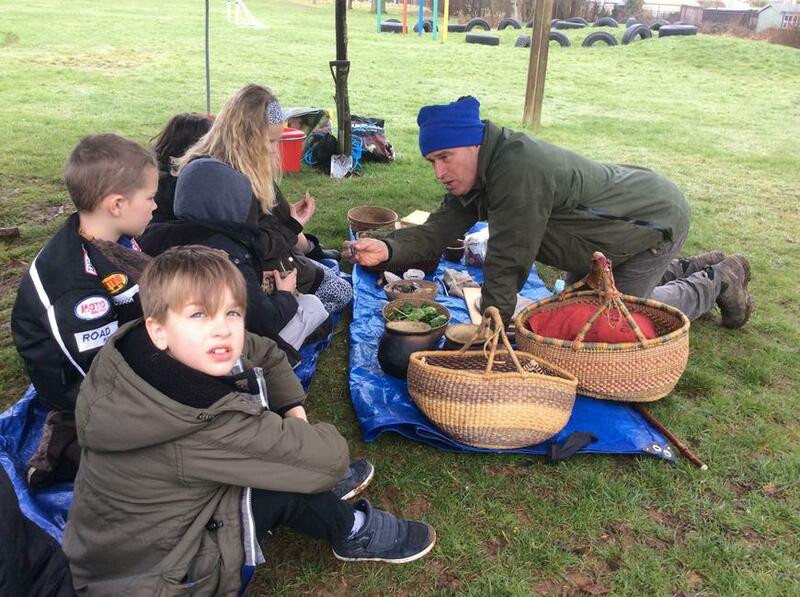 This is a very valuable experience for all the children and they have been enjoying learning the story of 'The Hungry Caterpillar.' 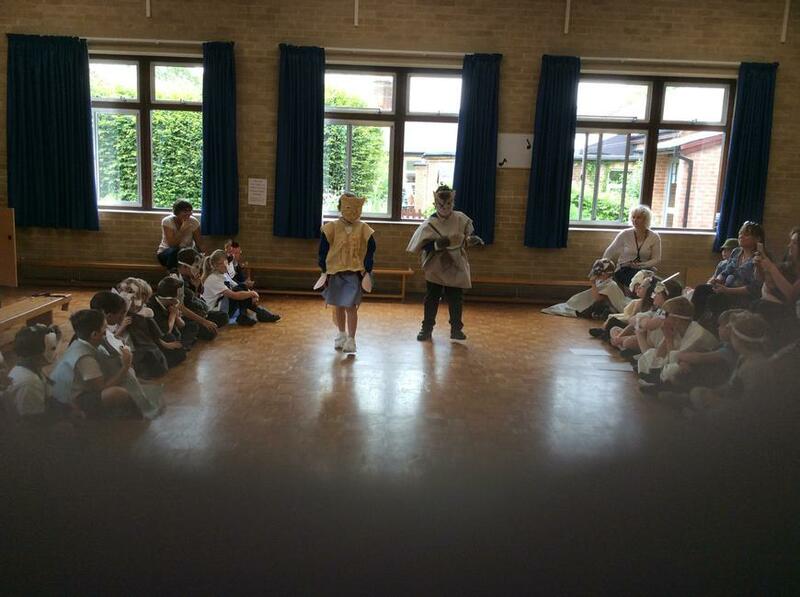 We have been impressed with their recall of the French vocabulary linked to the story. Ask your child to share some of the French words for the food that the Hungry Caterpillar eats and see if you can guess which one they are saying. 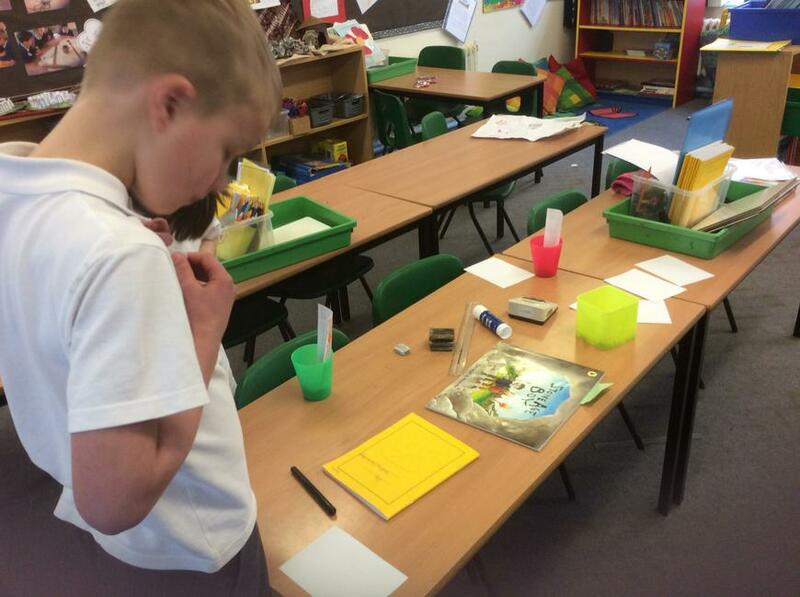 In Science we have been focussing on identifying different types of rocks. 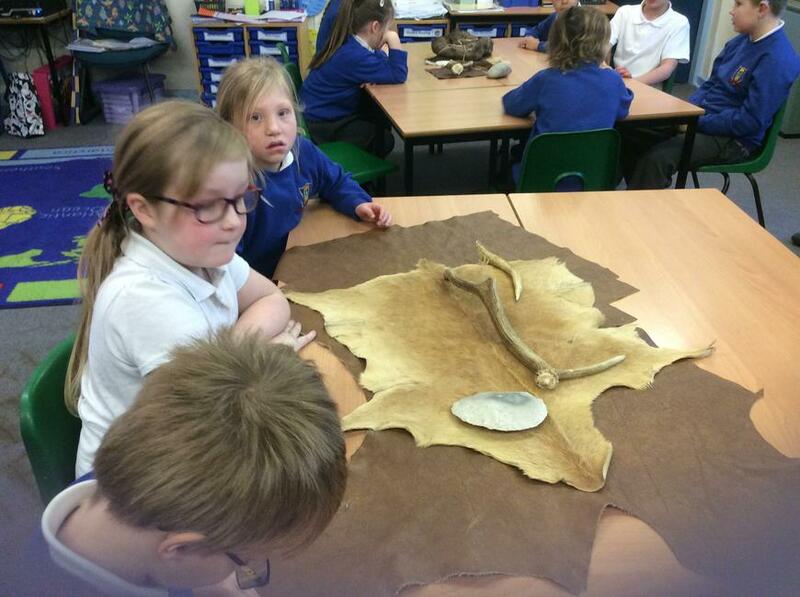 This week we have been discussing how fossils and made and also looking at some that the children have brought in from their own discoveries. Well done to Amy for going to the Heads Tea party and to Jessica for getting the Patience certificate for her Maths learning. It has been another busy week in Canada Class. 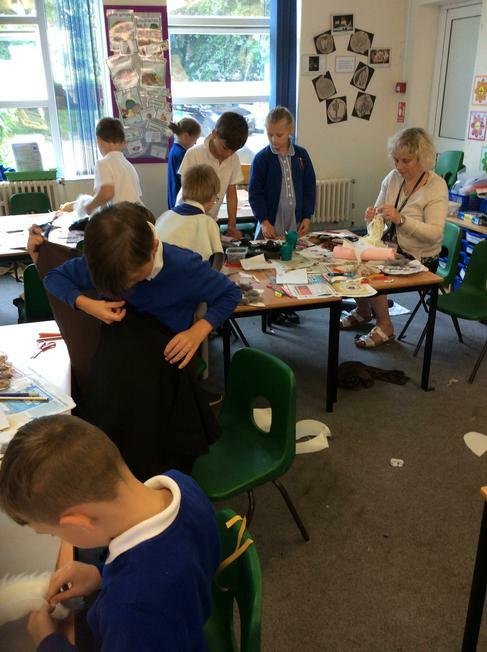 Mrs Farr is very happy to be working back in the classroom with us and has been impressed with how hard the children have been working and the progress that they have made, particularly with their writing. 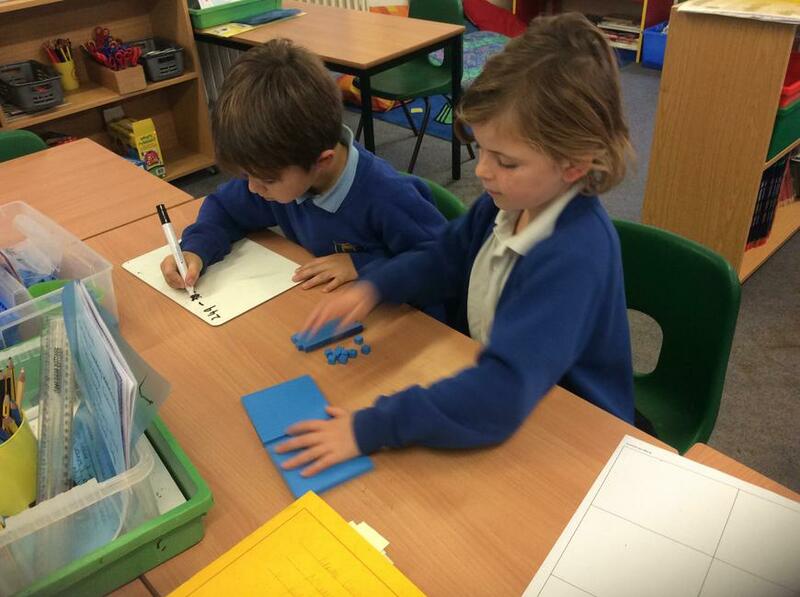 The children are really working hard on learning their multiplication and have been very enthusiastic at learning their 4x and 8x tables and also noticing patterns, for example they are all even numbers. 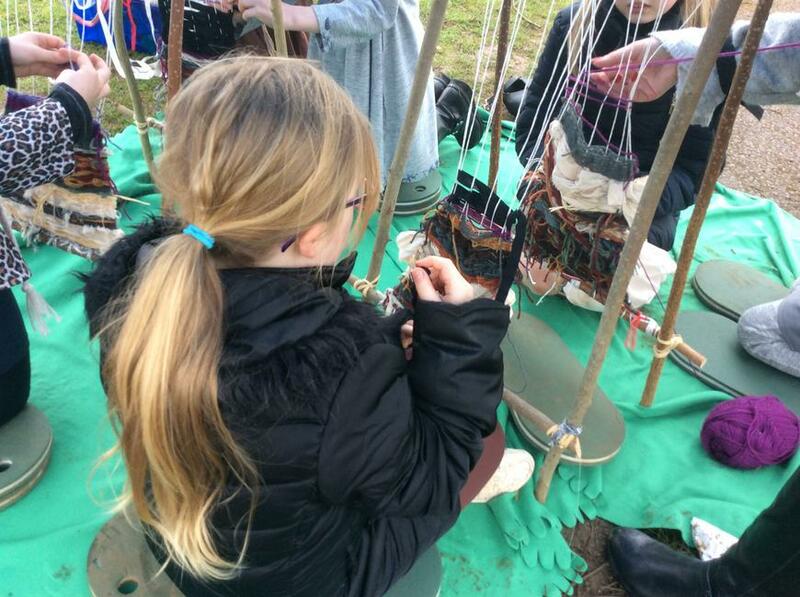 The children were also able to identify and explain more complicated patterns. 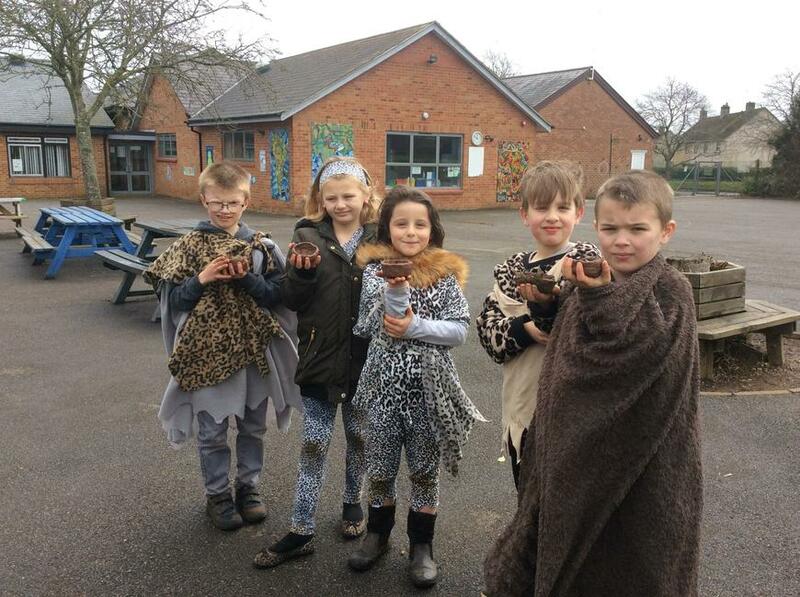 We have been learning how to use fronted adverbials in English and have been writing a postcard from someone who has travelled back into the Stone Age. 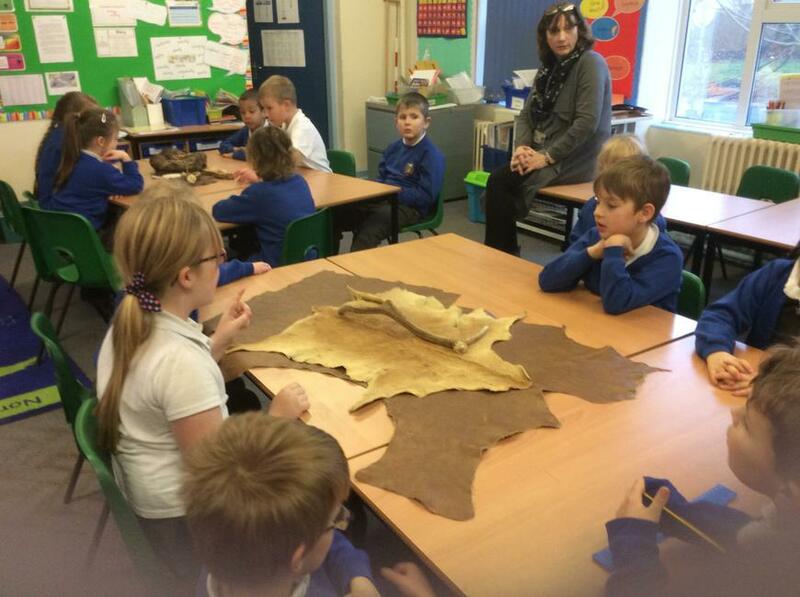 The children have been listening to the story, 'The Stone Age Boy' to get their ideas. You can discuss with them whether they think it was a dream or if it really happened? Homework support is much appreciated and it is good to see most children taking responsibility for completing and handing this in on time. 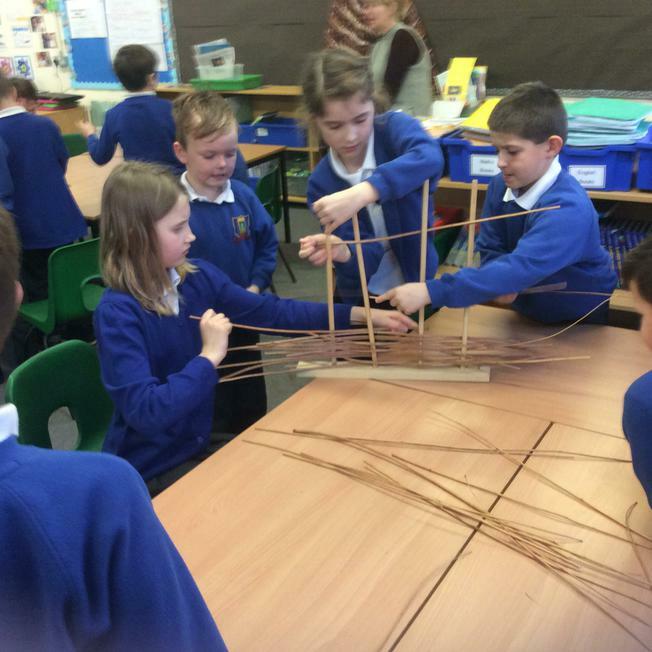 We are looking forward to seeing the 1st project task which is due on 19th February (Monday after half term). If you need any advice or support with any homework tasks, then please ask us as we are always happy to help. 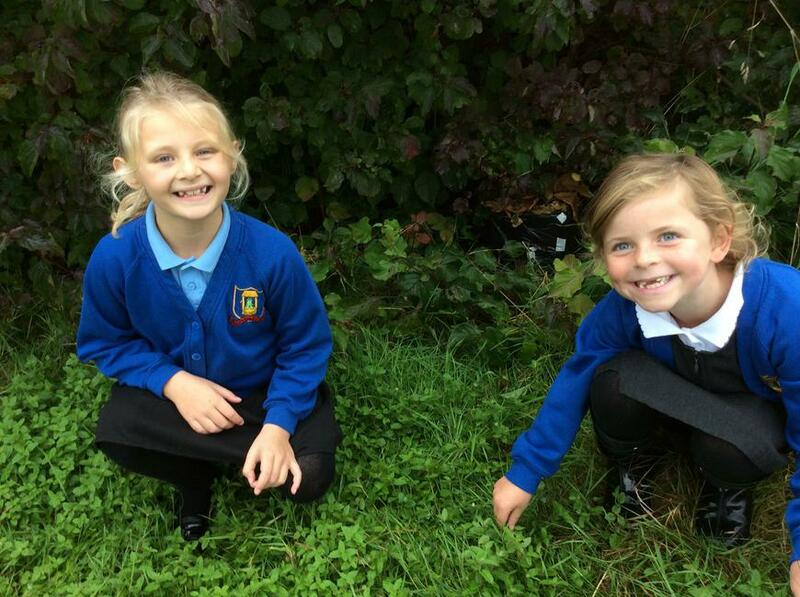 Our class plants have started flowering and we hope yours have too. 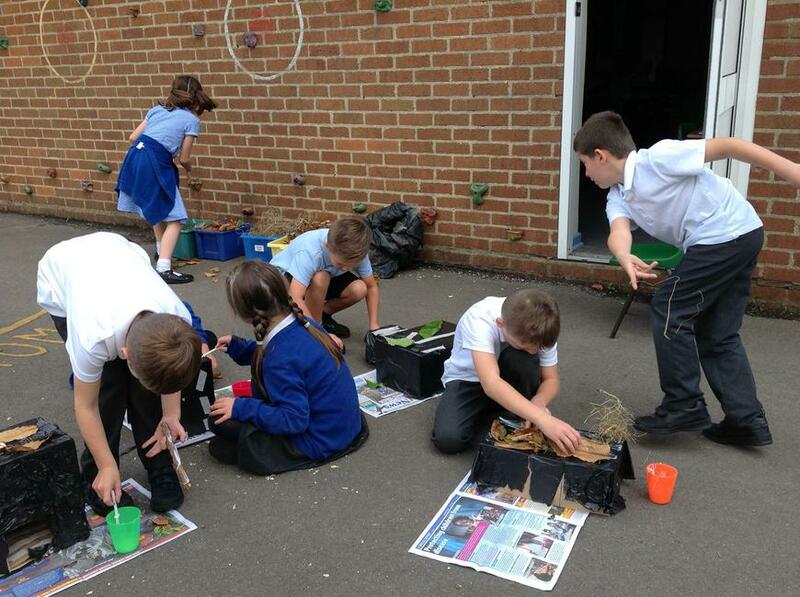 The children have taken great delight in telling us that theirs have grown taller! 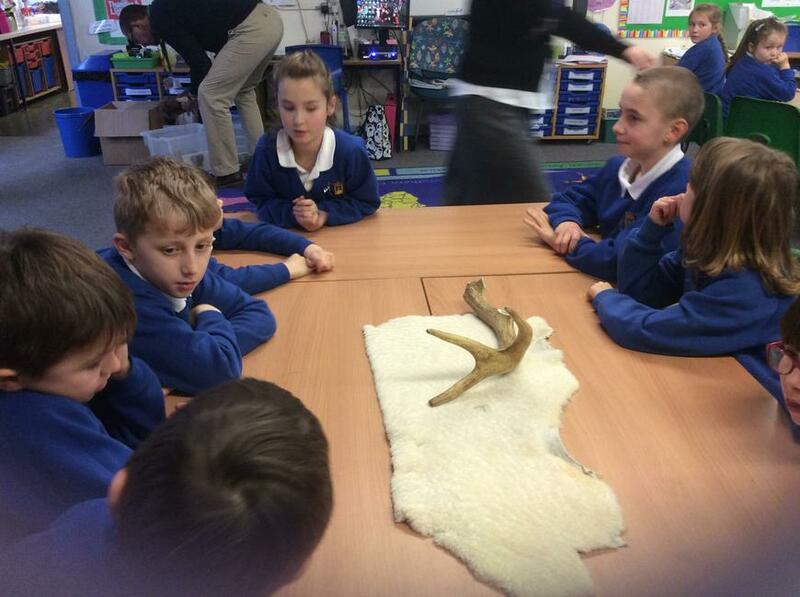 January is coming to an end and In Canada class we are finding out some amazing and interesting facts about the Stone Age. 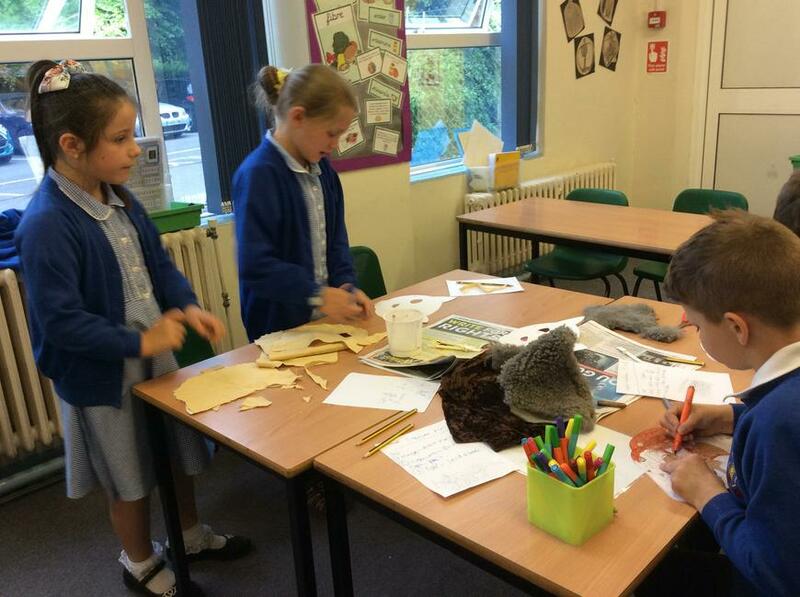 Children have been busy carrying out research through note taking from pages from a book. 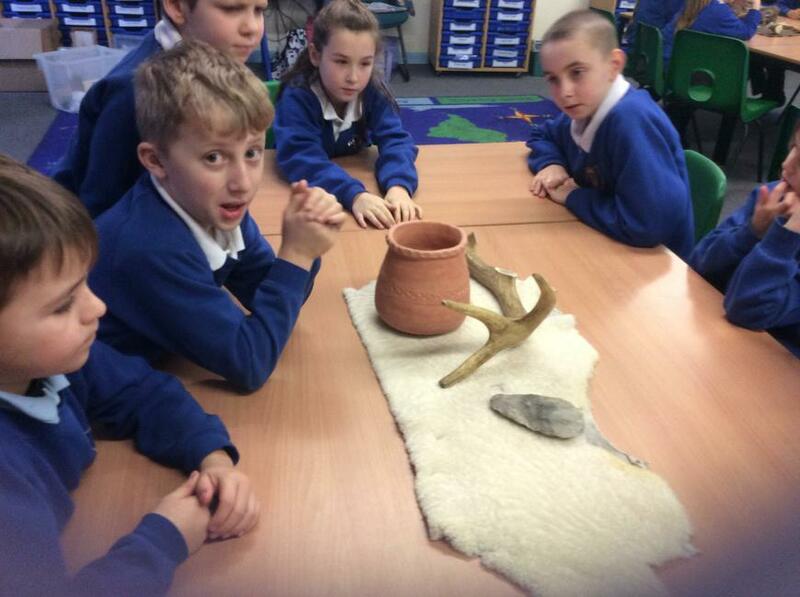 This has helped to give us a general understanding of the areas we will be looking at in more detail during our Stone Age Topic. 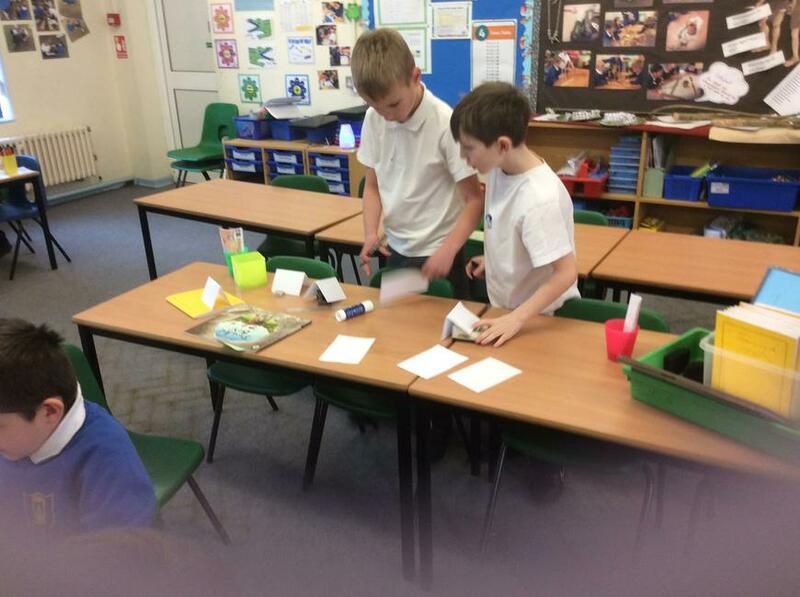 We are very impressed with how well they collaboratively carried out the task and presented their research to the class. Well done to the children that achieved their 15 club and 21 club multiplication challenge that we do every Friday as part of our maths learning. 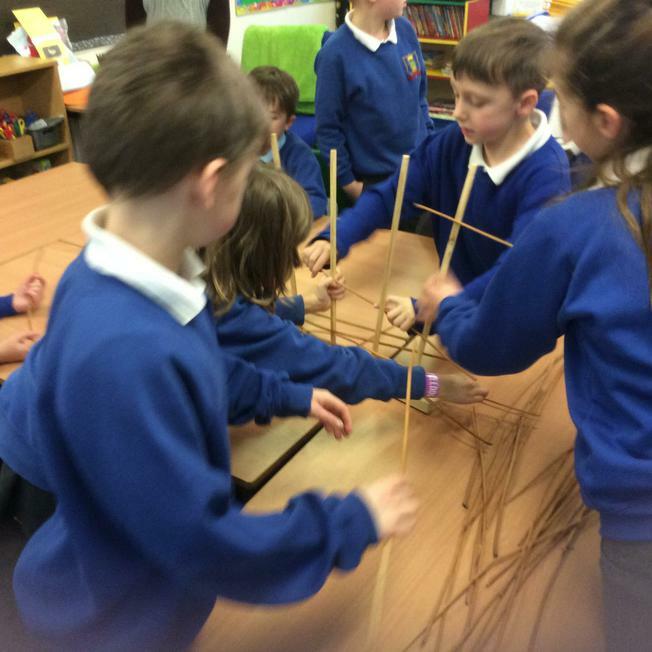 The 3x table is becoming secure so we are now moving onto the 4x table. Please ask you children to show you how to play the timestable game using a pack of playing cards. Can you beat their score? 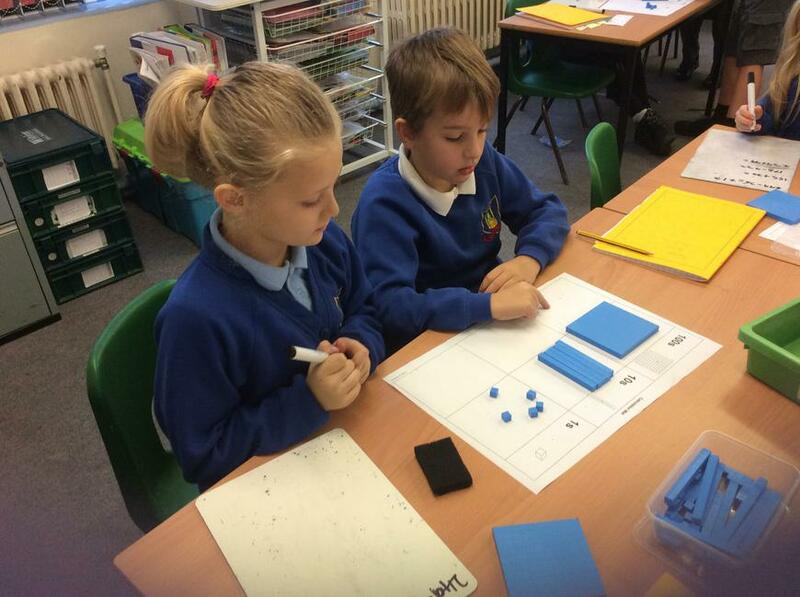 Alongside learning timetables our maths learning focus is multiplication and division. Well done to children who are consistent with doing their homework. 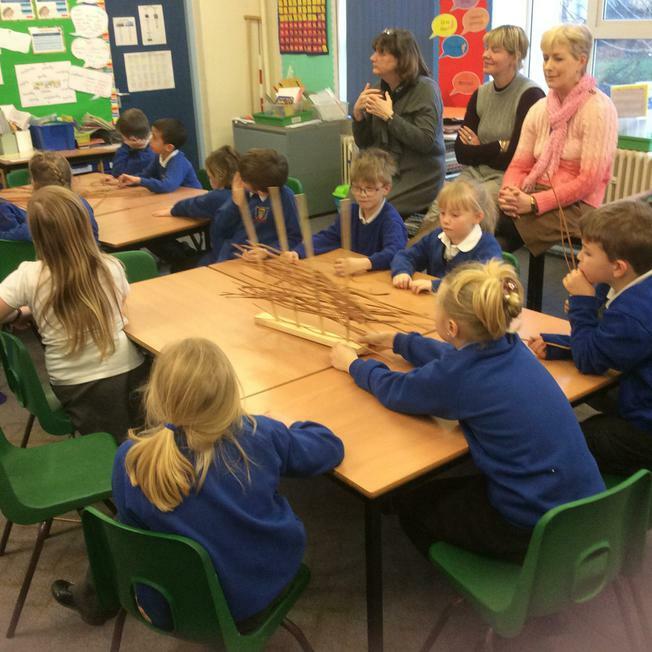 Parent support is much appreciated and we also feel it helps as parents to have an idea of what’s going on in class. If any child is struggling with their homework our door is open to help you to help them. 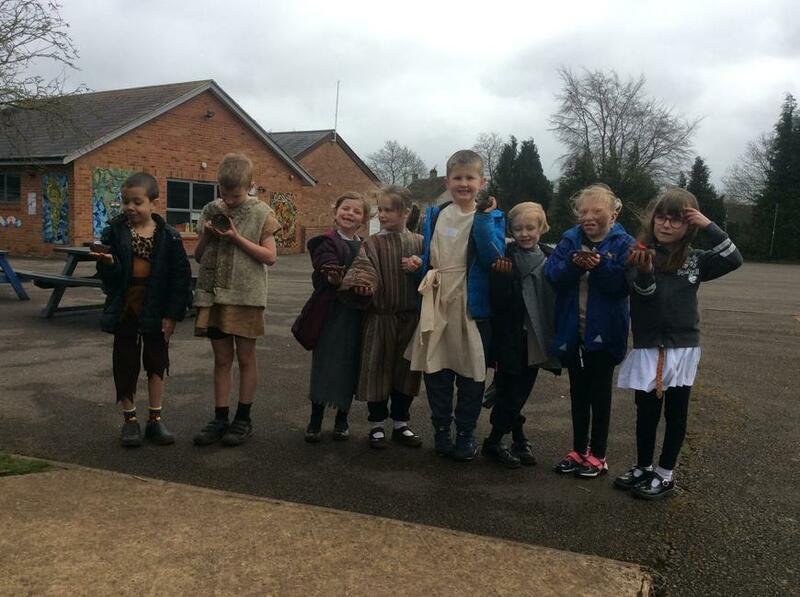 The weather is cold, please make sure the children have a warm coat for break and lunchtime. Lots exciting things coming up including a trip to the library to meet an Author at Chippenham Town Museum. The children should have brought a letter home Friday that allows them to pre-order a signed copy of the book that will be shared with us at the event. Regular home reading continues to be important to all children as the more that they read the better understanding and choice of vocabulary they have as writers. We have a class incentive that is encouraging them, 4 times at home to an adult in a week will enable them to get a merit on their merit card. Please can you support them with this by remembering to sign in their record books when they read. Thank you for your support. 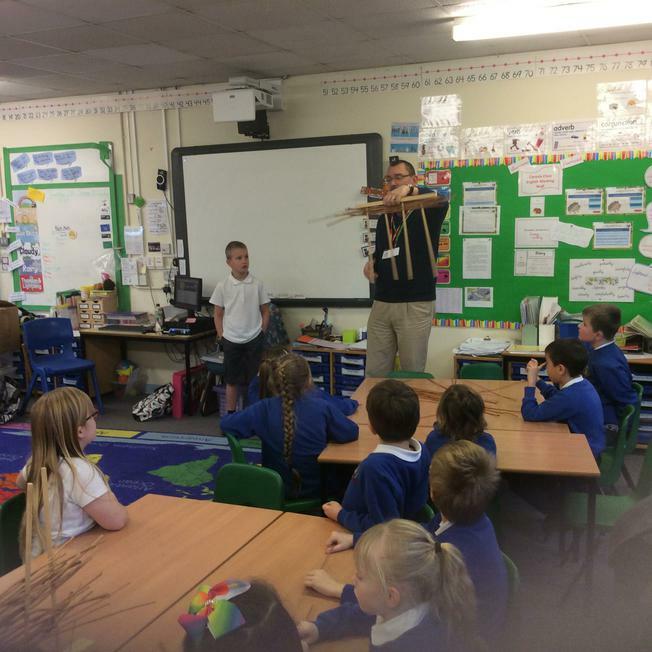 We have launched our 'Scavengers and Settlers' topic with an interesting Workshop led by Andrew Skelton a historian from Chippenham Museum. 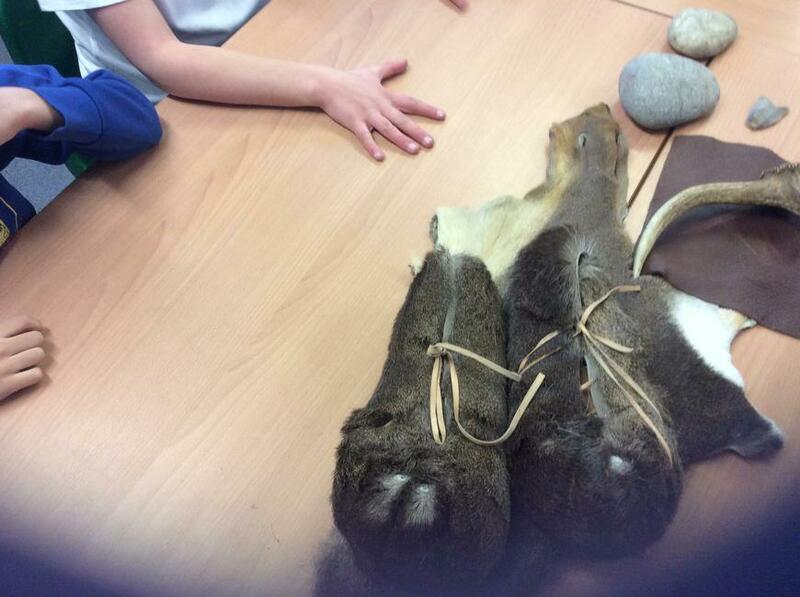 He introduced us to the Stone Age and brought in artefacts for the children to observe and ask questions about. 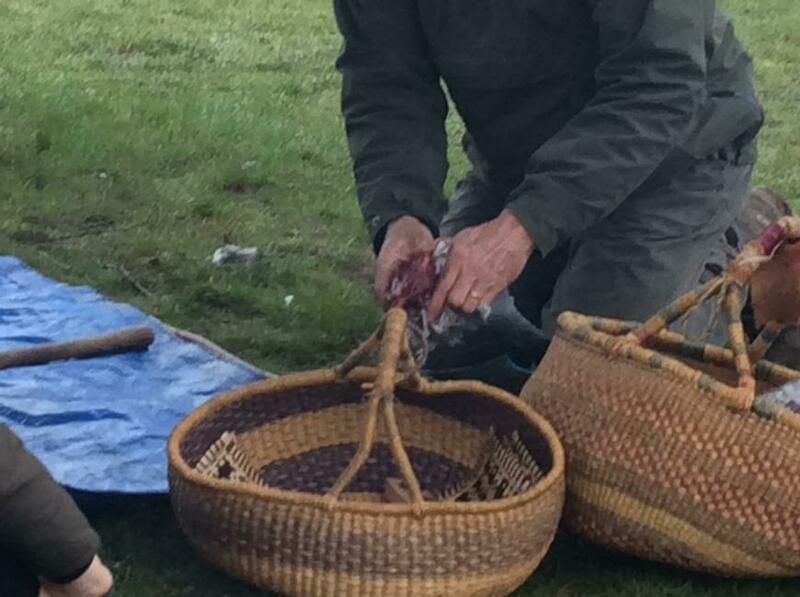 They also had a go at weaving. 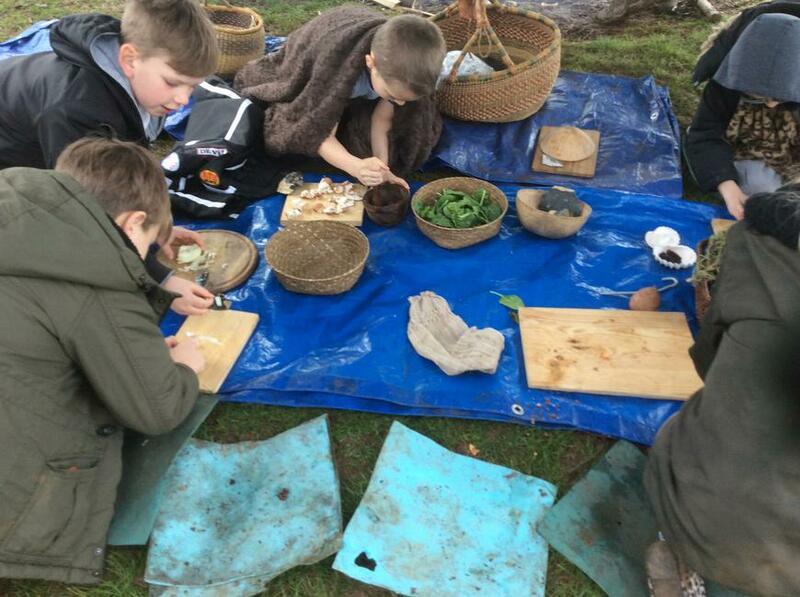 We are all looking forward to finding out more about this interesting period of history and have lots of exciting activities planned to gain first hand experiences for ourselves. 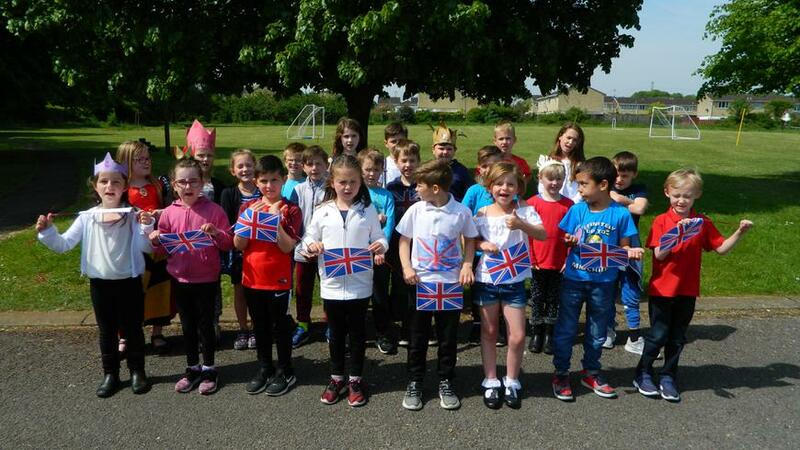 Thank you for all the home support that the children got with completing their project about a country. 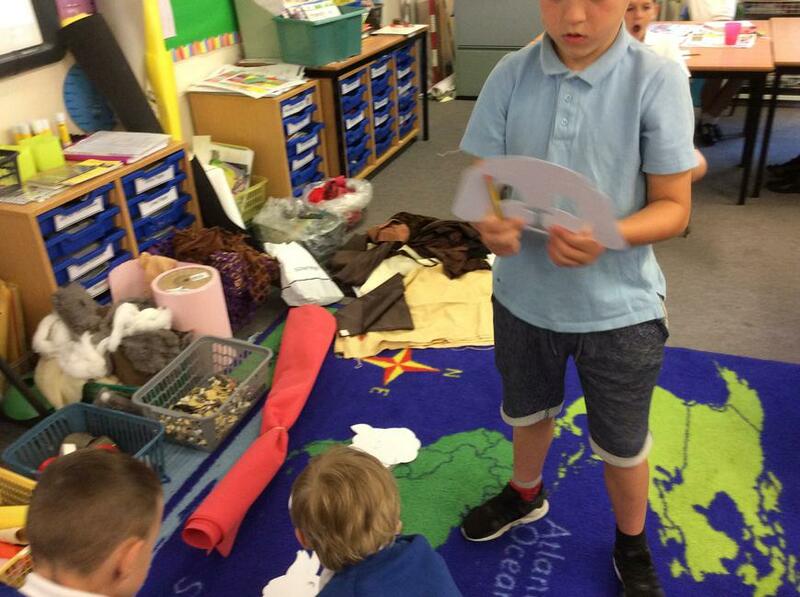 We travelled all around the world as class and enjoyed hearing interesting facts about the different countries. 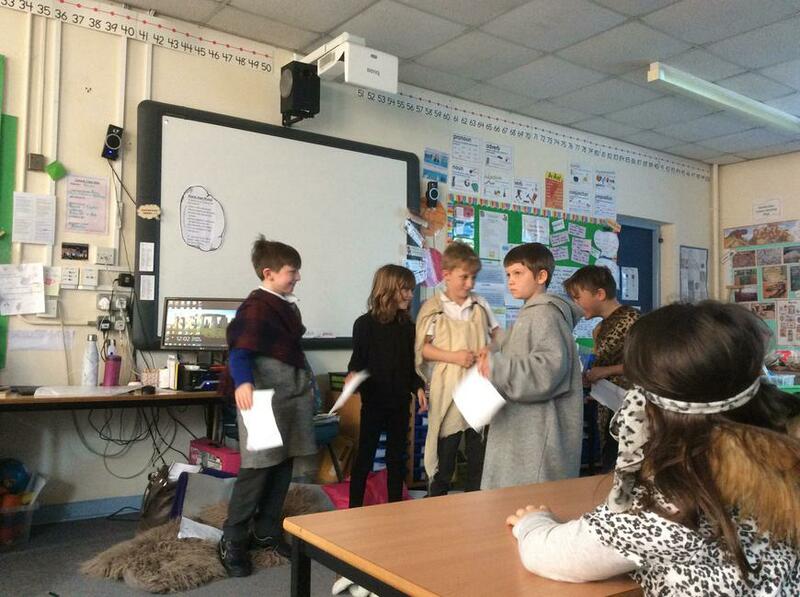 The children have improved in their presentation skills and seem to really enjoy standing up in front of the class to share their learning. Their personal confidences and speaking and listening skills are definitely improving. 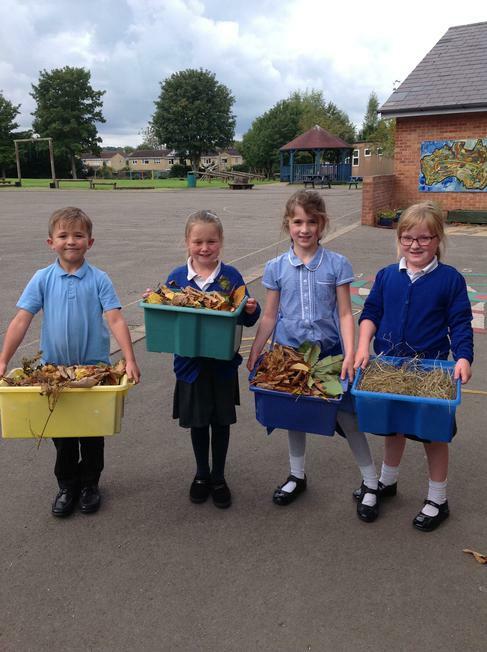 They all enjoyed receiving golden book entries for their work and these were definitely deserved. It’s been business as usual in Canada class with a few added Christmas extras. Our special visitor in class 'The Elf' has been creating mischief but also reminding us to do our learning. Not only have children been writing diary entries as Max’s friend, they have also been learning how to use past and future tense in one piece of writing. 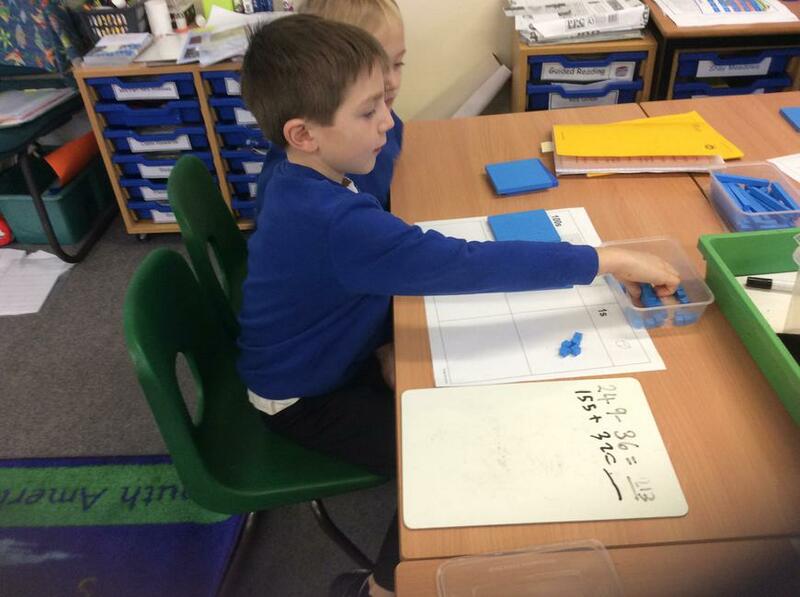 Adding and subtraction using the compact method is progressing well. Can you please help and remind the children to keep learning their times tables. Work on learning x2,x3, x4, x5, x10 and the related divisions. Those that need a challenge can start learning 6,7,8x tables. We have been playing games in football to help improve our skills. 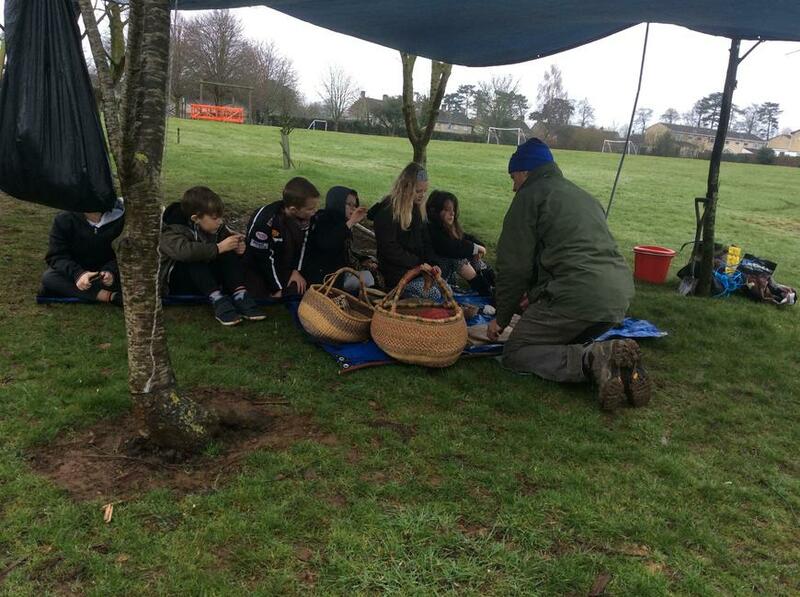 We have also been really lucky to have two trips to Hardenhuish for sporting activities. I’m sure the children have been excited to tell you. 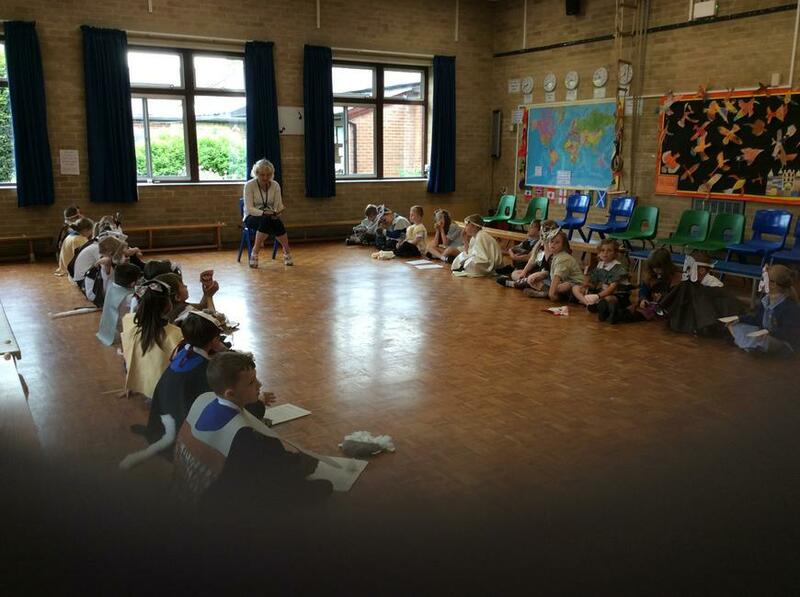 As Y3s the children sang beautifully at Ladyfield Church especially as this was the first year as part of the main event. We are looking forward to the class parties next week and the final week at school for 2017. 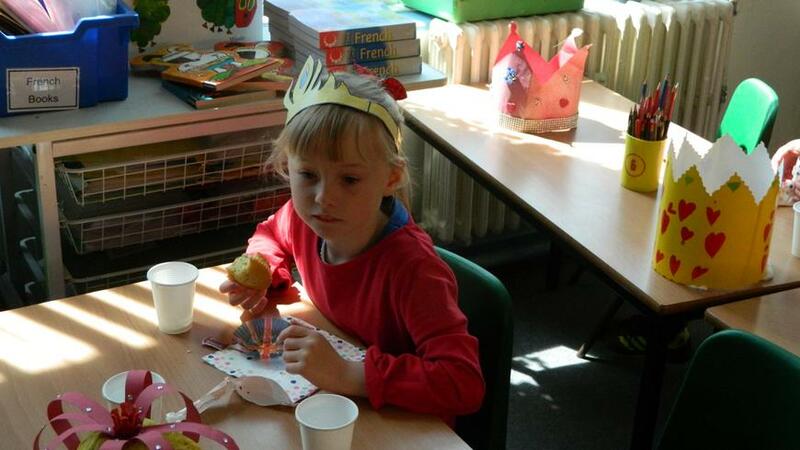 Wow the last few weeks have flown by and the children are starting to get busy as the month of Christmas approaches. We are learning some lovely Christmas songs to sing at the church (details to be announced soon and song words to come home Monday). 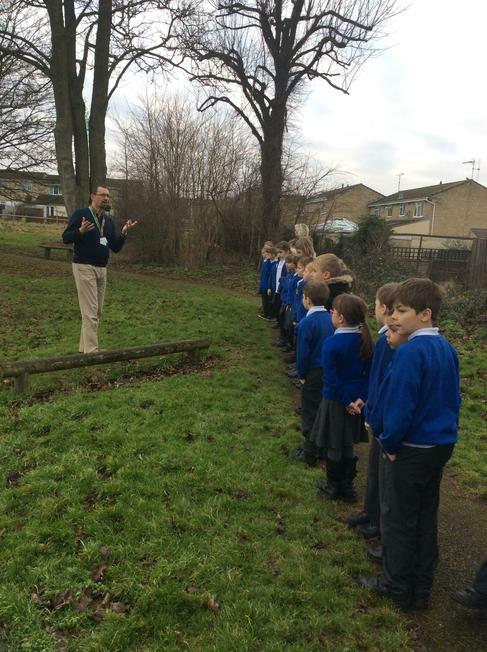 We have been improving and learning new football skills with Mr Kingwell this term. 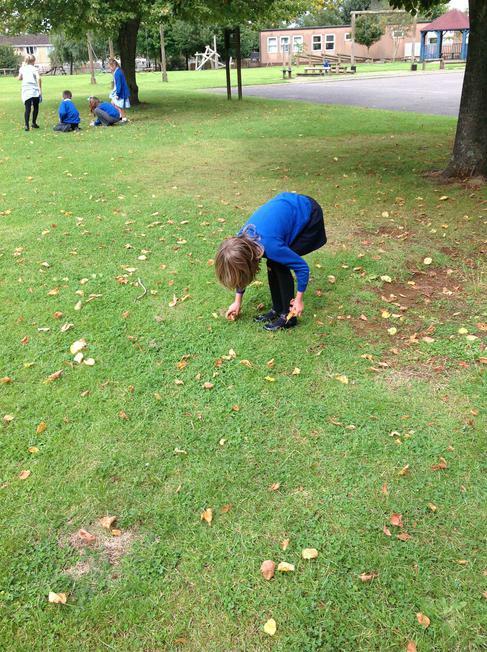 It is recommended that the children wear trainers for outside PE as daps get too wet. As its getting cold we suggest that children bring a plain black/blue hoodie style top and wear jogging bottoms. 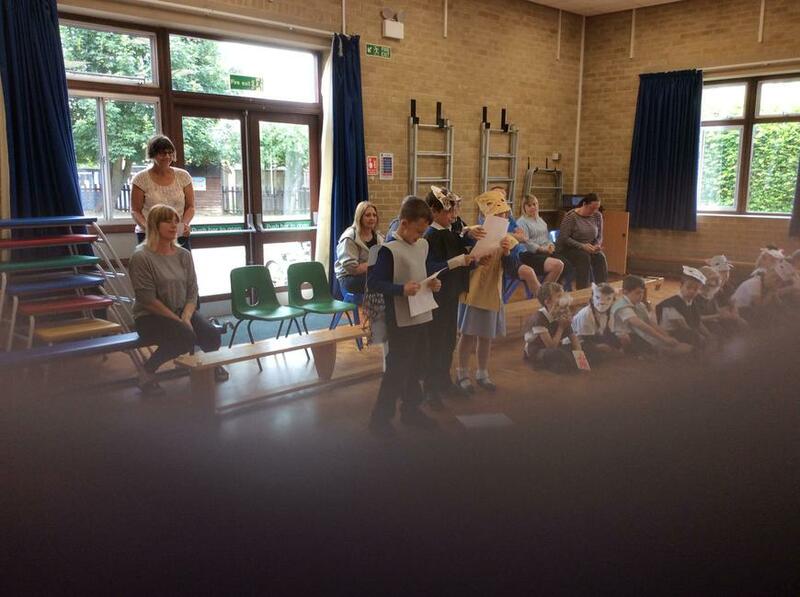 We have been lucky to go swimming this term and the children are making steady progress. 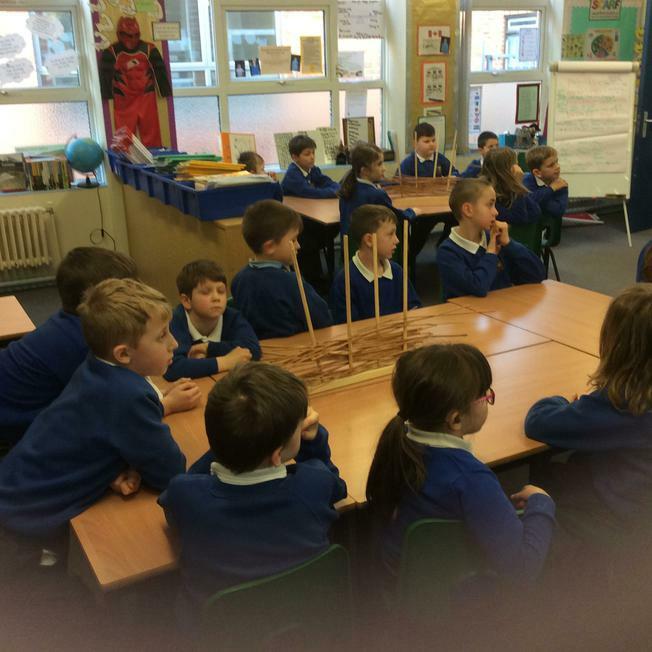 Anti-bullying week led to some interesting class discussions and helped children define bullying and how we can stop it. 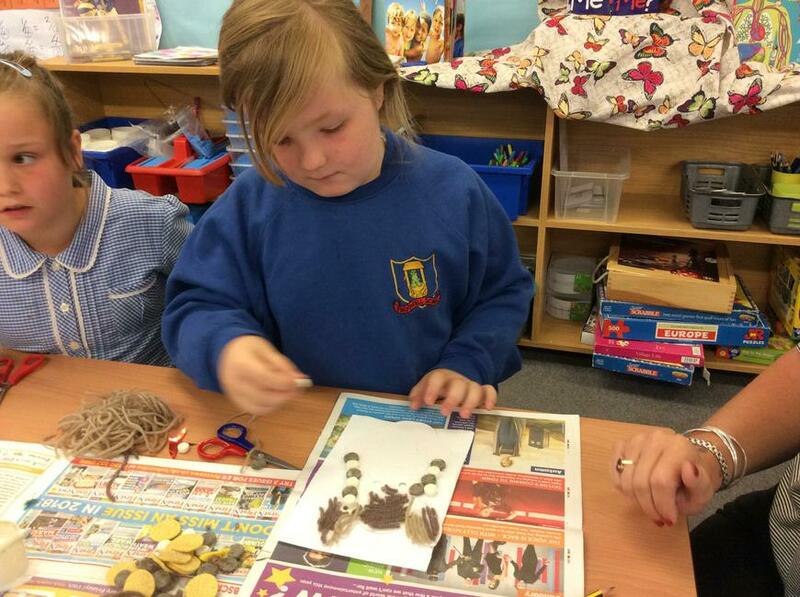 In the next few weeks children will start making crafts to sell at the Christmas Bazaar. We are missing Mrs Farr who is currently off sick and the children have made her a lovely card. Next instalment of Canada class will follow shortly. 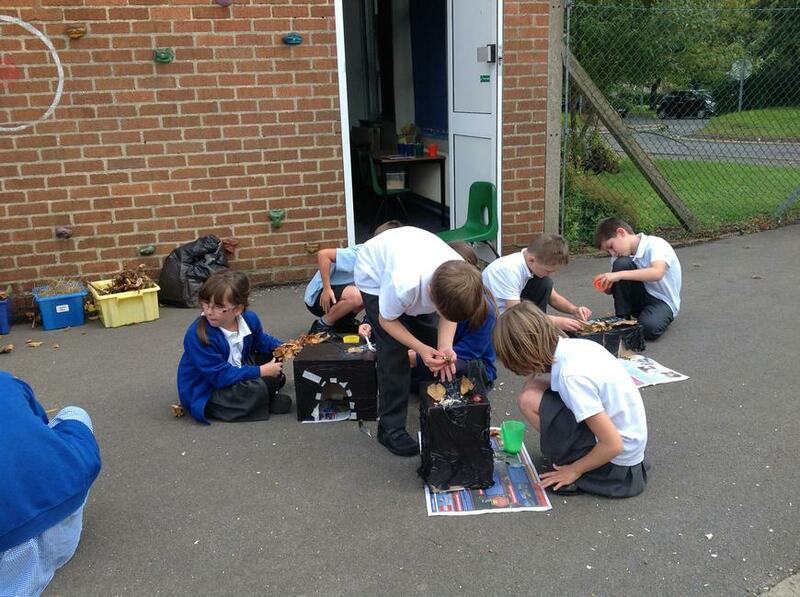 We have had a really busy term so far and have been really trying hard with our learning. 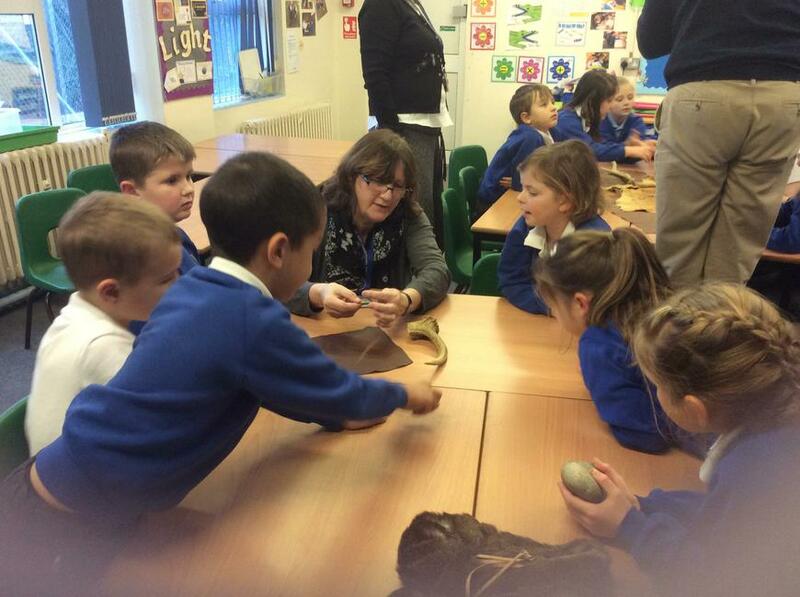 We have enjoyed a visit from the Life Van where we took part in a session called 'Meet the Brain.' 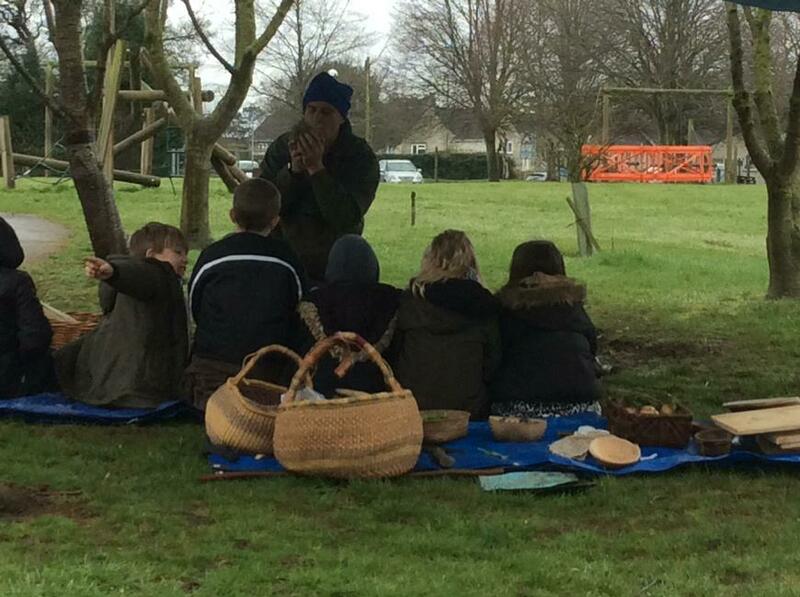 We got to meet Harold again and especially enjoyed hearing his 'Friends' song that we are now learning in class. 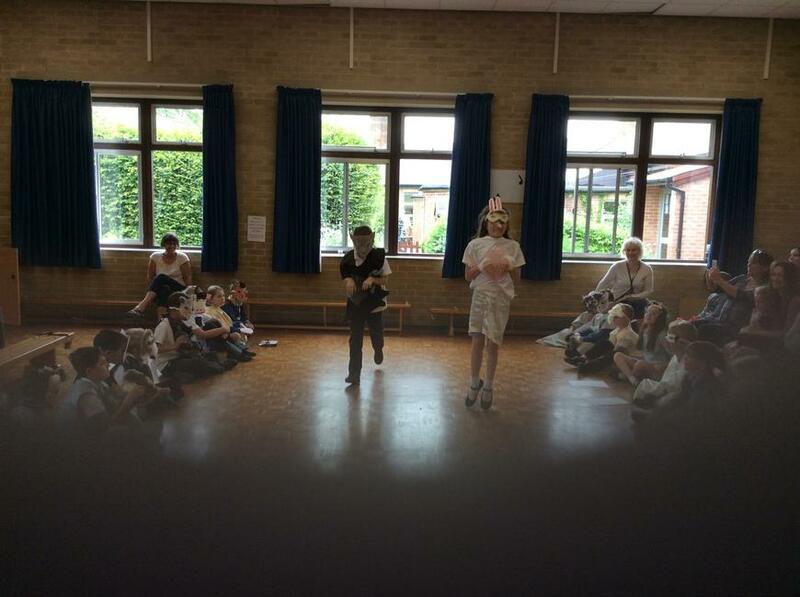 The children were praised for their enthusiasm and also the quality of their questions and answers. 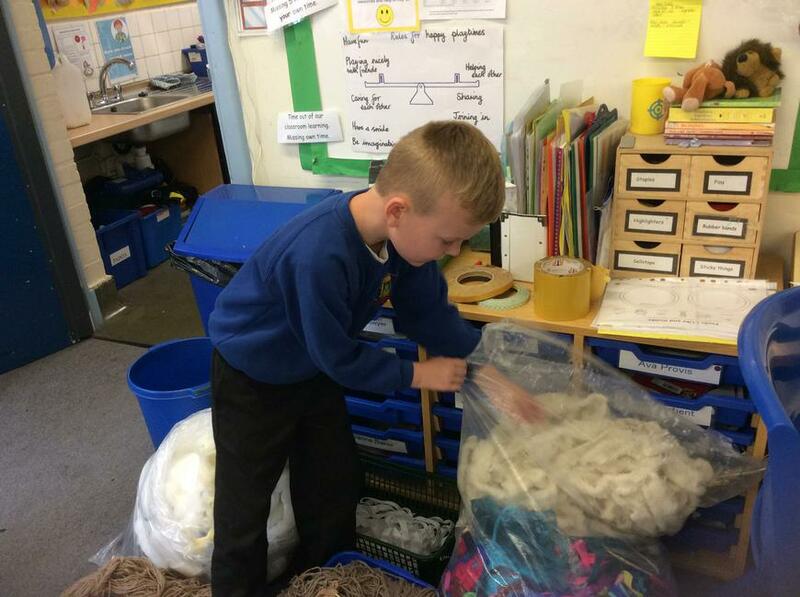 The Life Van fits directly with the new PSHE Scheme that we are using called 'SCARF' We have a class floor book where we record our learning so please feel free to come into class and have a look. 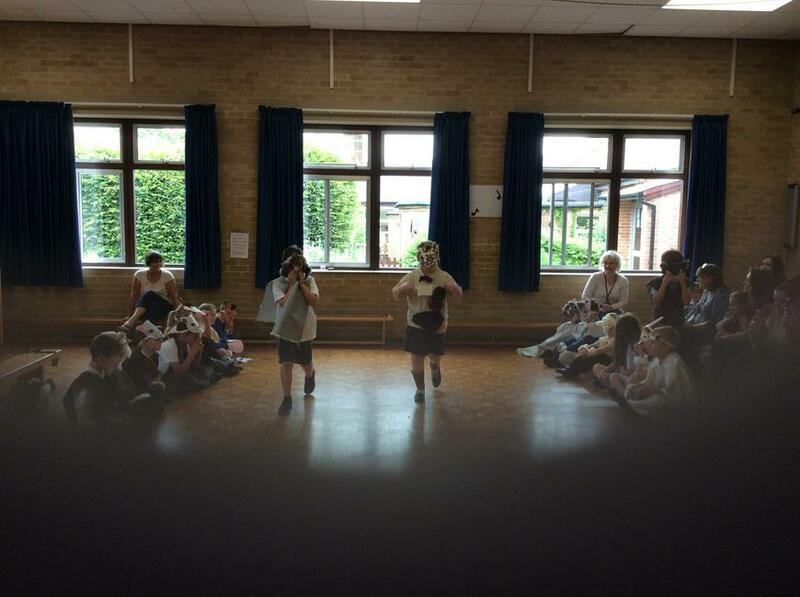 'Children in Need' - we enjoyed coming to school in our pyjamas and bringing our teddies as well. Thank you for all your contributions towards this worthwhile cause. 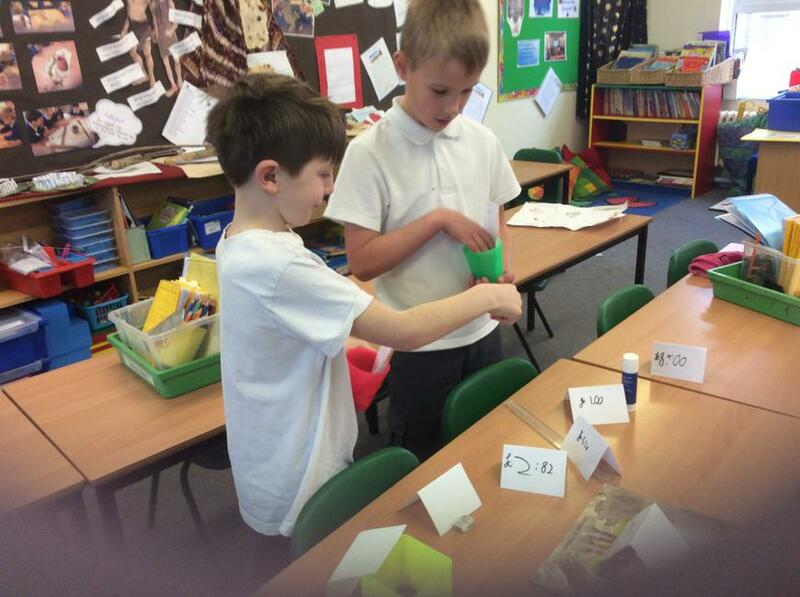 In Maths we have been using practical apparatus to support our understanding and vocabulary use in our Addition and Subtraction learning. Next time you cross the road together make sure that they use their instructions to help you keep safe. Don't forget to use the imperative 'bossy' verbs and also the adverbs that we have been using in our writing. Say your 'safety tip' as well for extra safety. 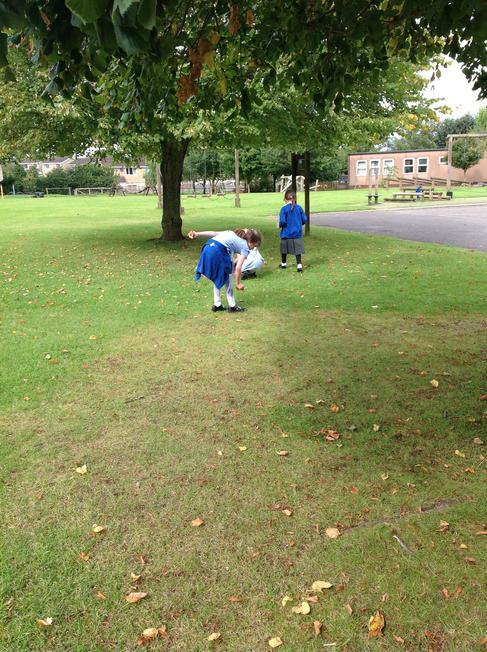 In our English learning we have had a focus on writing instructions about how to cross the road safely. This involved us practically going out to cross the road and the Zebra Crossing near school. Canada Class has had a busy first term. 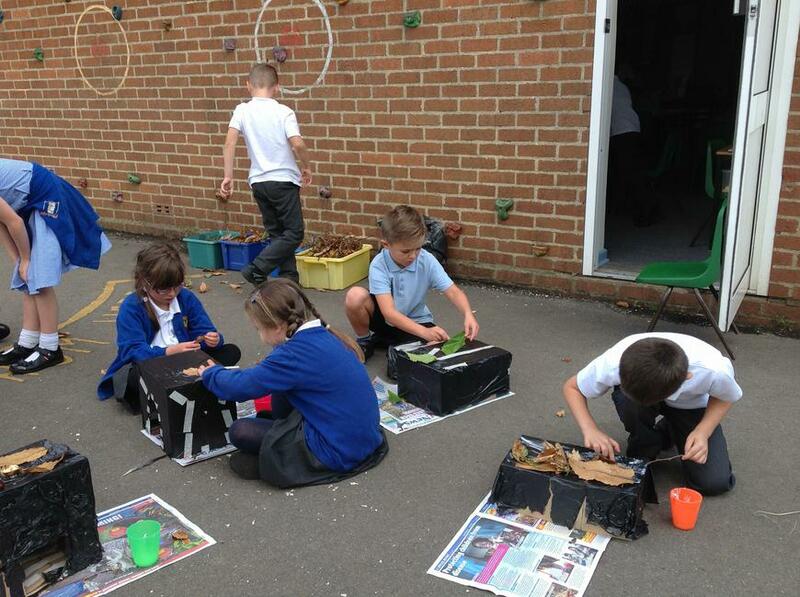 The children have been working hard and are settling in well to Key Stage 2. 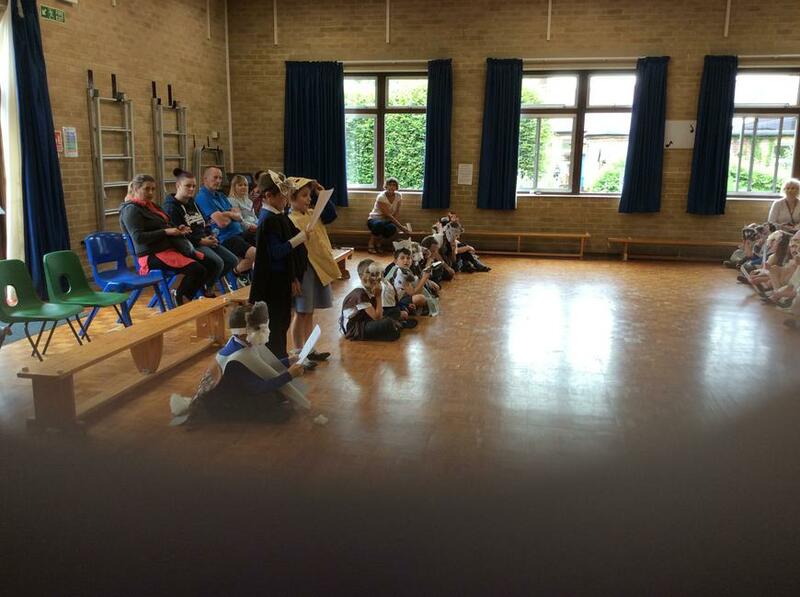 English learning has centred around 'The Hodgeheg' book with a focus on developing settings, characters and story plots. 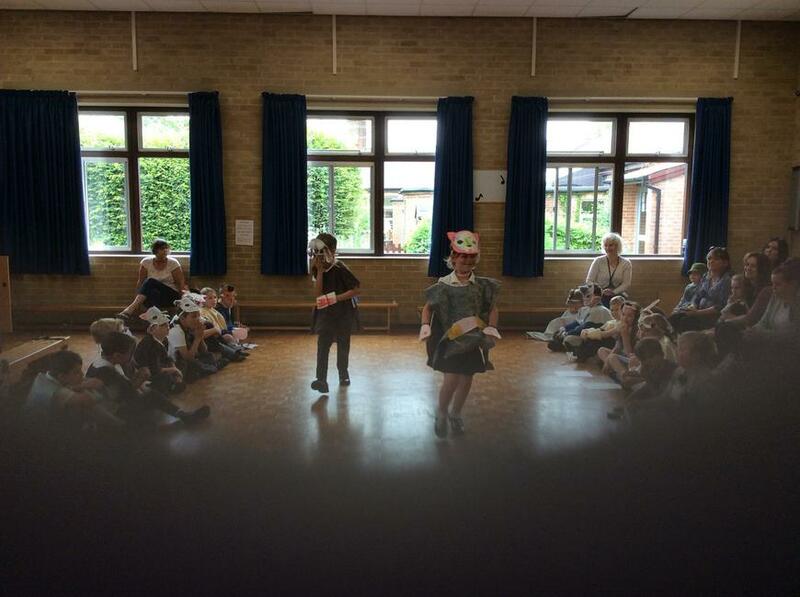 The children worked hard to write their own innovated versions of the story which involved Max being bumped whilst crossing the road in a different way. 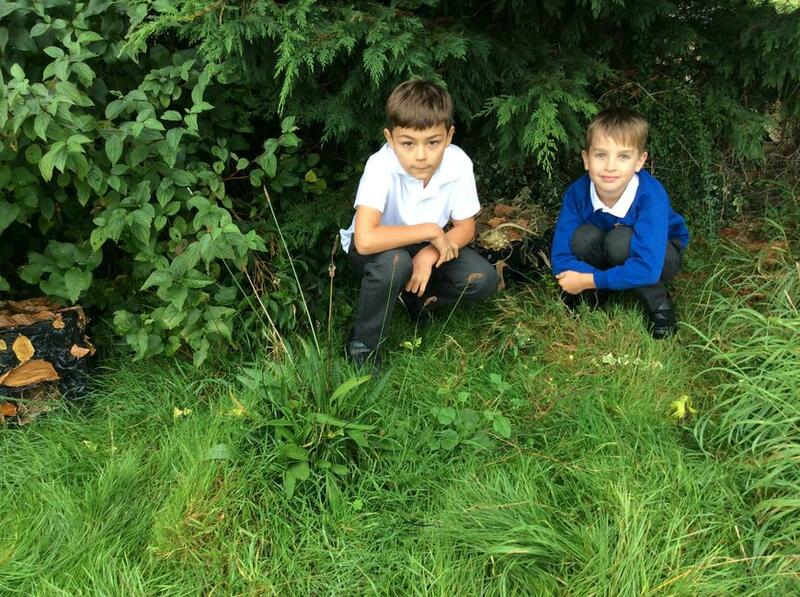 In Science, we researched the habitat, food and living conditions that hedgehogs need to survive in the wild. 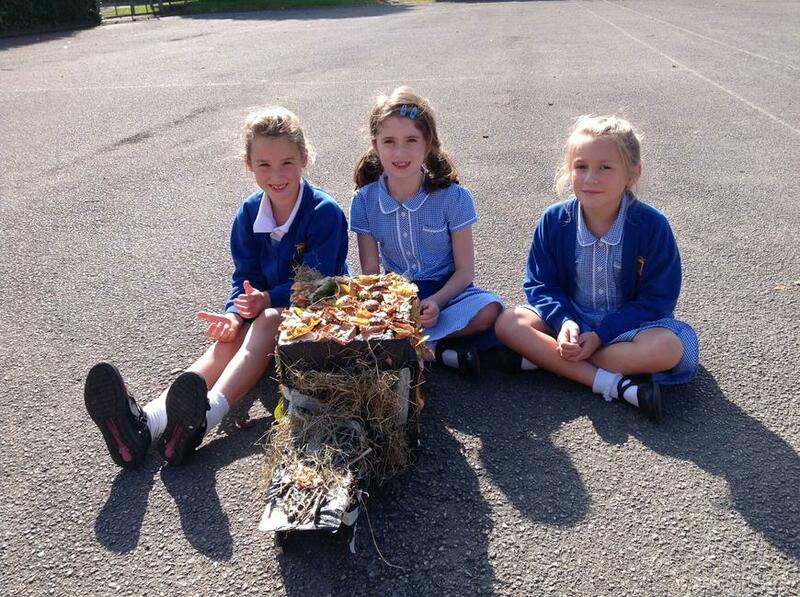 This involved us designing and making our own Hedgehog houses that we have placed in the school grounds. Maybe some of them have hedgehogs using them now? 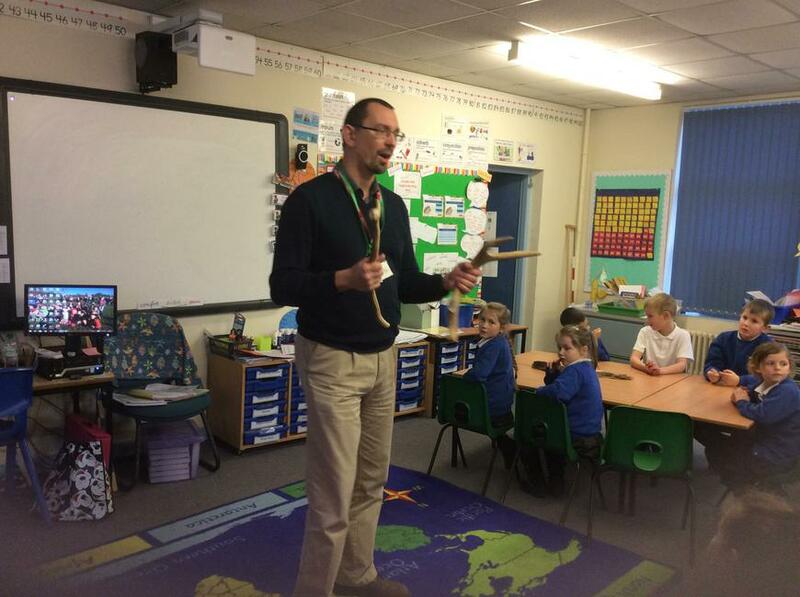 Healthy Eating has been a school focus and has included a visit from Mike, the Healthy Me Coordinator and also a visit from the school dentist to encourage us to look after our teeth and choose more healthy snacks. Hopefully you have been putting your toothbrush and toothpaste to good use. 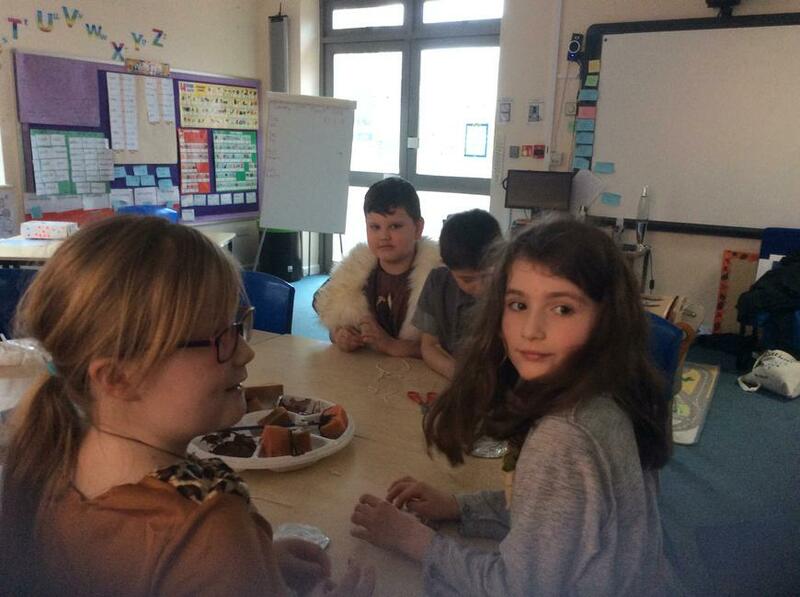 We have been looking in detail at the 'Eatwell Plate' and worked in groups to plan healthy party food. We will be continuing to promote more healthy food choices in term 2. 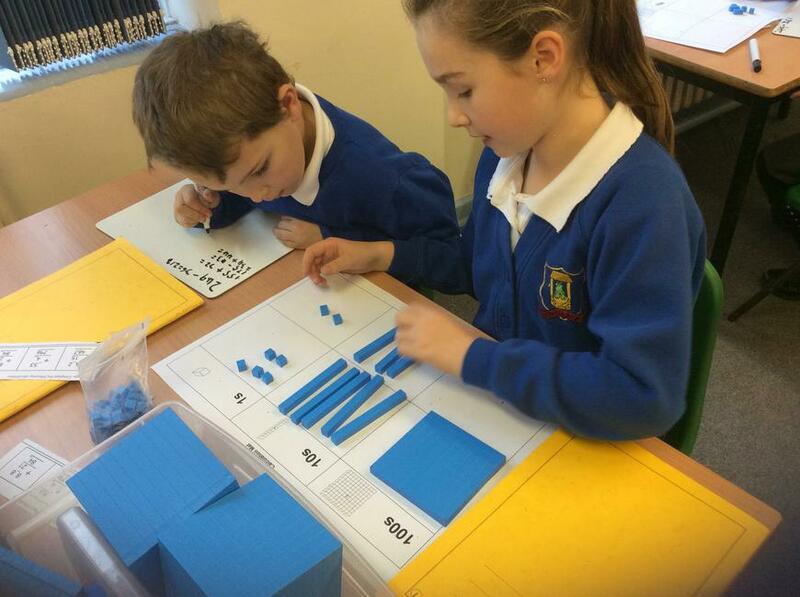 Maths learning has focussed on the areas of Place value and Addition and Subtraction. We are now using the White Rose Resources to inform our planning which is encouraging the children to develop their problem solving and reasoning skills. 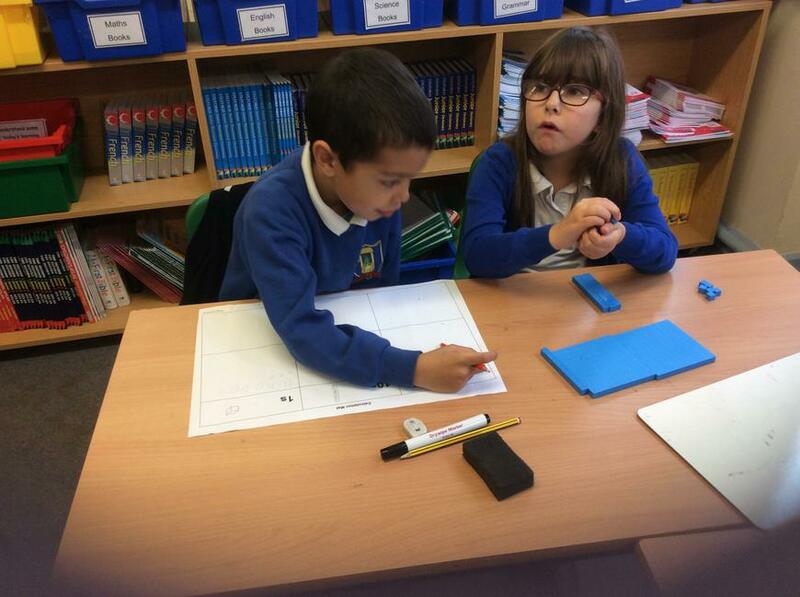 Fluency Friday is taking place weekly and the children are enjoying working on improving their number and table recall. 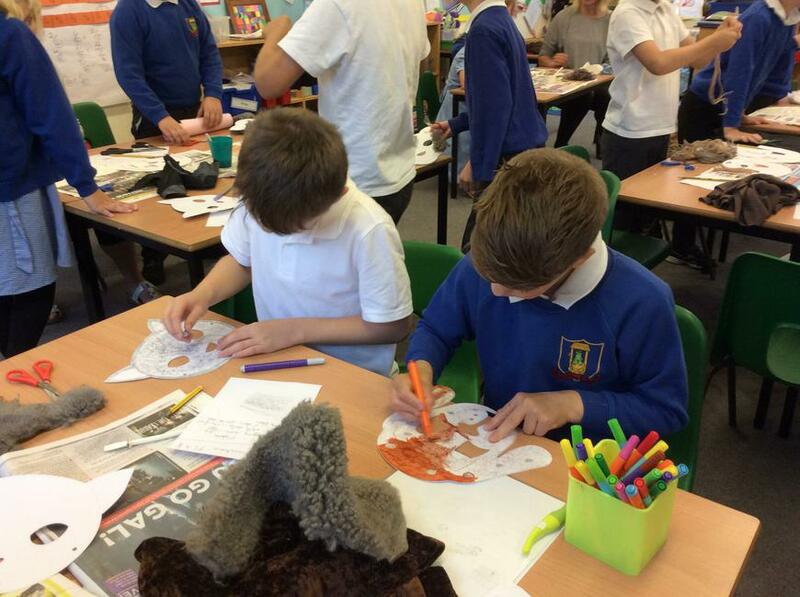 We have spent some time in our Geography learning finding out more about our country name Canada. Your child should be able to tell you some key facts about the country as we spent time researching using an internet website. 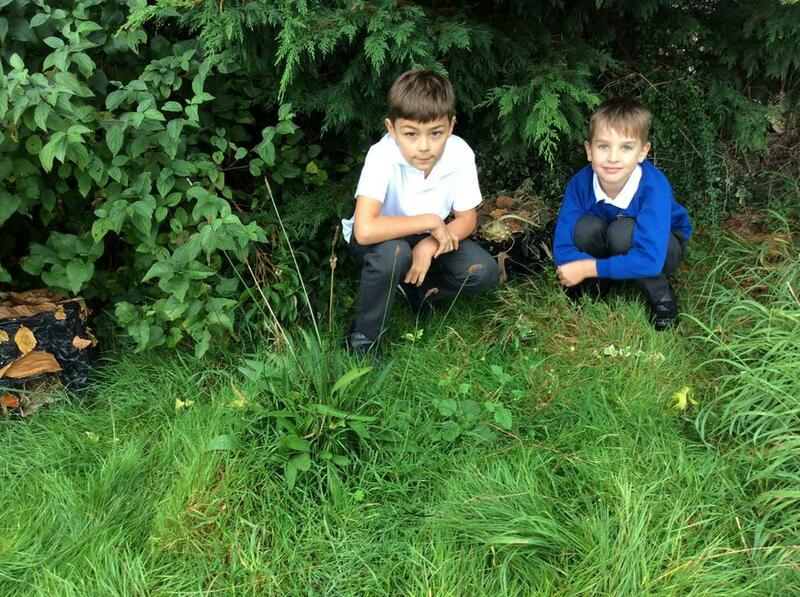 We found out that 2 children in our class, Mckenzie and Logan have names which directly link to places in the country. I wonder if they can tell you why? Thank you for all your support with the weekly homework it is appreciated. 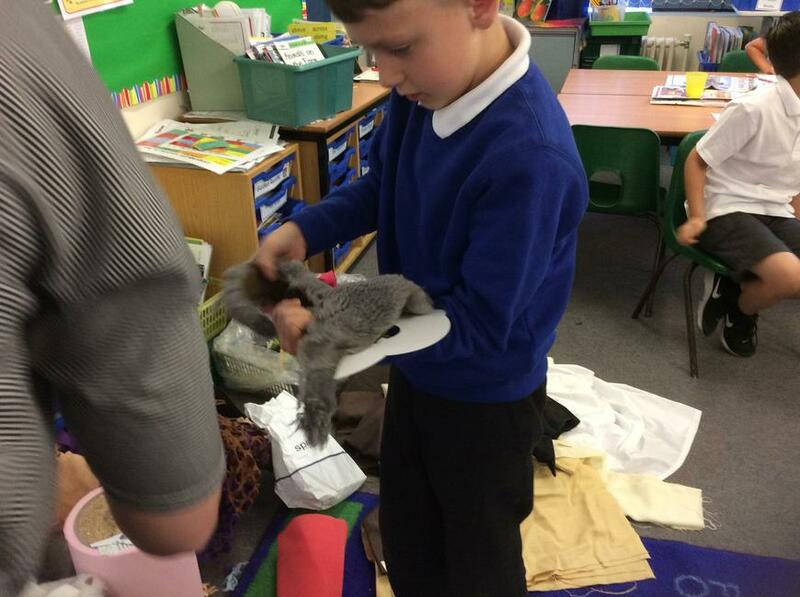 We enjoyed sharing the book related home learning tasks that the children brought into school at the end of Term 1. 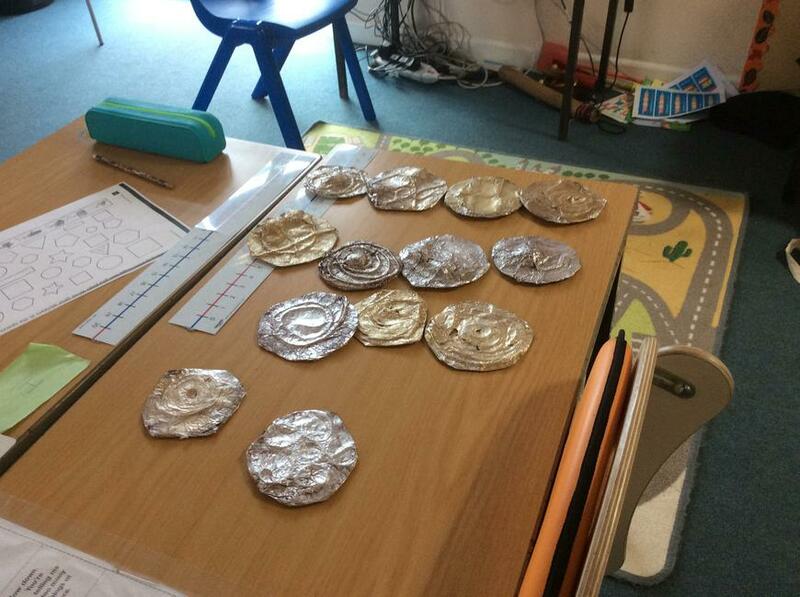 The children showed good confidence when presenting these to the class and we were impressed with the time and effort that had gone into completing them. These included pictures, posters, models, research and a power point presentation. 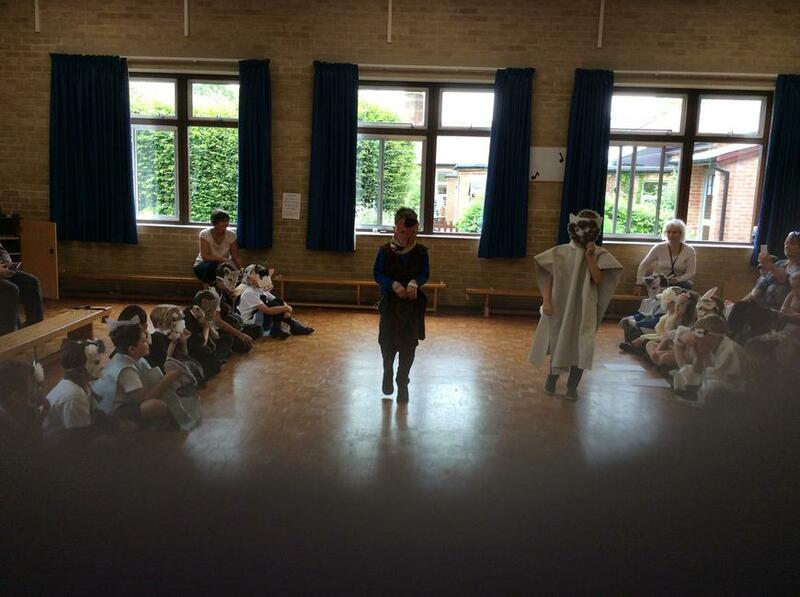 The children were rewarded with merits for their hard work. Welcome to Canada Class 2017 - 18. 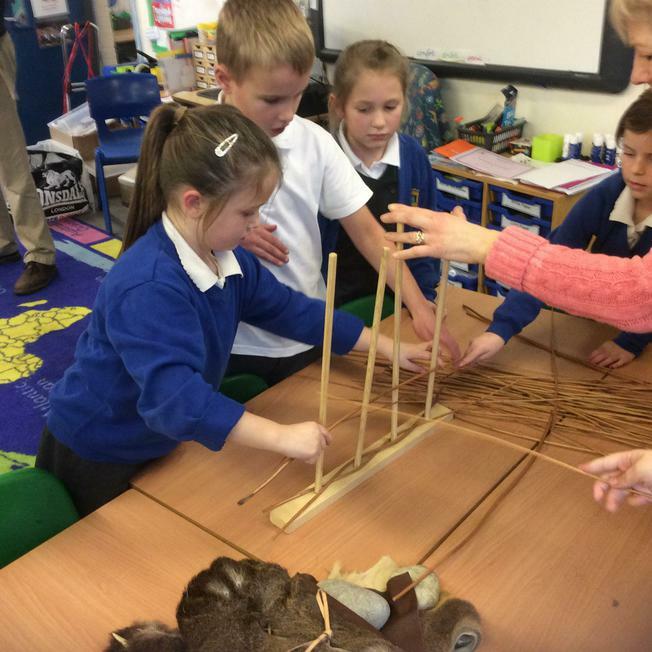 A warm welcome to Canada Class, Year 3. We hope you have all had an enjoyable summer break and are well rested and excited to start the new school year. We are really pleased to have the lovely teaching assistants Mrs Duncan, Mrs Gosal, Mrs Gostello and Mrs Barnard in our team during in the week. We are really looking forward to a fun year, with lots of new challenges and exciting things to learn.